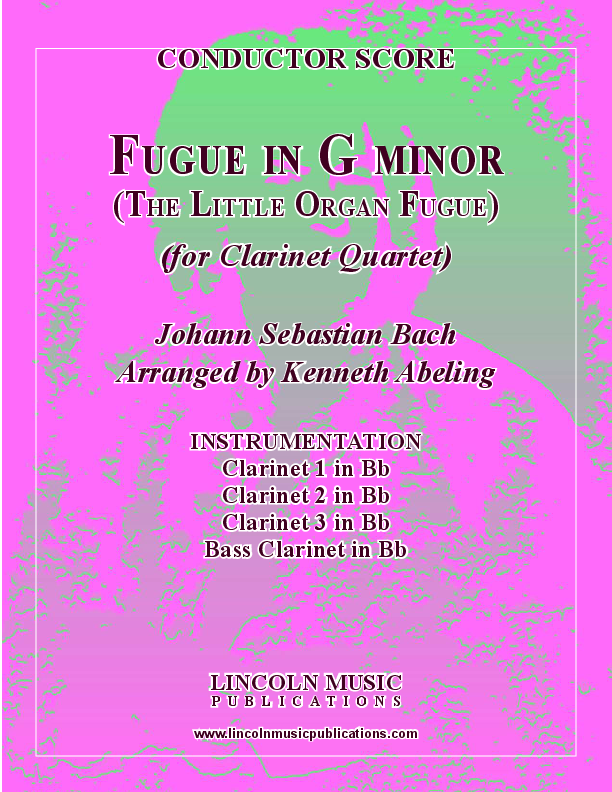 Fugue in G minor or “The Little Organ Fugue is one of Johann Sebastian Bach’s most popular fugues, transcribed here for Clarinet Quartet. 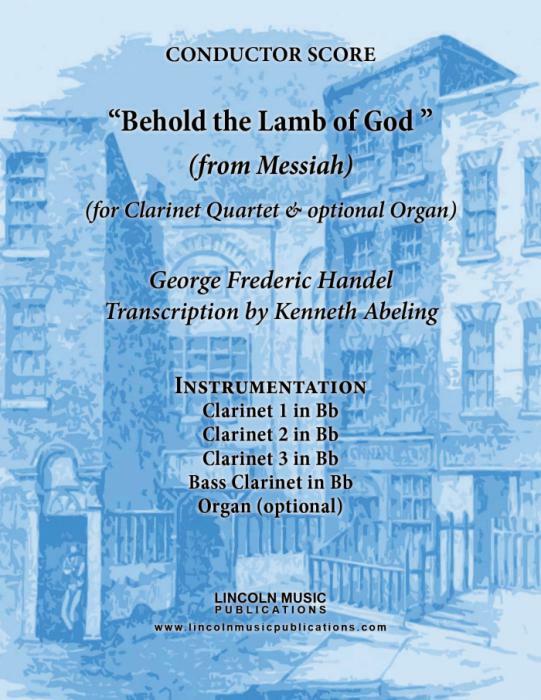 This transcription is both fun to play and challenging, is best suited for an advanced ensemble, and is appropriate for both secular and religious settings. 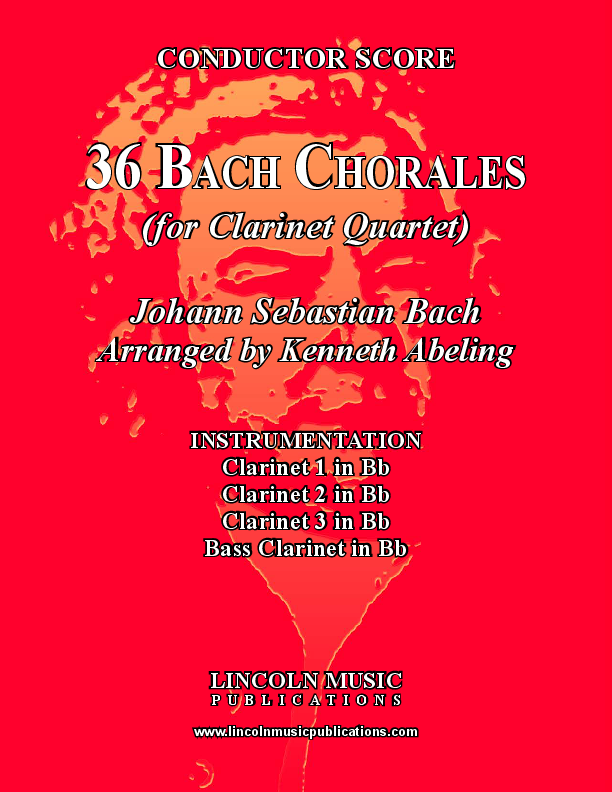 This is one of Bach's most recognizable compositions appropriate for weddings, Christmas and other religious and secular settings. Offered here for the Clarinet Quartet. 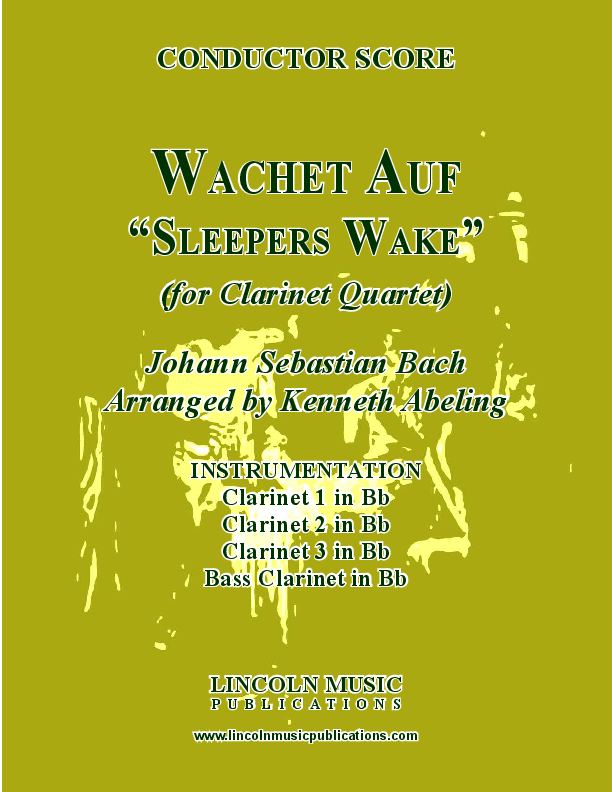 This is Johann Sebastian Bach’s very popular Wachet Auf or "Sleepers Wake" for Clarinet Quartet. 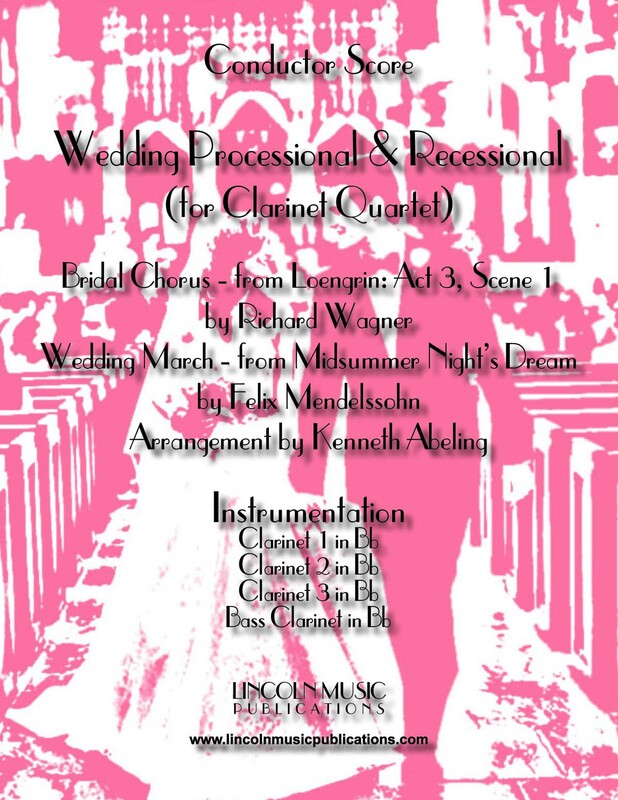 Audiences will recognize this very popular melody and this transcription has a variety of playing applications including Weddings. 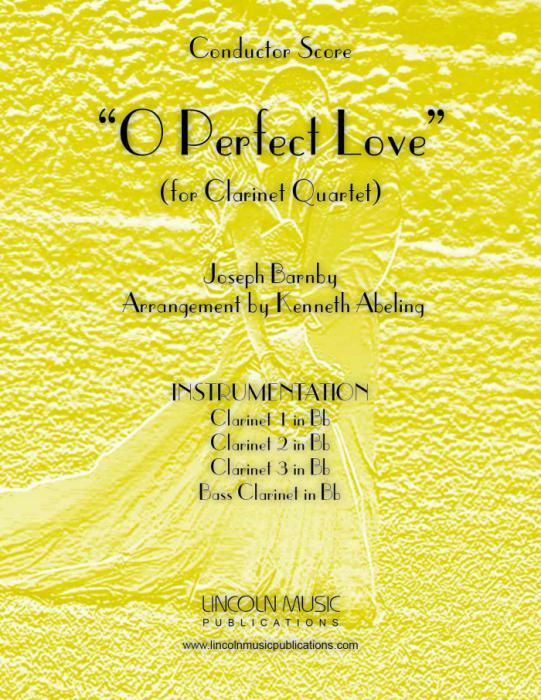 “O Perfect Love” by Joseph Barnby arranged here for Clarinet Quartet by Kenneth Abeling. 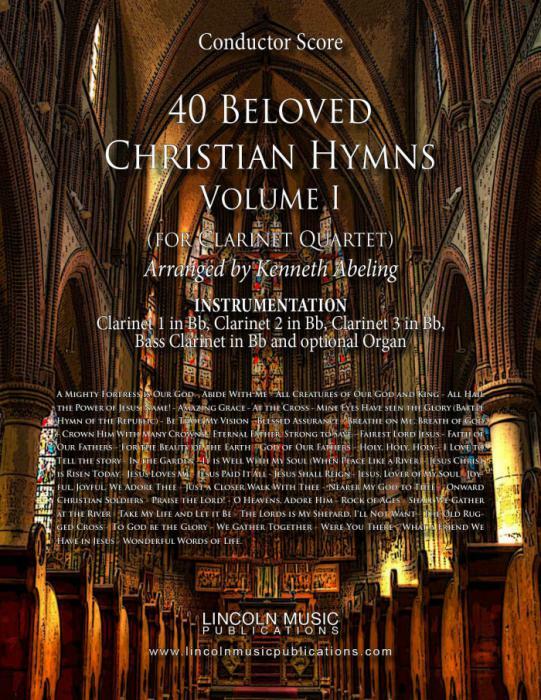 This is an easy arrangement of one the most popular Wedding Hymns of all time! 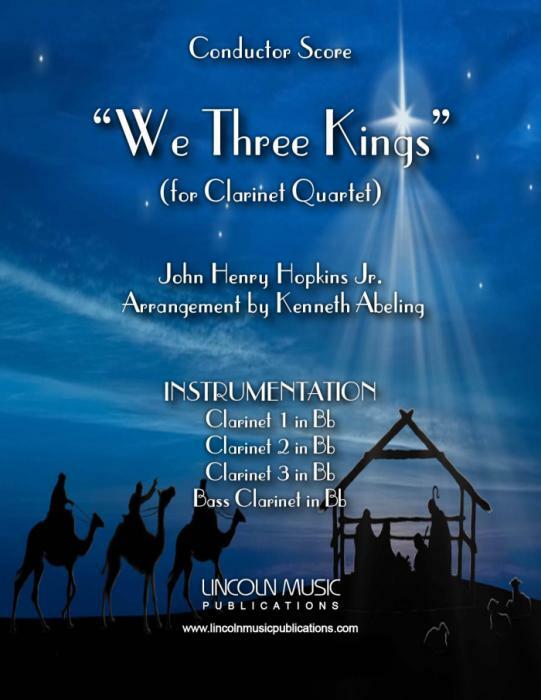 Trumpet Voluntary By Jeremiah Clarke arranged here for Clarinet Quartet. 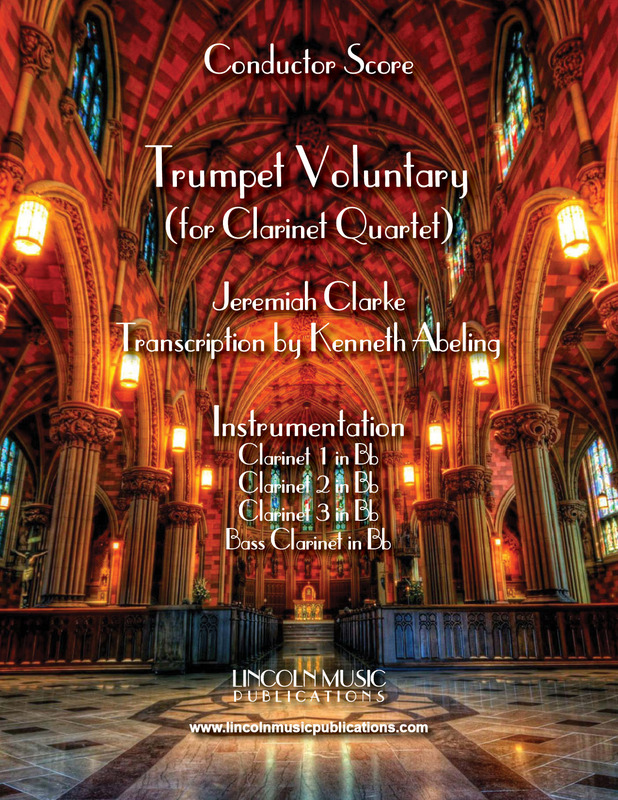 Perhaps Jeremiah Clarke’s most popular compositions, this easily recognizable piece is suitable for a variety of performance applications. 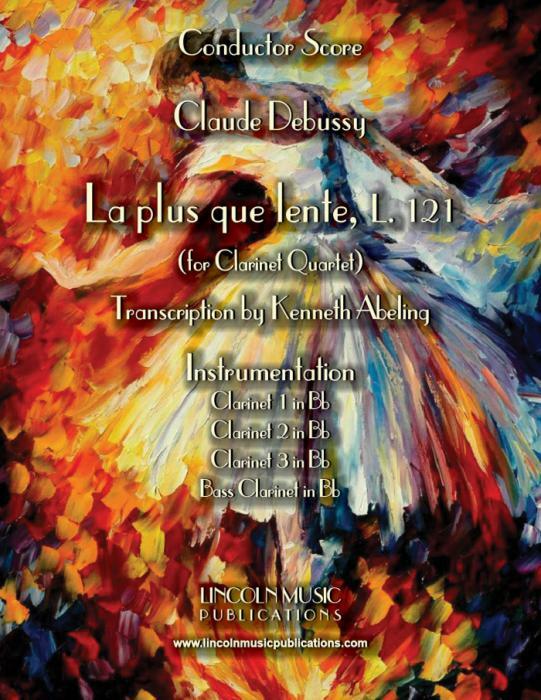 Debussy's Quartet in G minor, movement 1 is beautifully written and would be an excellent addition to an experienced Clarinet Quartet library but it is a challenge from start to finish! 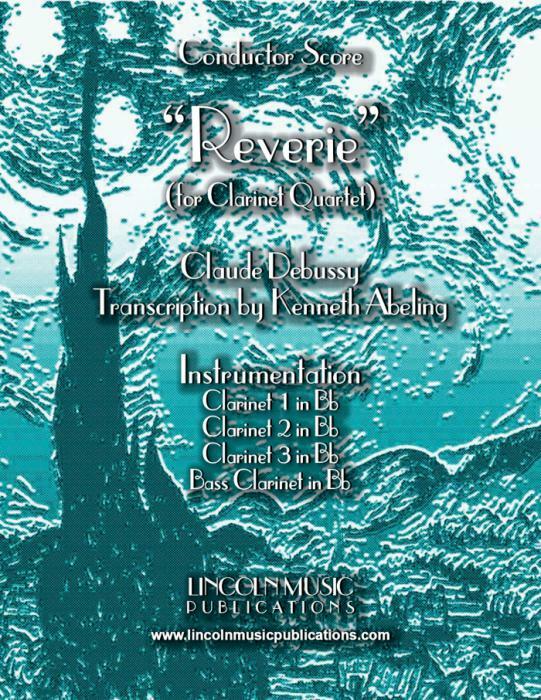 Claude Debussy’s Reverie transcribed here for Clarinet Quartet. This is an advanced intermediate transcription of a Debussy classic. 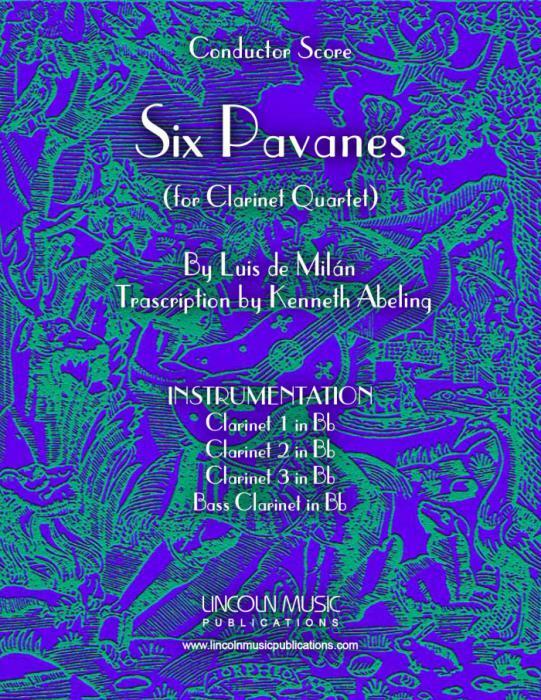 Originally written for two lutes, this transcription for Clarinet Quartet by John Dowland will be a great addition to you renaissance library. 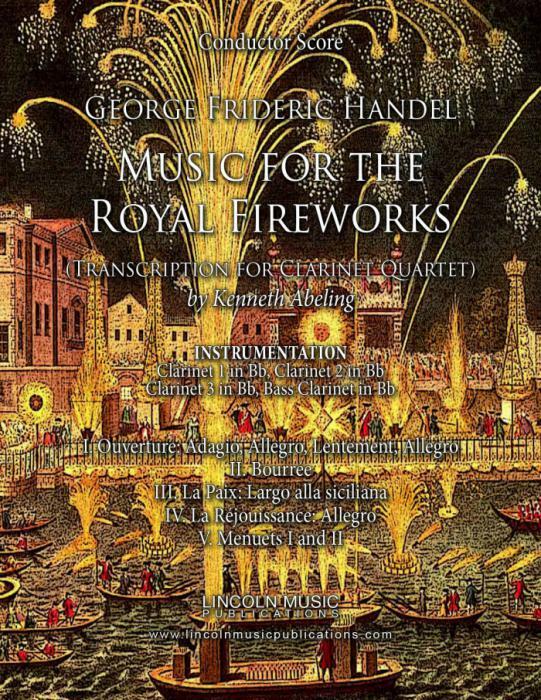 Fugue #1 in G minor 1 of 6 Fugues by G. F. Handel. 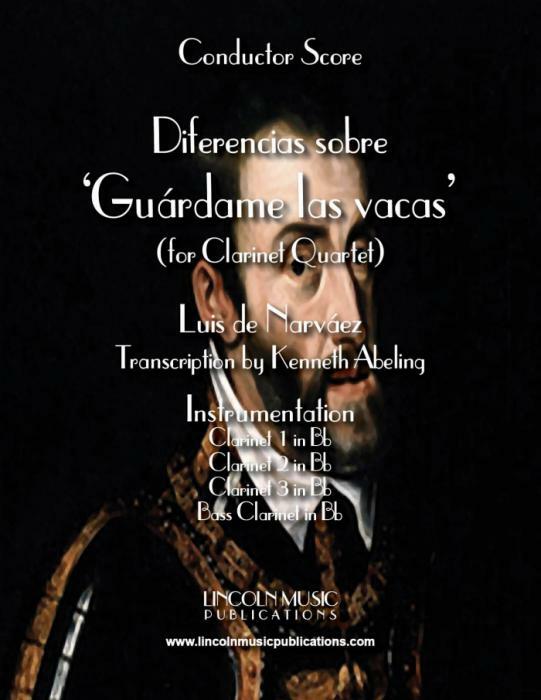 This transcription is for Clarinet Quartet. 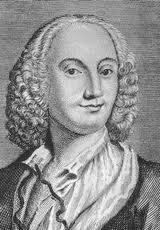 Fugue #2 in G Major 1 of 6 Fugues available by G. F. Handel. 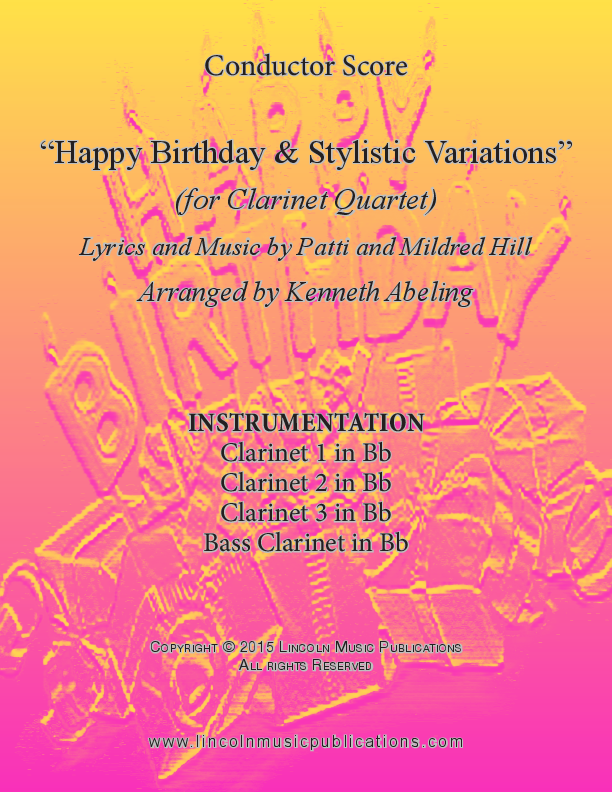 This transcription is for Clarinet Quartet. 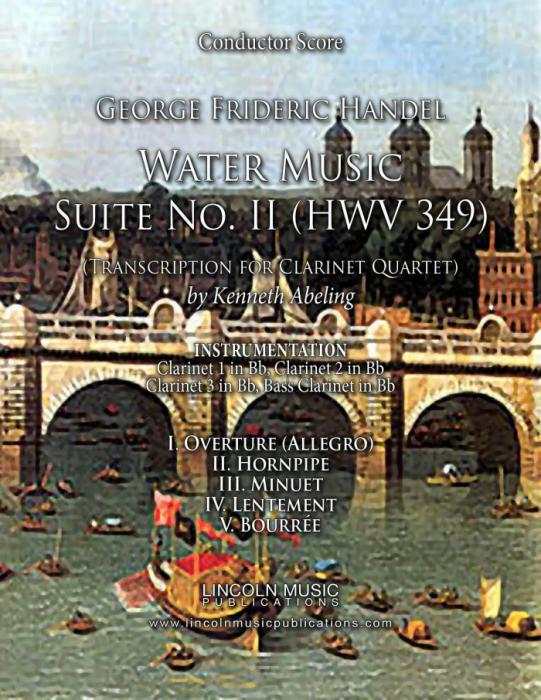 Fugue #3 in Bb Major 1 of 6 Fugues available by G. F. Handel. 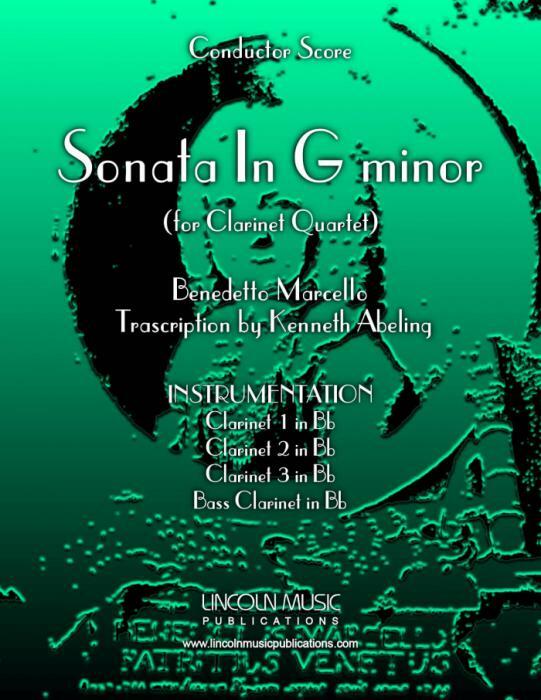 This transcription is for Clarinet Quartet. 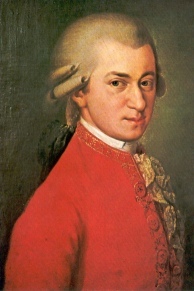 Fugue #4 in A minor 1 of 6 Fugues available by G. F. Handel. 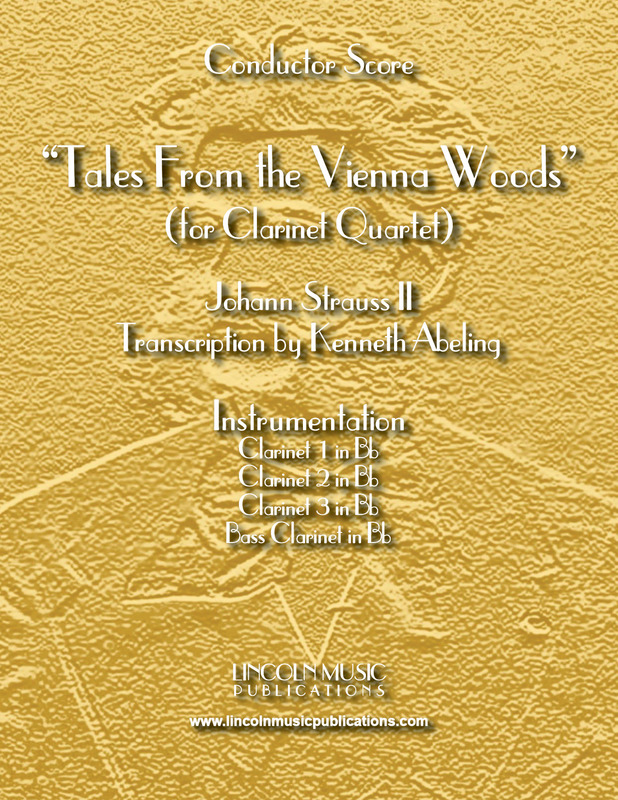 This transcription is for Clarinet Quartet. 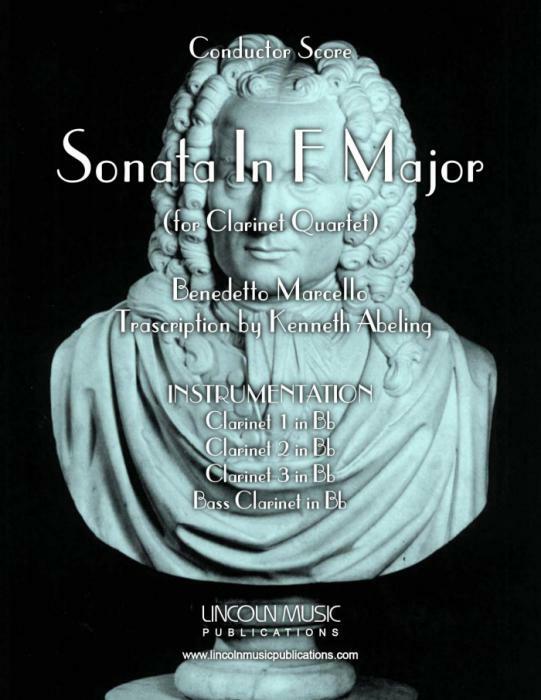 Fugue #5 in B minor 1 of 6 Fugues available by G. F. Handel. 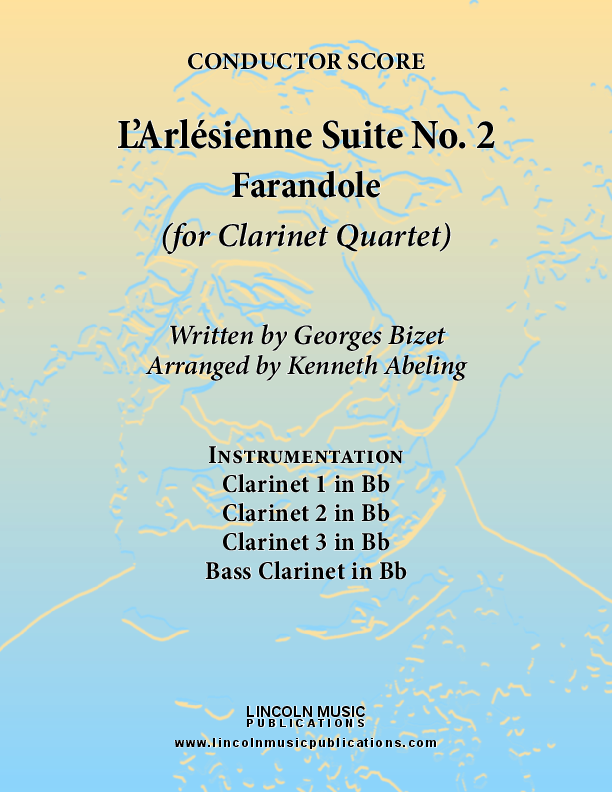 This transcription is for Clarinet Quartet. 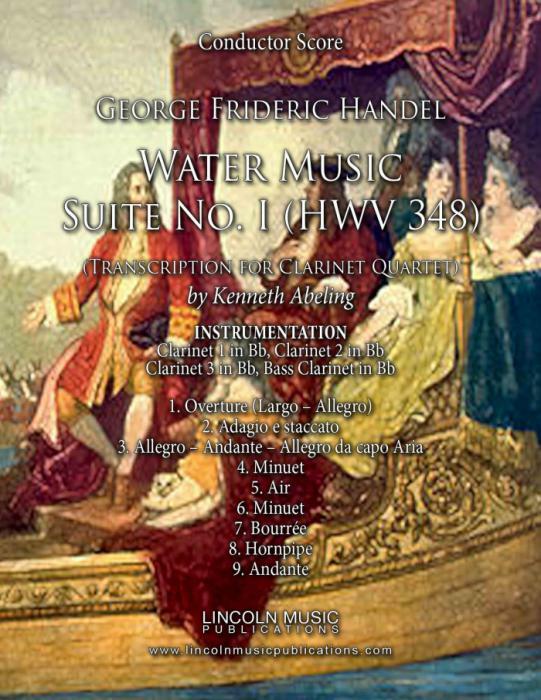 Fugue #6 in C minor 1 of 6 Fugues available by G. F. Handel. 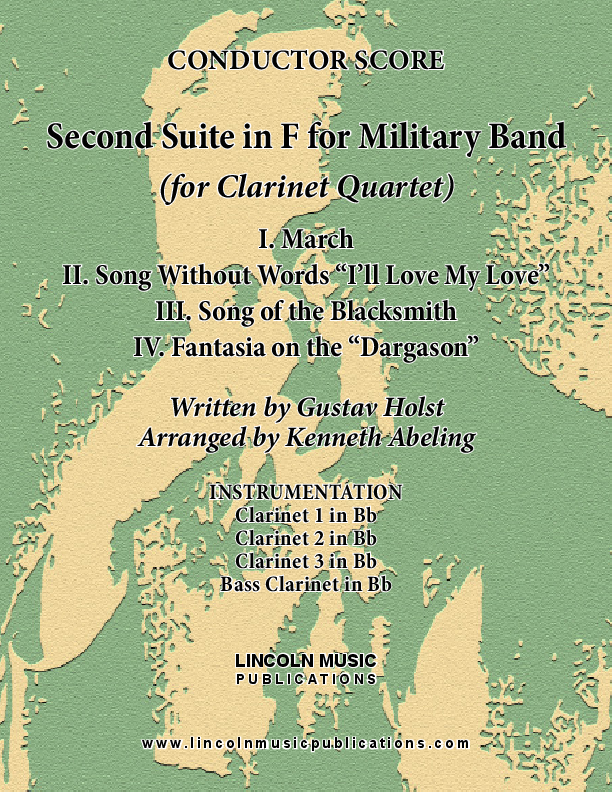 This transcription is for Clarinet Quartet. 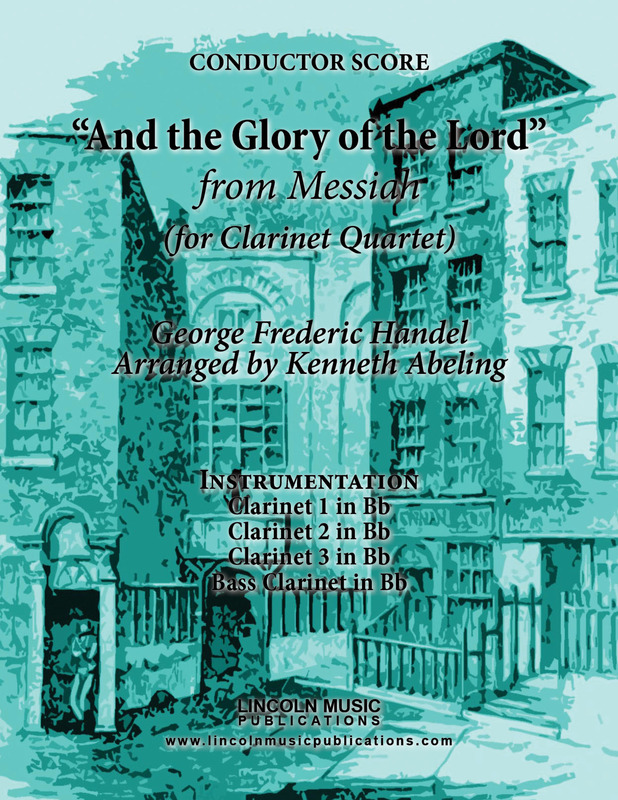 “And the Glory of the Lord Shall be Revealed” from George Fredrick Handel’s Messiah, transcribed here for Clarinet Quartet. 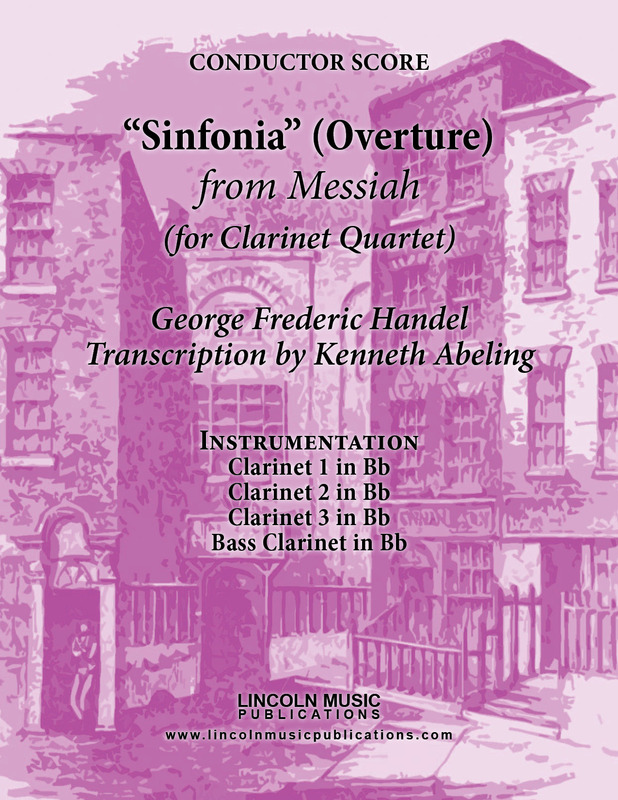 This is an intermediate to advanced intermediate transcription from Part I of Handel’s Messiah and appropriate for sacred Christmas events. 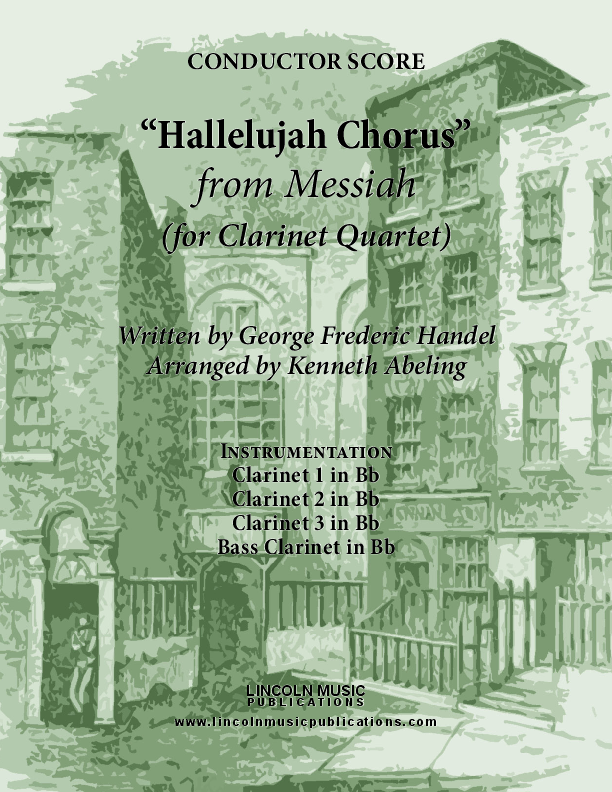 The famous Hallelujah Chorus from G. F. Handel’s Messiah in a user friendly key with equal emphasis on the orchestral parts for Clarinet Quartet. This is “His Yoke is Easy” from George Fredrick Handel’s Messiah, transcribed here for Clarinet Quartet. This is an advanced intermediate transcription from Part I of Handel’s Messiah and appropriate for sacred Christmas events. This is Pifa or Pastoral Symphony from G. F. Handel’s Messiah transcribed here for Clarinet Quartet. 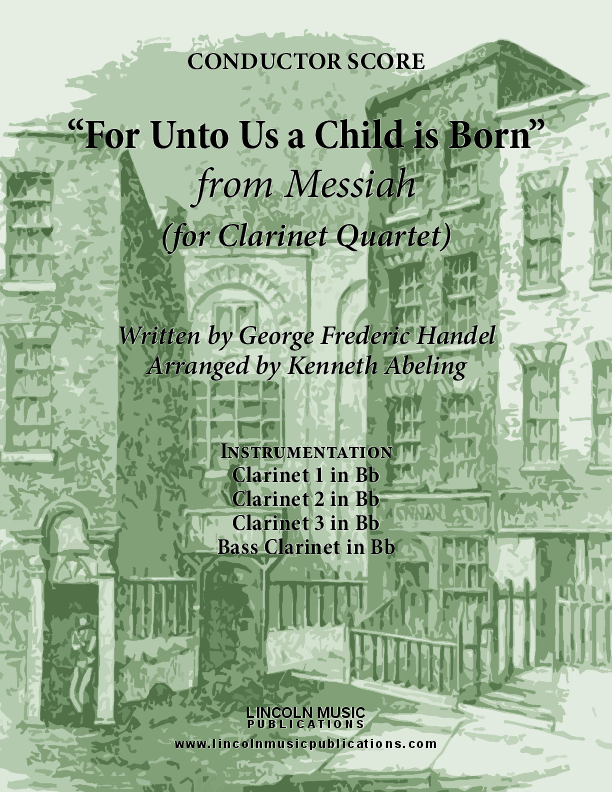 This is “For Unto Us a Child is Born” from G. F. Handel’s Messiah transcribed here for Clarinet Quartet. 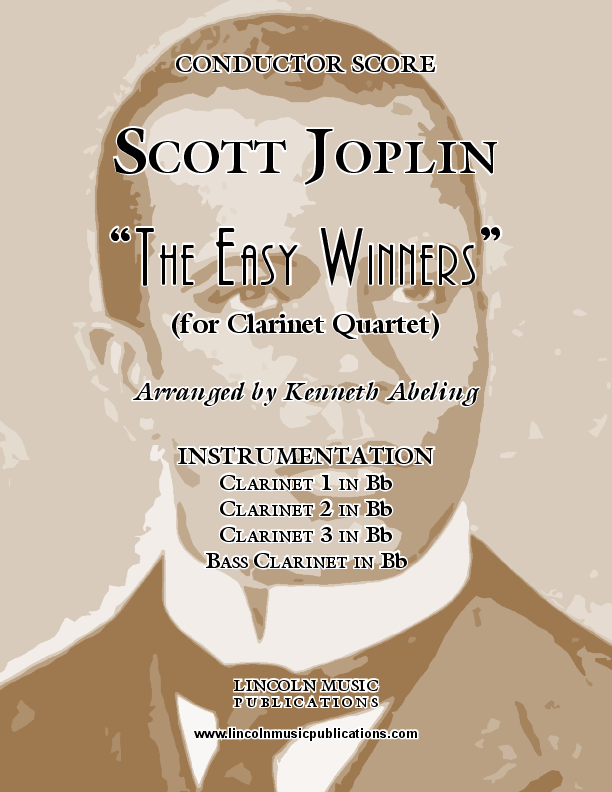 “The Easy Winners”, transcribed here for Clarinet Quartet, is one of Scott Joplin's most popular rags. Audiences may recognize this melody from the Academy Award winning movie "The Sting". 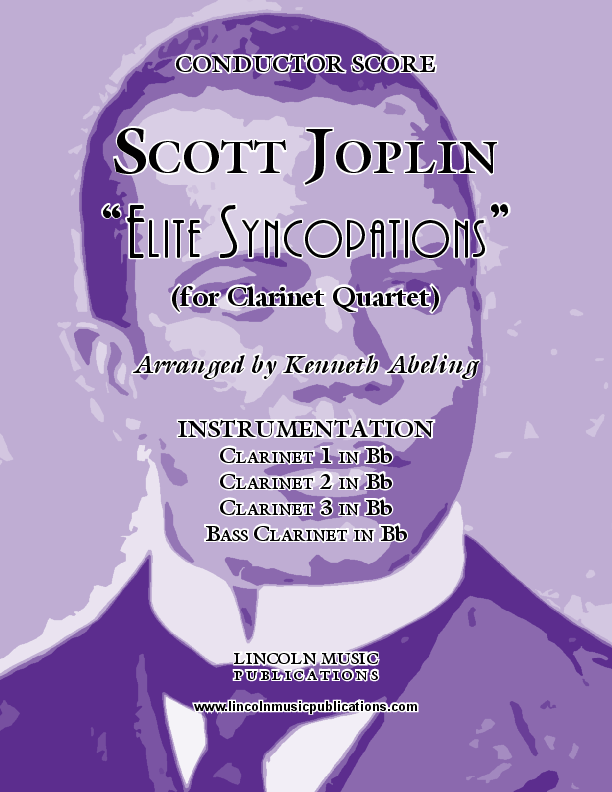 “Elite Syncopations”, transcribed here for Clarinet Quartet, is another one of Scott Joplin's most popular rags. “Fig Leaf Rag” transcribed here for Clarinet Quartet, is another one of Scott Joplin's most popular rags. “Maple Leaf Rag”, transcribed here for Clarinet Quartet, is one of Scott Joplin's most popular rags. Audiences may recognize this melody from the Academy Award winning movie "The Sting". 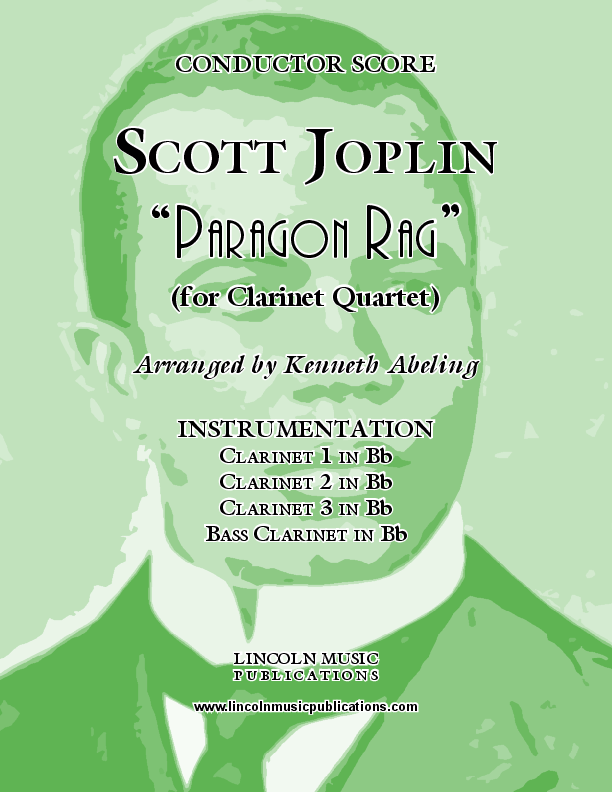 “Paragon Rag” transcribed here for Clarinet Quartet, is another one of Scott Joplin's most popular rags. 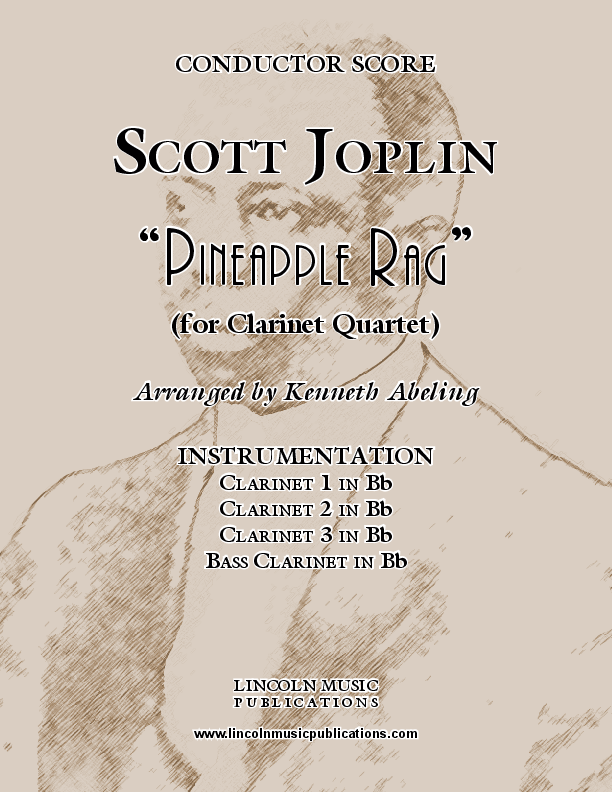 “Pineapple Rag”, transcribed here for Clarinet Quartet, is one of Scott Joplin's most popular rags. Audiences may recognize this melody from the Academy Award winning movie "The Sting". 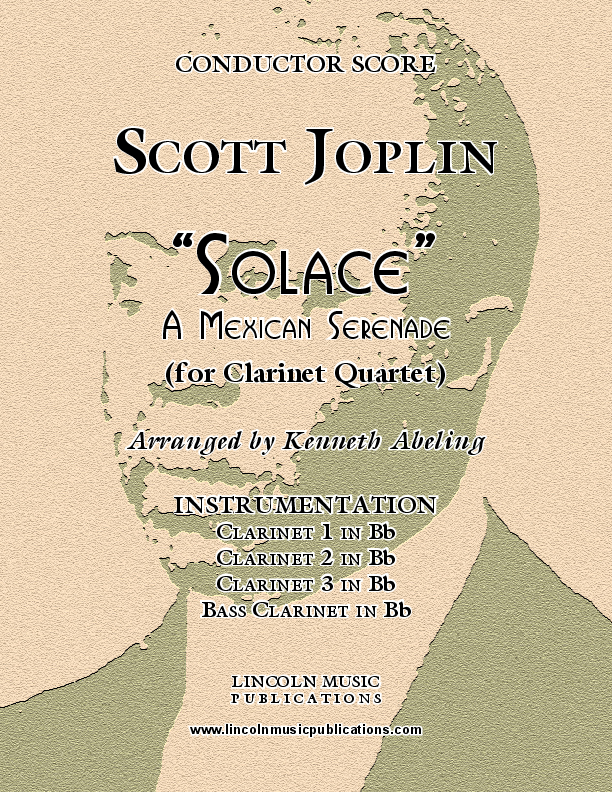 “Solace” - A Mexican Serenade, transcribed here for Clarinet Quartet, is one of Scott Joplin's most popular rags. Audiences may recognize this melody from the Academy Award winning movie "The Sting". “Something Doing” transcribed here for Clarinet Quartet, is another one of Scott Joplin's most popular rags. 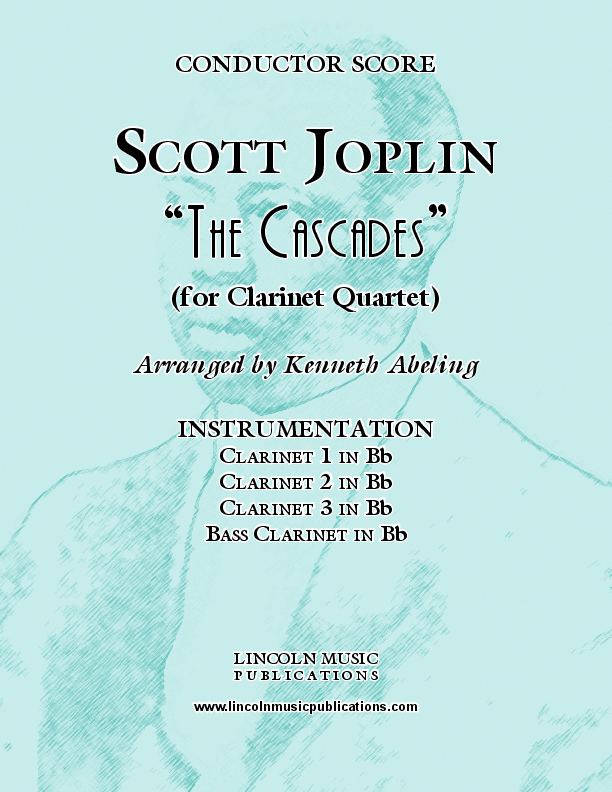 “The Cascades” transcribed here for Clarinet Quartet, is another one of Scott Joplin's most popular rags. 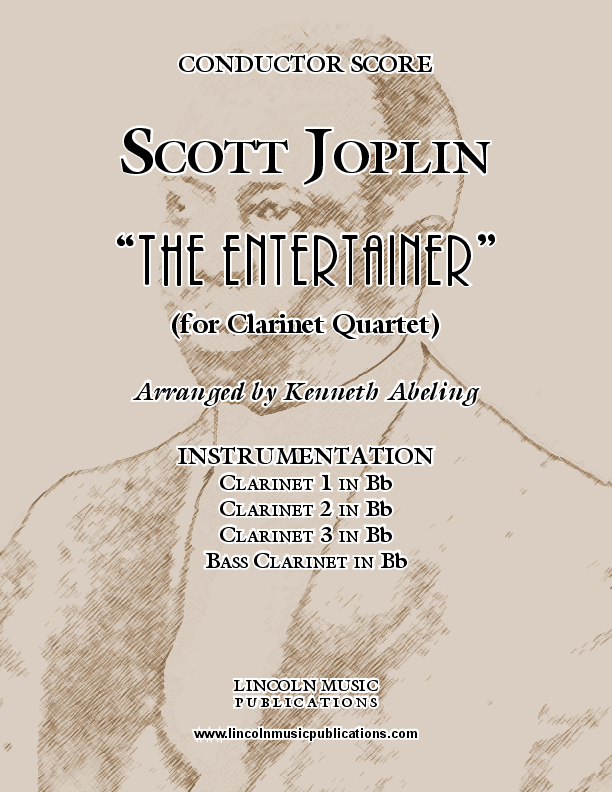 “The Entertainer”, transcribed here for Clarinet Quartet, is one of Scott Joplin's most popular rags. Audiences may recognize this melody from the Academy Award winning movie "The Sting". 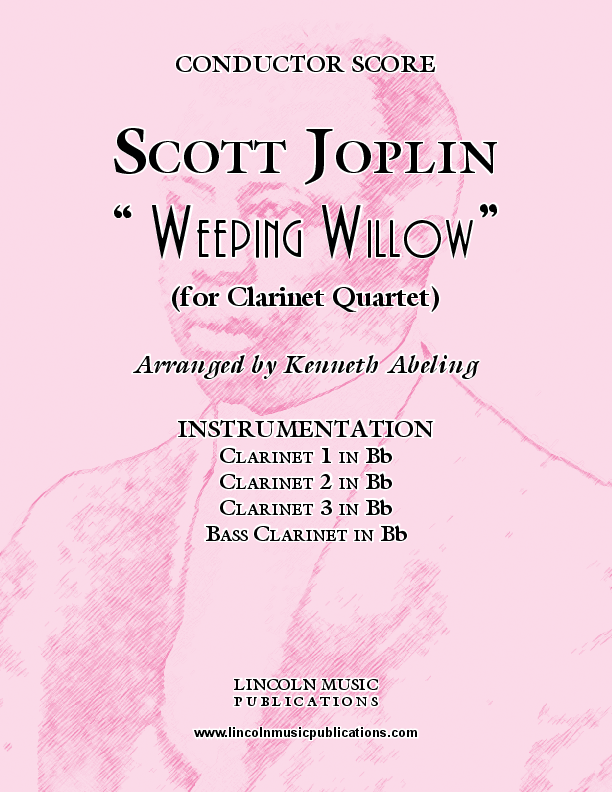 “Weeping Willow” transcribed here for Clarinet Quartet, is another one of Scott Joplin's most popular rags. 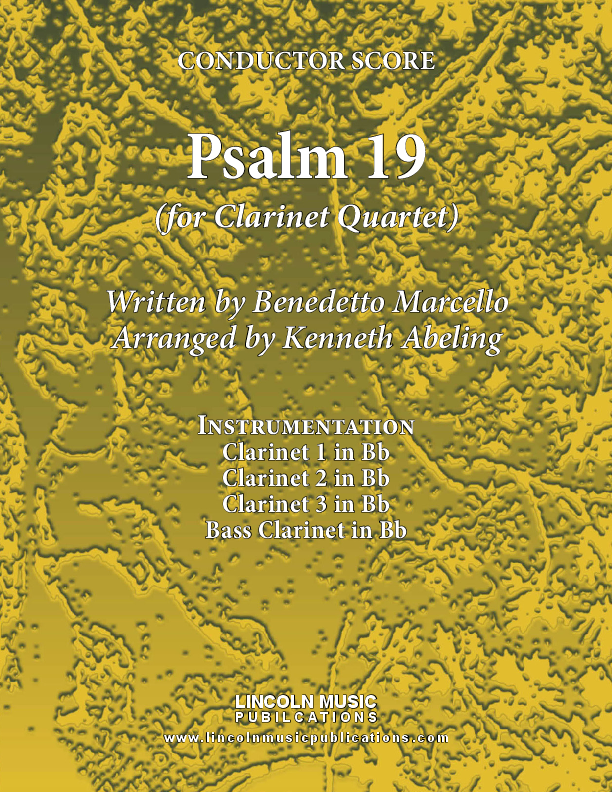 Inspired by Psalm 19 from the Book of Psalms this is Benedetto Marcello’s Psalm 19 - “The Heavens Declare the Glory of God” transcribed here for Clarinet Quartet. 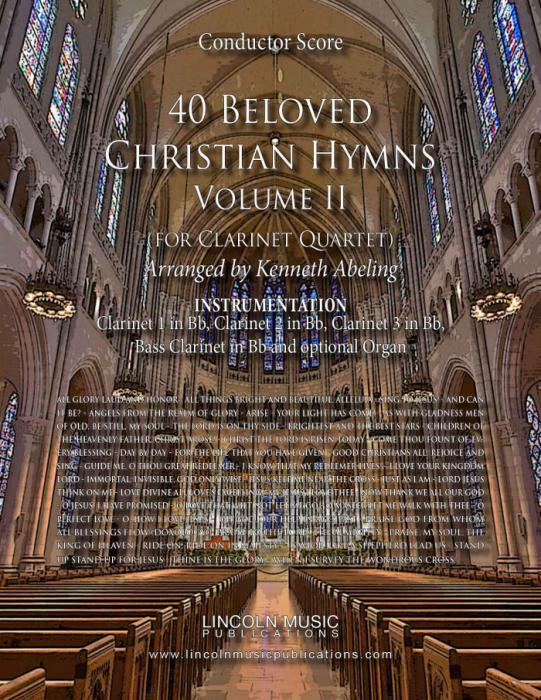 This selection is programmable for a variety of sacred and secular occasion and accessible to the intermediate to advanced intermediate level players. 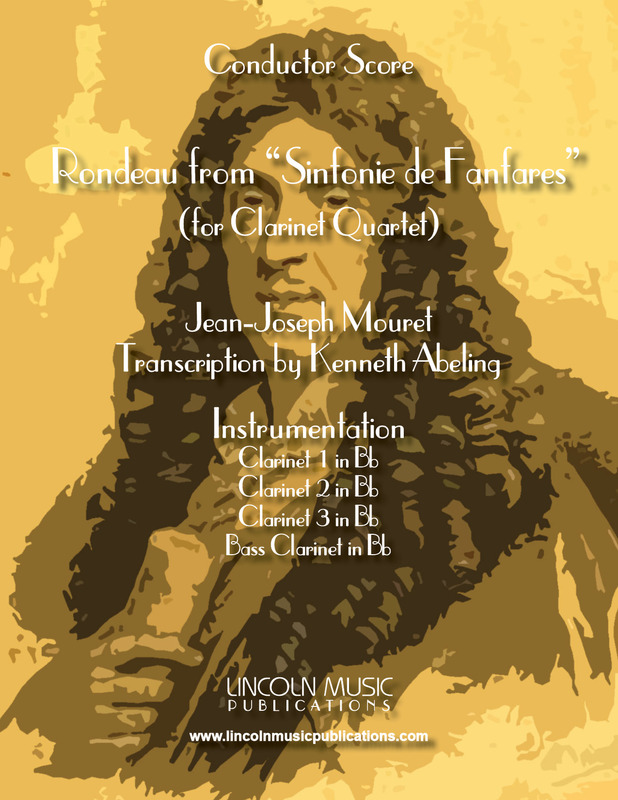 Rondeau from “Sinfonie de Fanfares”, transcribed here for Clarinet Quartet, is one of Jean-Joseph Mouret’s most performed compositions. 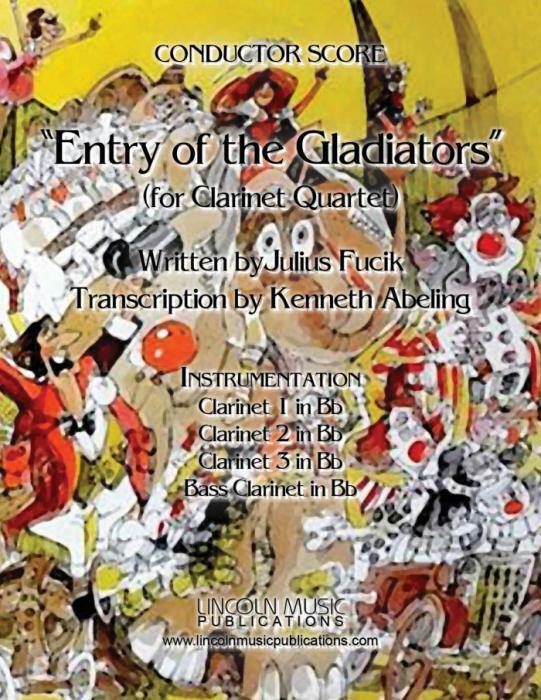 This Fanfare has numerous performance applications and this transcription is of an intermediate level of difficulty. 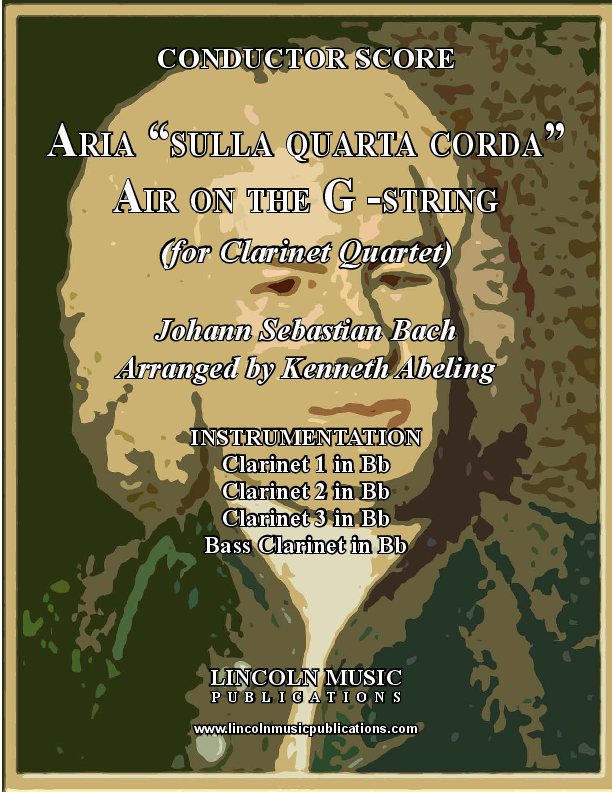 String Quartet KV 160, Movement I although not one of Mozart's better known, is a natural for the Clarinet Quartet and is suitable for a variety of playing levels. 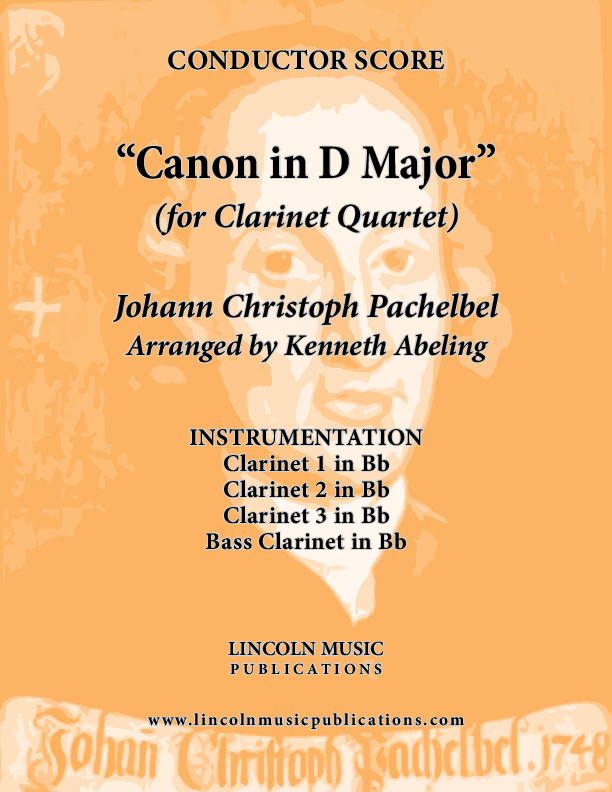 One the most recognizable Classical pieces ever written, Canon in D Major by Johann Pachelbel is transcribed here for Clarinet Quartet. This selection is suitable for a wide variety of performance occasions. 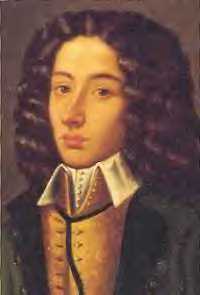 Giovanni Pergolesi's mournful Stabat Mater Dolorosa for Clarinet Quartet. 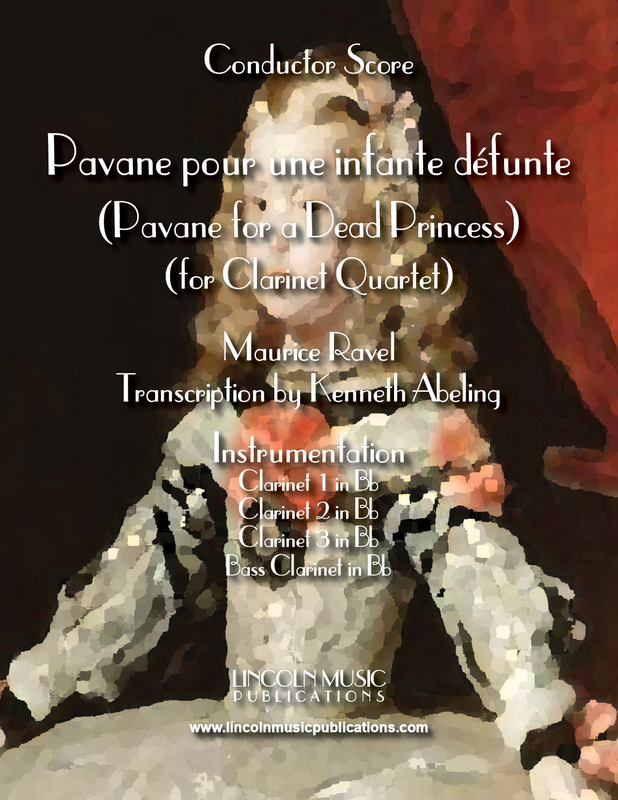 Pavane pour une infante défunte, or Pavane For A Dead Infanta, or Pavane For A Dead Princess as it most often referred, written by Maurice Ravel and arranged here for Clarinet Quartet. 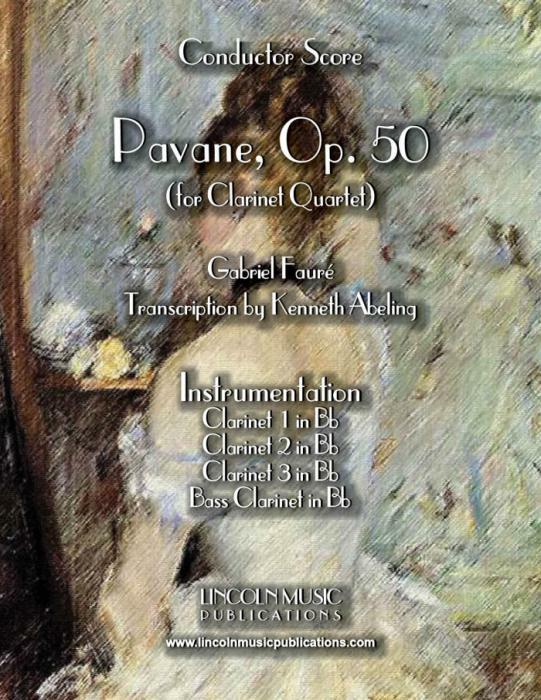 This is an advanced intermediate transcription of Ravels timeless classic. 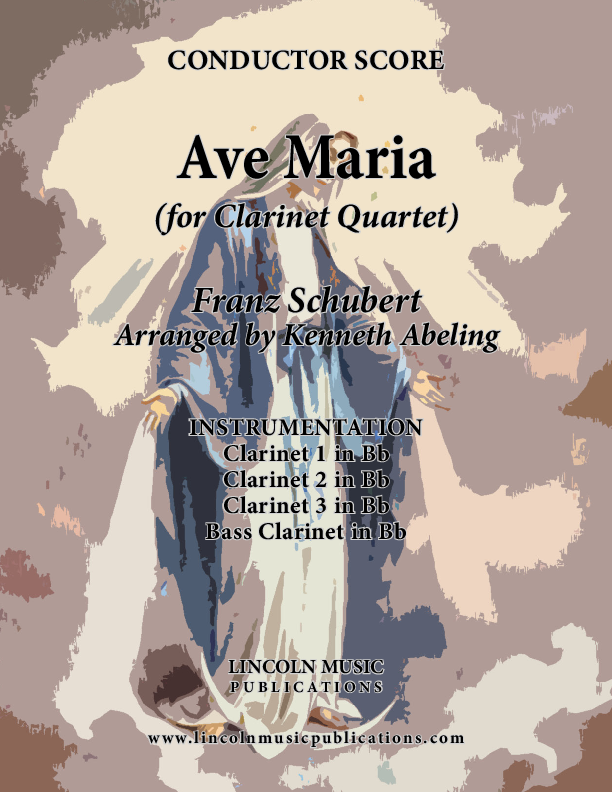 Ave Maria by Franz Schubert for Clarinet Quartet is an arrangement of arguably the most popular of all compositions sharing this title. This piece is appropriate for Christmas, Weddings, and many other religious or sacred events. 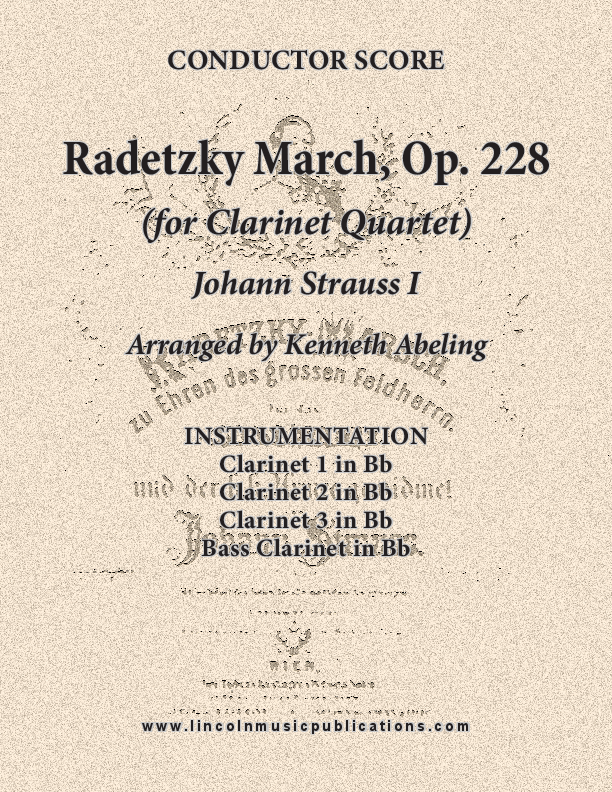 Radetzky March, Op. 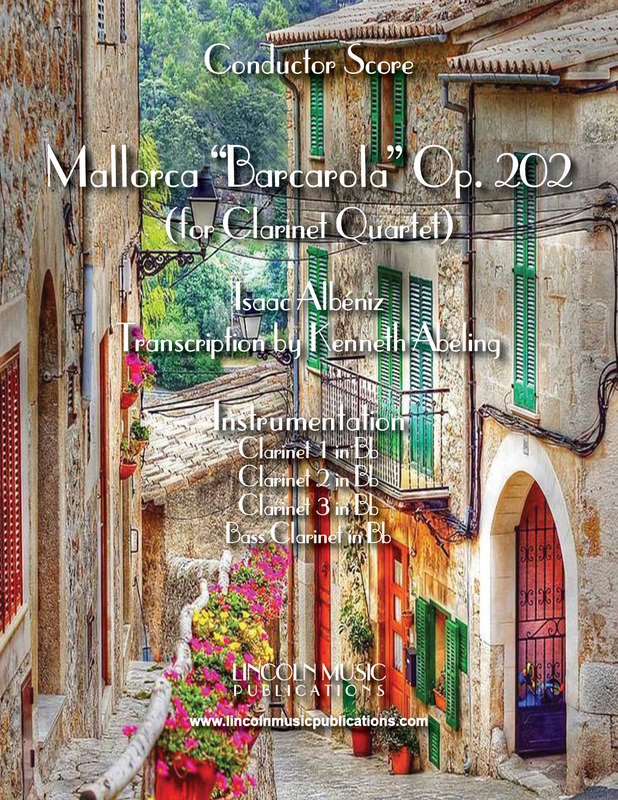 228 transcribed here for Clarinet Quartet. 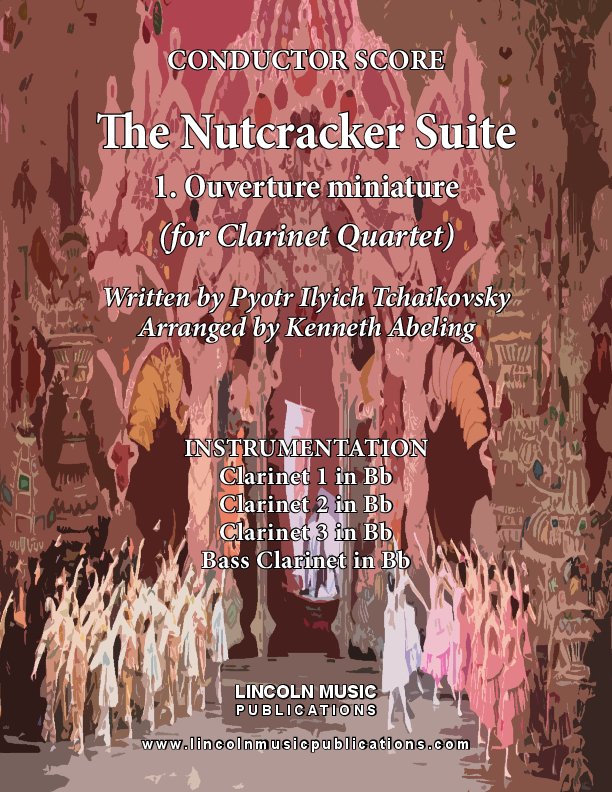 This is an intermediate advanced to advanced level arrangement and very suitable for Oktoberfest performances. 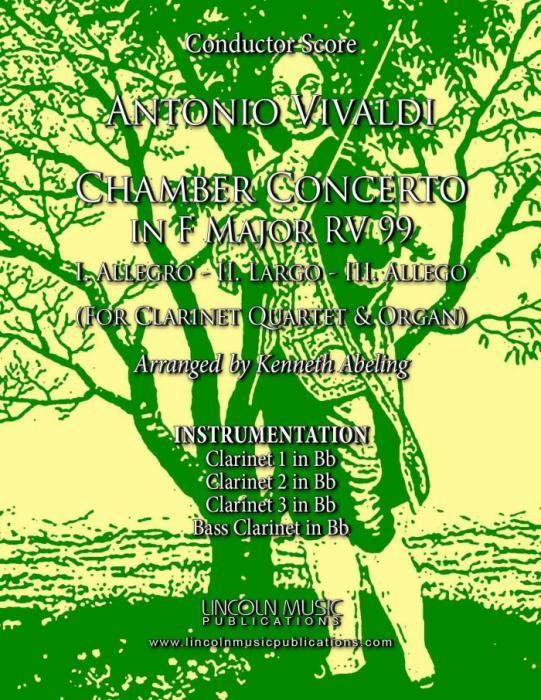 Antonio Vivaldi's Chamber Concerto in F Major (3) Movements for Clarinet Quartet is playable with or without organ. It features the 2nd voice throughout more than the 1st voice for a change! 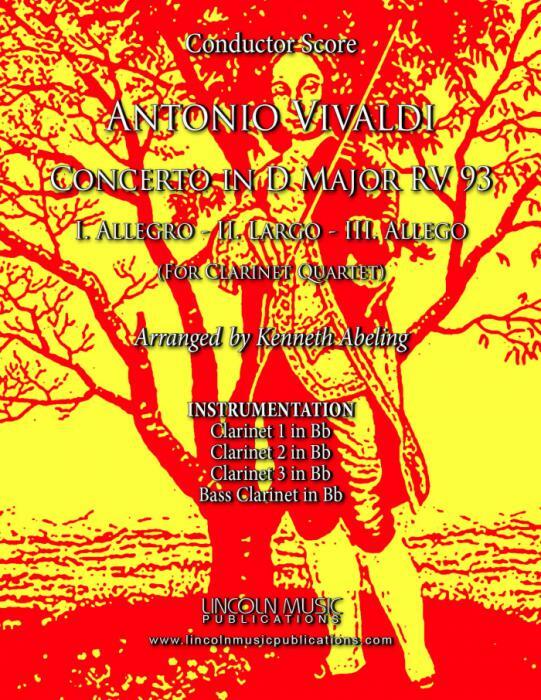 Vivaldi Concerto in G minor - II. 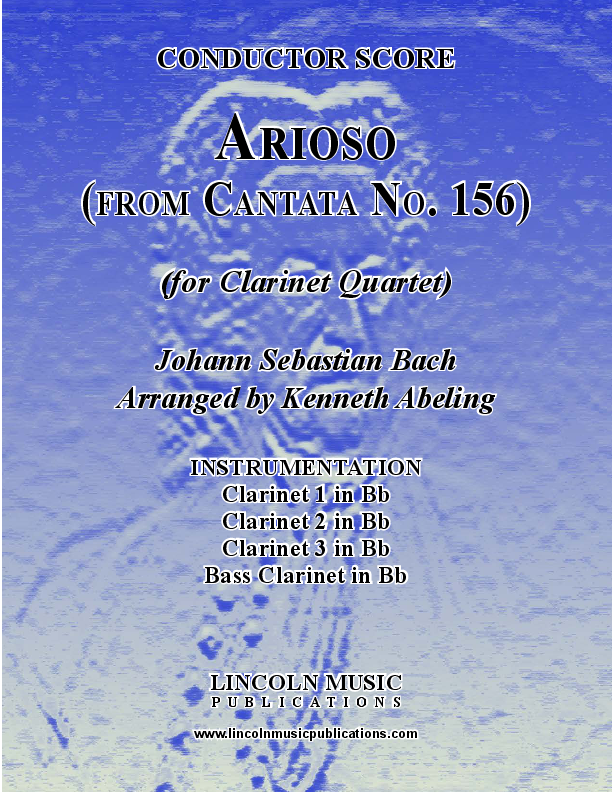 Largo for Clarinet Quartet. 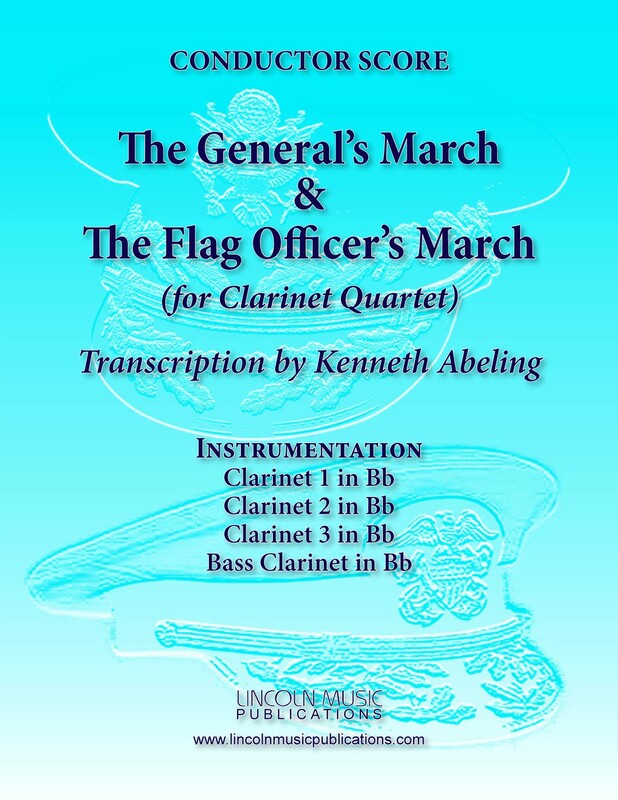 Ruffles & Flourishes and the “The General’s & Flag Officer’s Marches”, transcribed here for Clarinet Quartet. Those in need of these pieces will know their purpose. 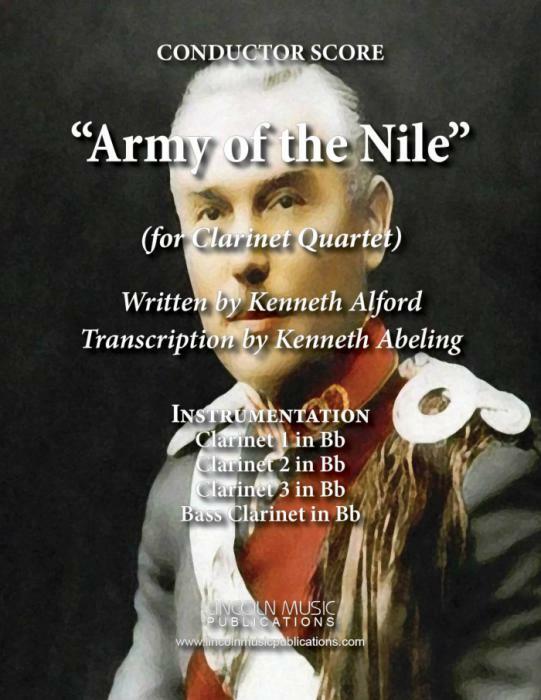 “Army of the Nile” by Kenneth Alford, transcription for Clarinet Quartet by Kenneth Abeling, is a British Style March. 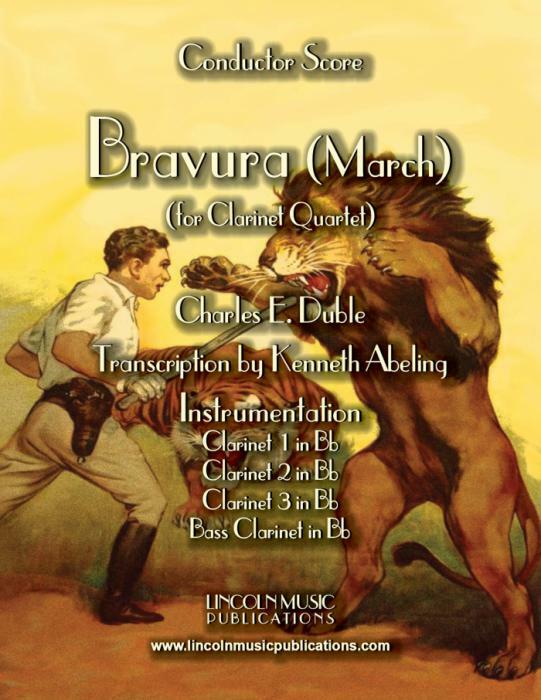 This is one of Alford’s most popular marches and is of an advanced intermediate to easier advanced level of difficulty. 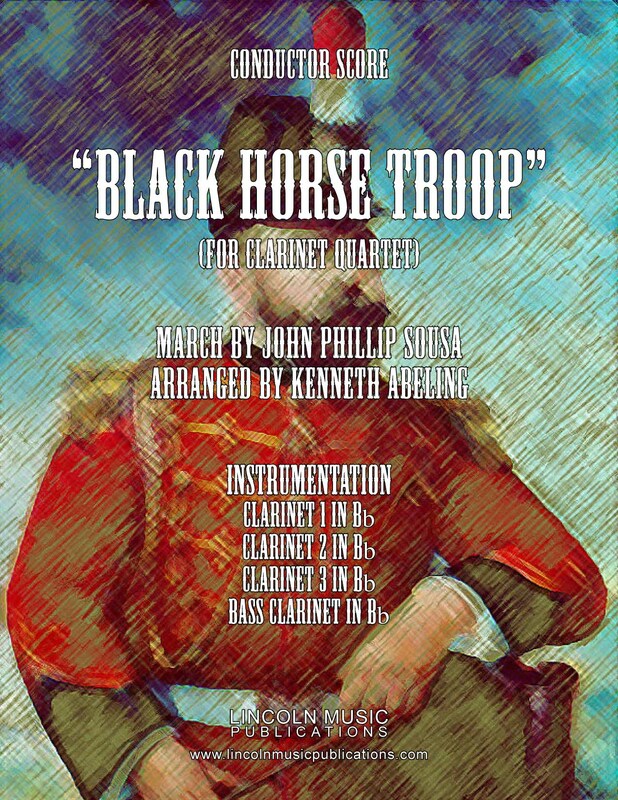 “The Black Horse Troop”, here for Clarinet Quartet, is one of John Philip Sousa’s most popular marches. 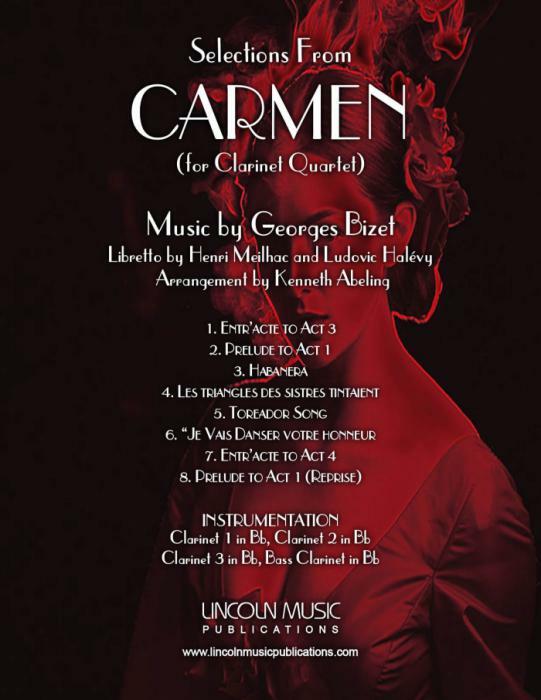 This arrangement is of intermediate level difficulty and audiences should readily recognize the melody. 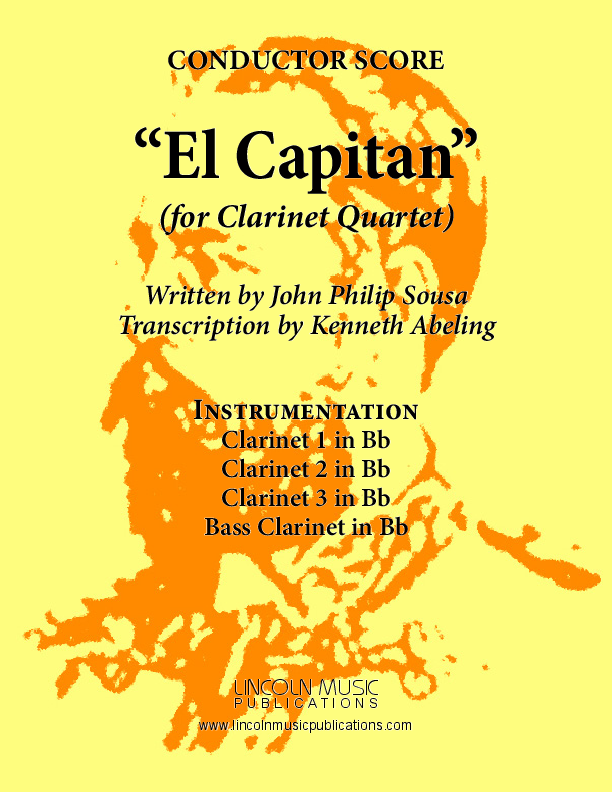 “El Capitan”, transcribed here for Clarinet Quartet, is another one of John Philip Sousa’s famous marches. This transcription is of intermediate level difficulty. 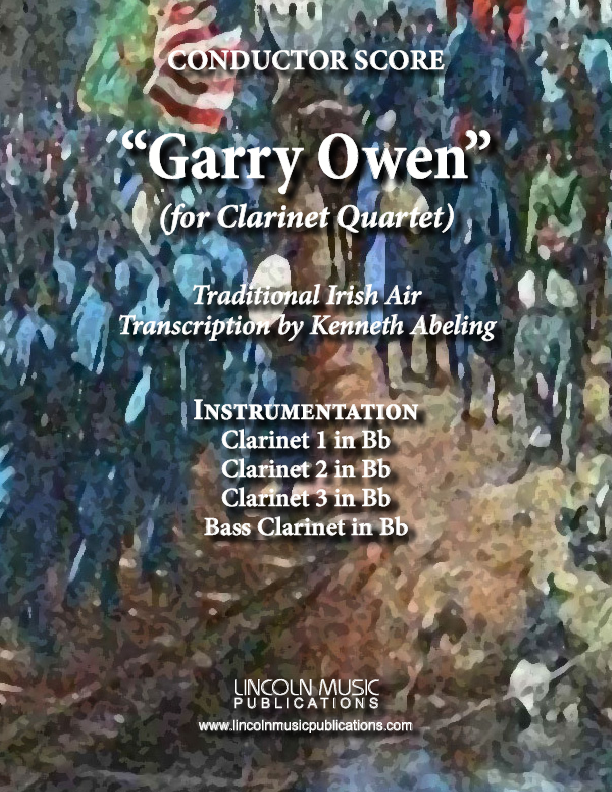 “Garry Owen” or “Garryowen” is a Traditional Irish Air and adopted as the official tune/march of the US 7th Cavalry Regiment arranged here for Clarinet Quartet. This is an advanced intermediate arrangement. 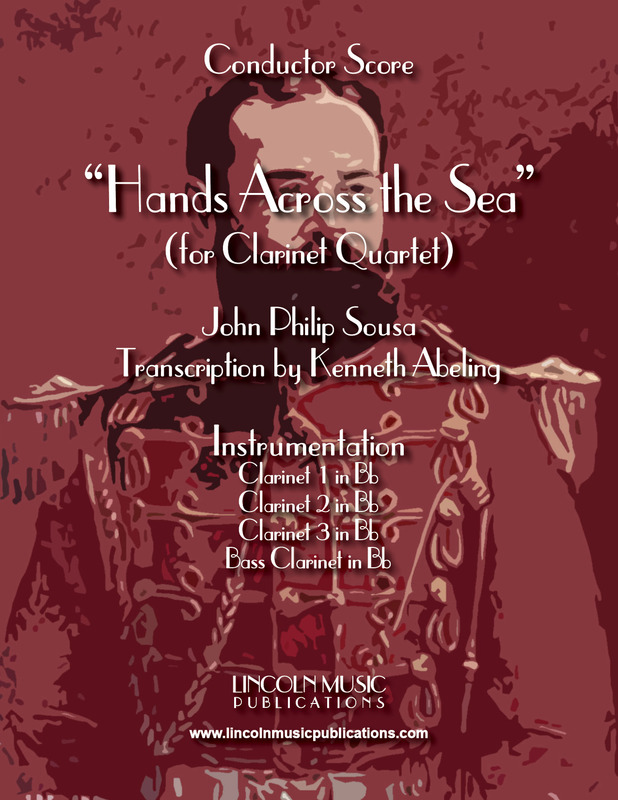 “Hands Across the Sea” transcribed here for Clarinet Quartet, is another one of John Philip Sousa’s famous marches. T.B.. Boyer's Joyce’s 71st Regiment is a great march with it's contrasting trio! 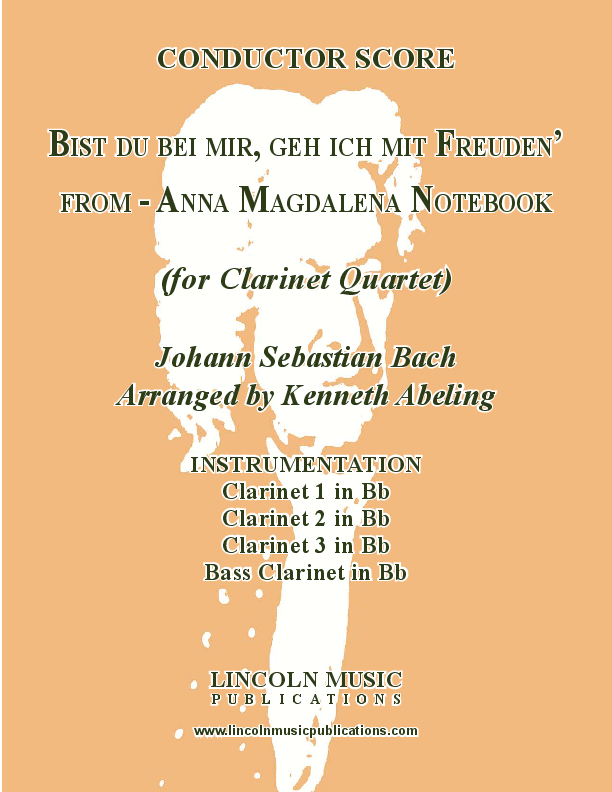 Transcribed here for Clarinet Quartet. 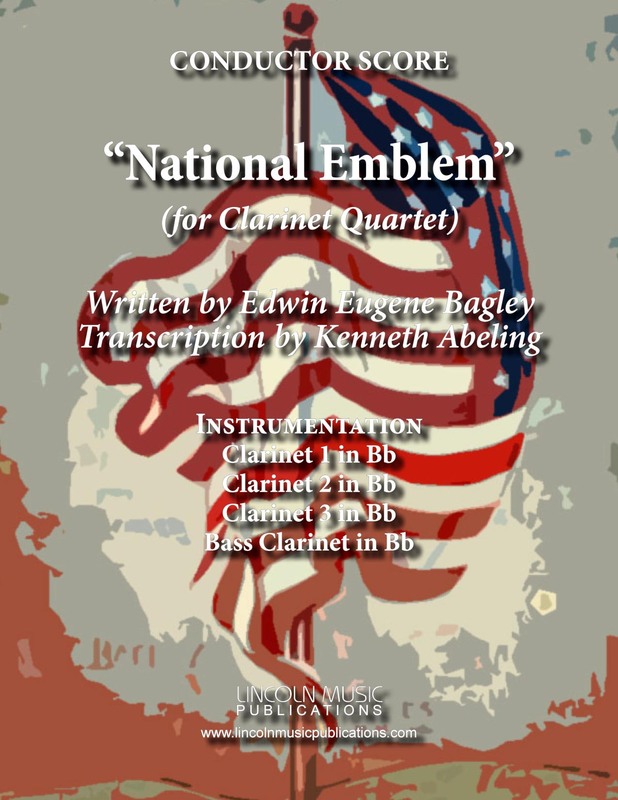 This is the “National Emblem” march by E. E. Bagely transcribed here for Clarinet Quartet. 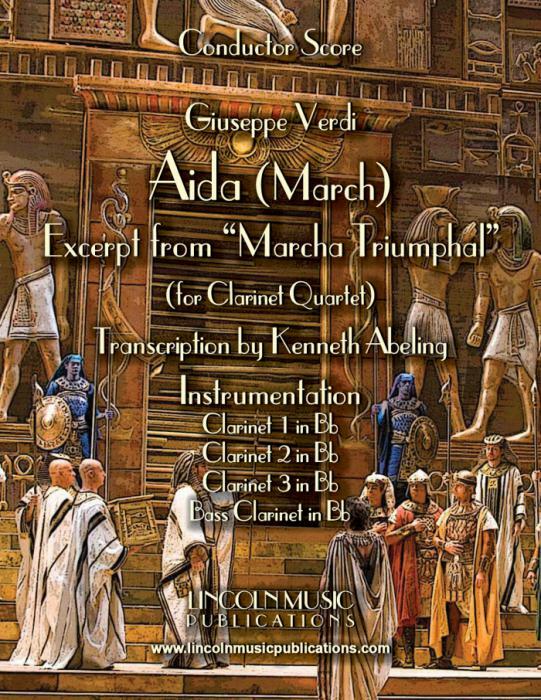 This is an advanced intermediate arrangement of the very well know march. 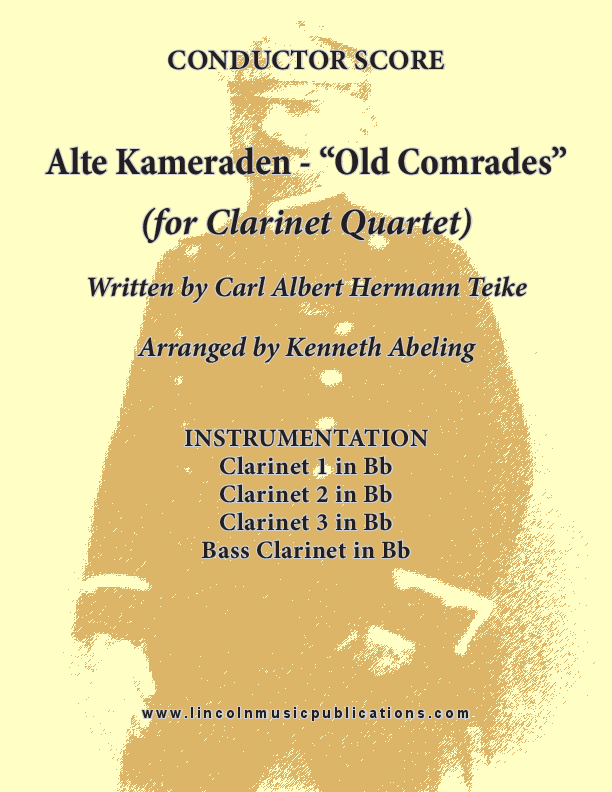 C. Teike's Alte Kamaraden or “Old Comrades” is one of the most popular German marches of all time and perfect for“ Oktoberfest-ish” gigs! 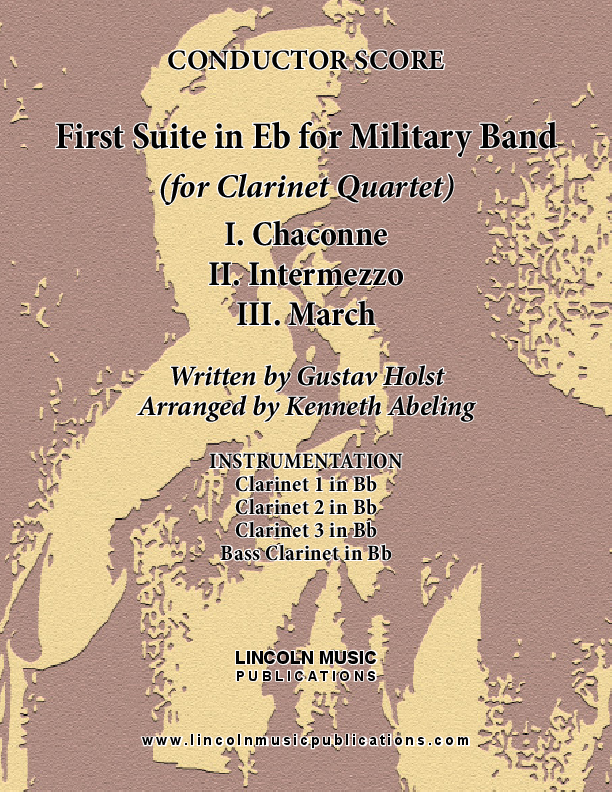 Transcribed here for Clarinet Quartet. 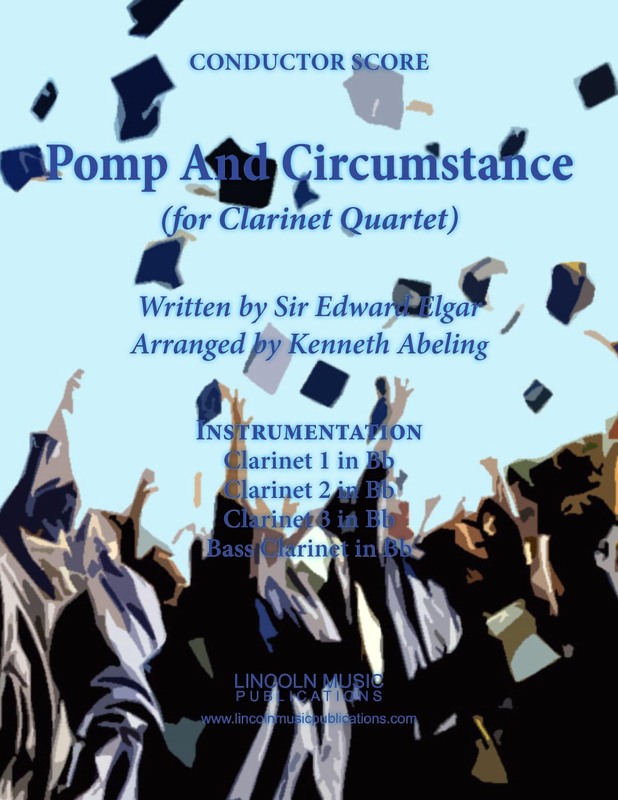 Sir Edward Elgar’s “Pomp and Circumstance”, arranged here for Clarinet Quartet, is arguably the most popular graduation ceremony processional of all time. This is an easy transcription (since you will likely be repeating it several times) and loyal to the original. 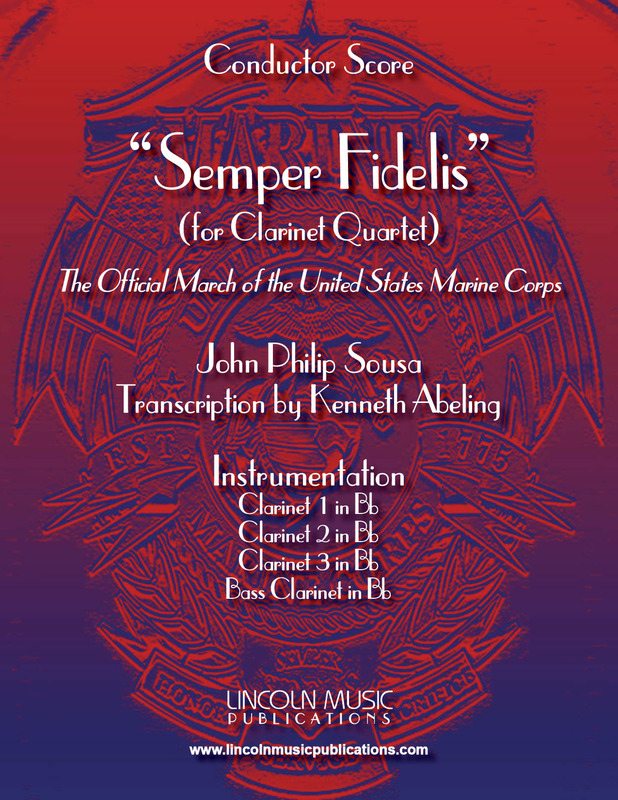 “Semper Fidelis” transcribed here for Clarinet Quartet, is another one of John Philip Sousa’s famous marches and The Official March of the United States Marine Corps. This transcription is of intermediate to advanced intermediate level difficulty. 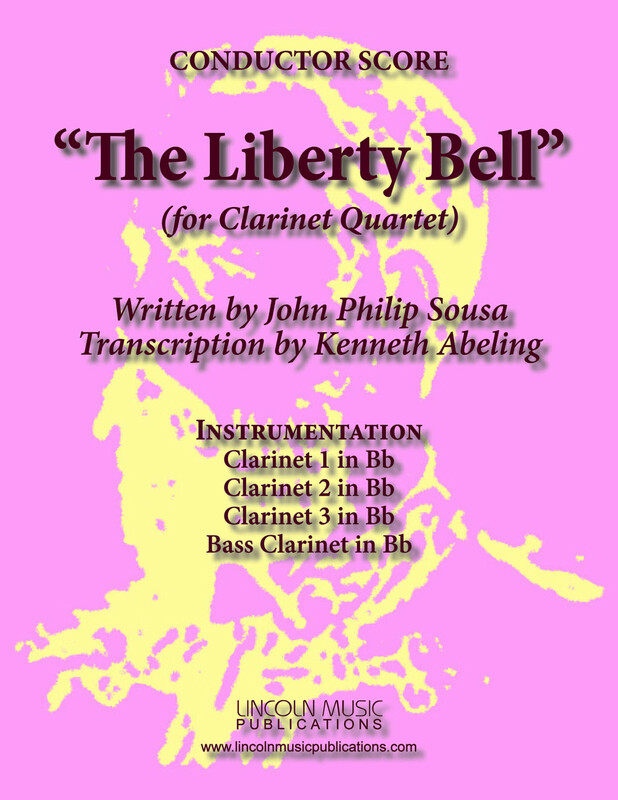 “The Liberty Bell” transcribed here for Clarinet Quartet, is another one of John Philip Sousa’s famous marches and the theme to the Monty Python TV series. This transcription is of intermediate to advanced intermediate level difficulty. 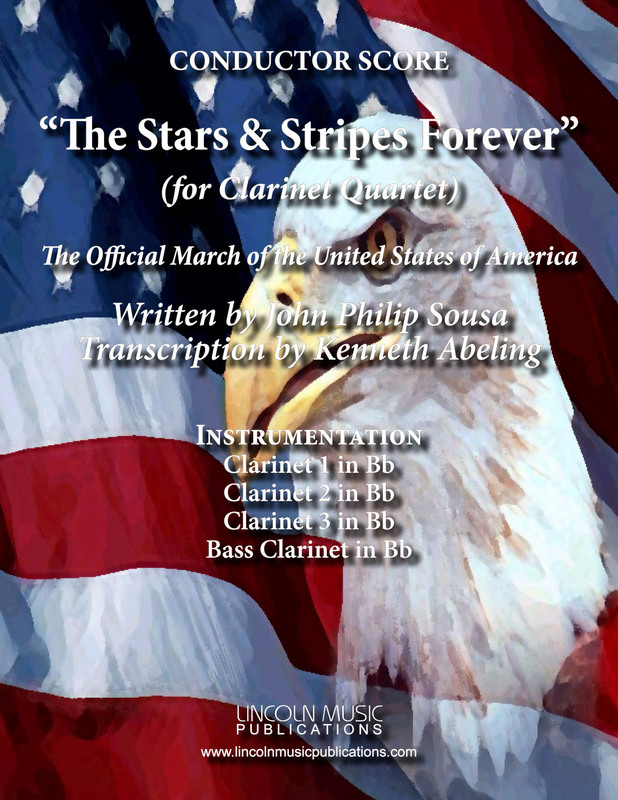 “The Stars and Stripes Forever” is arguably John Philip Sousa’s most famous march and the Official March of the USA, transcribed here for Clarinet Quartet. 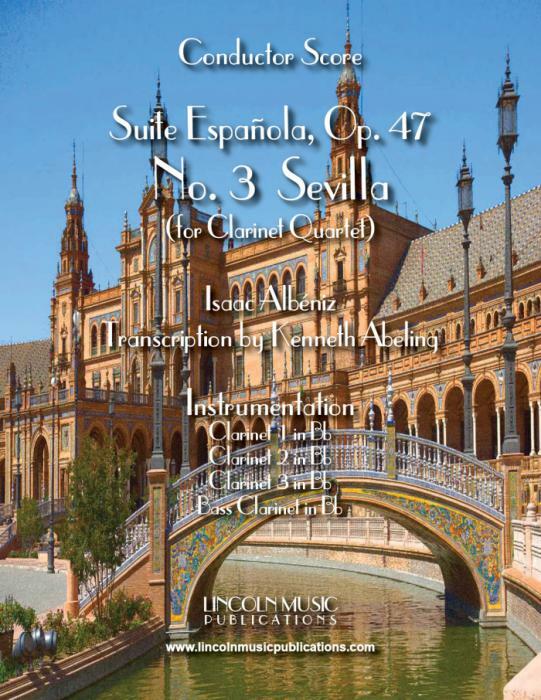 This transcription is of intermediate to advanced intermediate level difficulty. 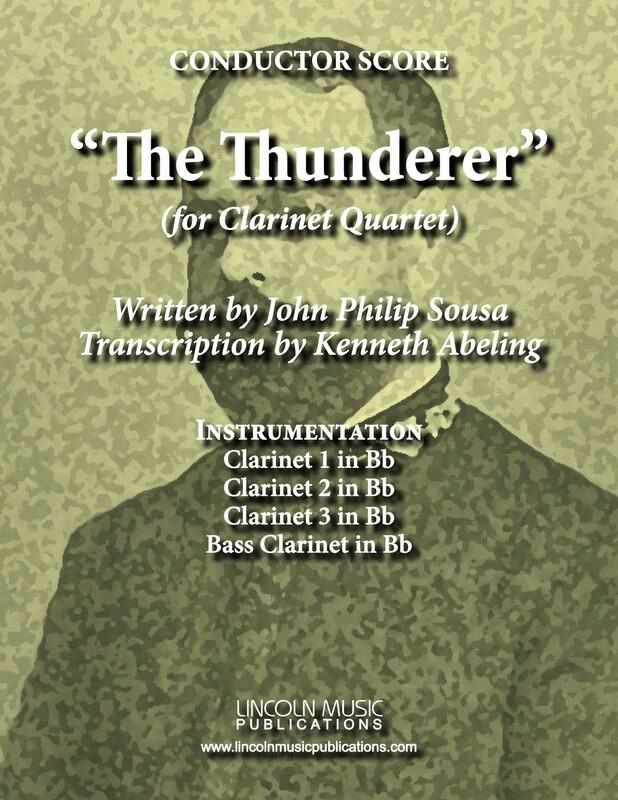 “The Thunderer” transcribed here for Clarinet Quartet, is another one of John Philip Sousa’s famous marches. This transcription is of intermediate level difficulty. 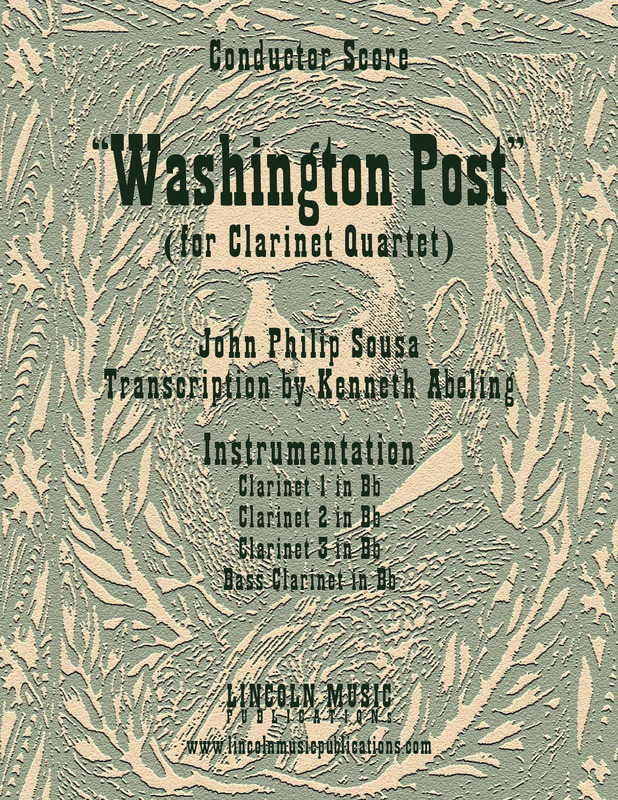 “Washington Post” is one of John Philip Sousa’s most famous marches transcribed here for Clarinet Quartet. This transcription is of intermediate level difficulty. 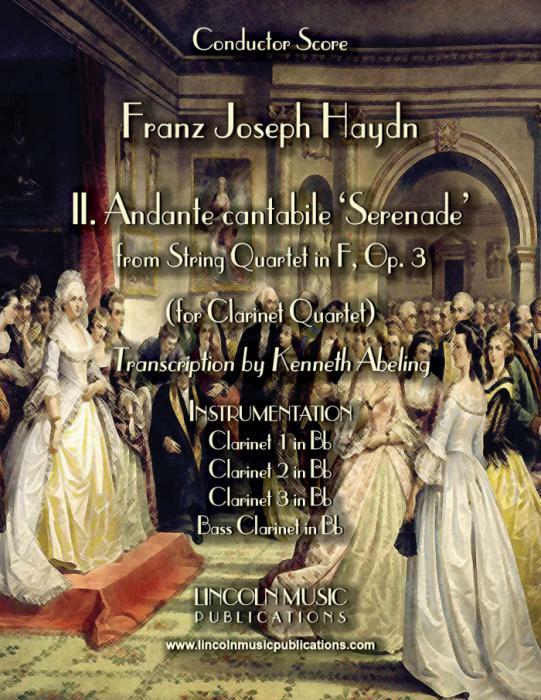 The German National Anthem based on a theme by Joseph Haydn for Clarinet Quartet. 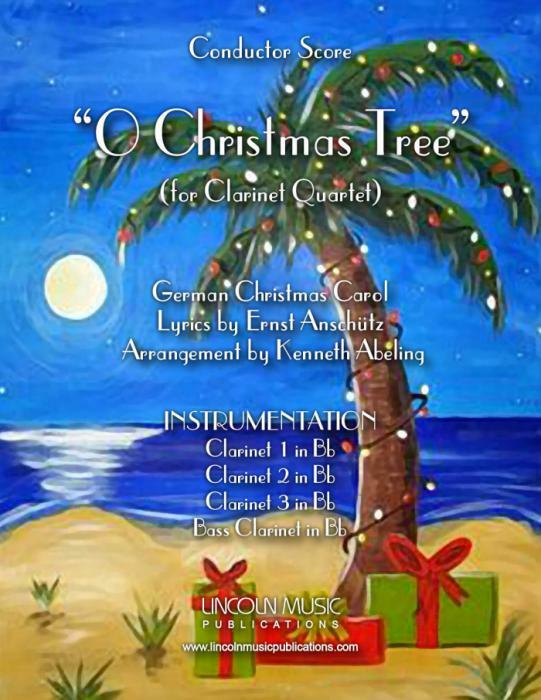 Traditional Christmas Carols for Clarinet Quartet Volume I contains 20 popular Christmas Carols from around the world, simply scored. Table of Contents: Angels We have Heard on High, Away in the manger, Bring a Torch, Jeanette Isabella, Coventry Carol, Deck the Halls, Once in Royal David's City, God Rest Ye Merry Gentleman, Hark the Herald Angels Sing, I Heard The Bells on Christmas Day, It Came upon a Midnight Clear, Joy to the World, Oh Christmas Tree, Oh Come All Ye Faithful, Oh Come, Oh Come Emmanuel, Oh Holy Night, Little Town of Bethlehem, Silent Night, First Noel, We Three Kings, What Child is This? 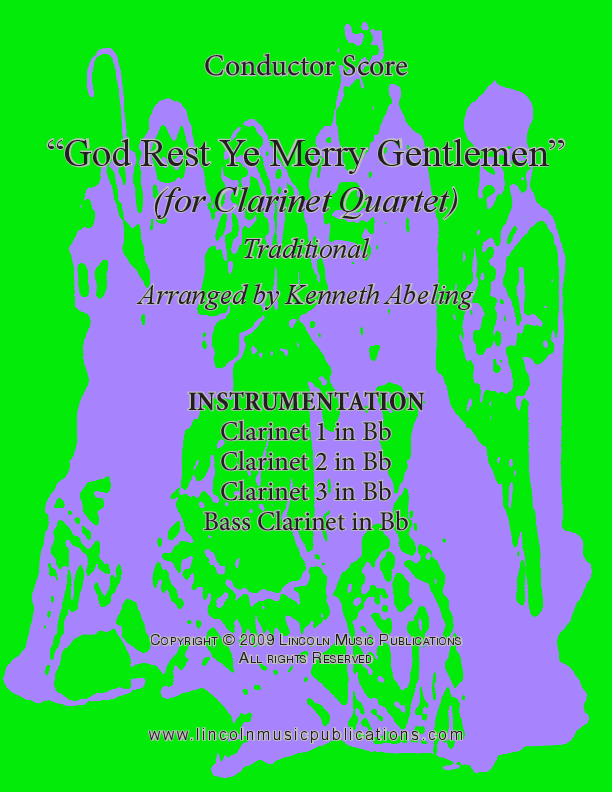 This is swing arrangement of the traditional Christmas Carol “God Rest Ye Merry Gentlemen” for Clarinet Quartet. 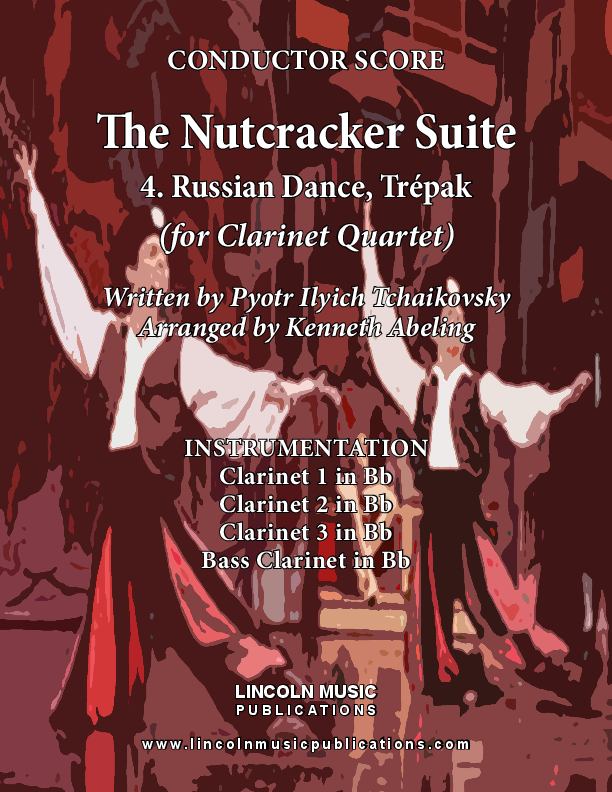 It is suitable for professional musicians and more experienced ensembles. Hark! 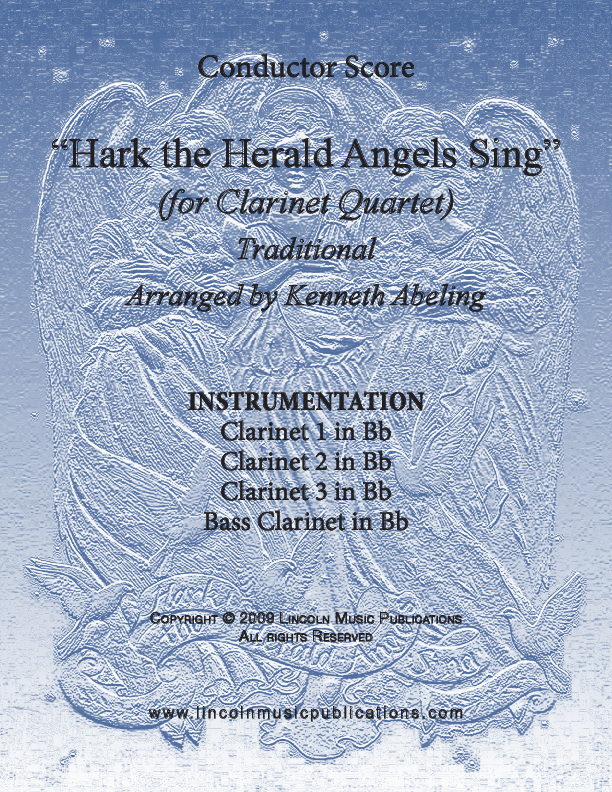 The Herald Angels Sing for Clarinet Quartet is essentially a very entertaining Theme and Variations in a Latin style on a Christmas time favorite! 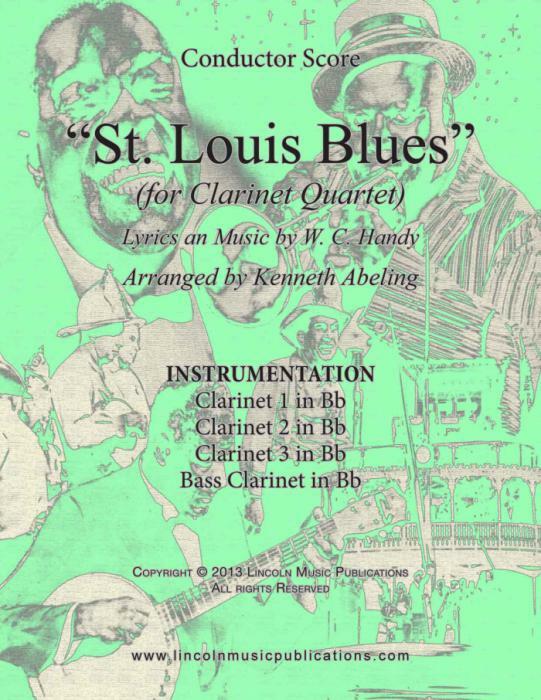 St. Louis Blues written by W. C. Handy, offered here for Clarinet Quartet, is an essential chart in any Dixieland library. 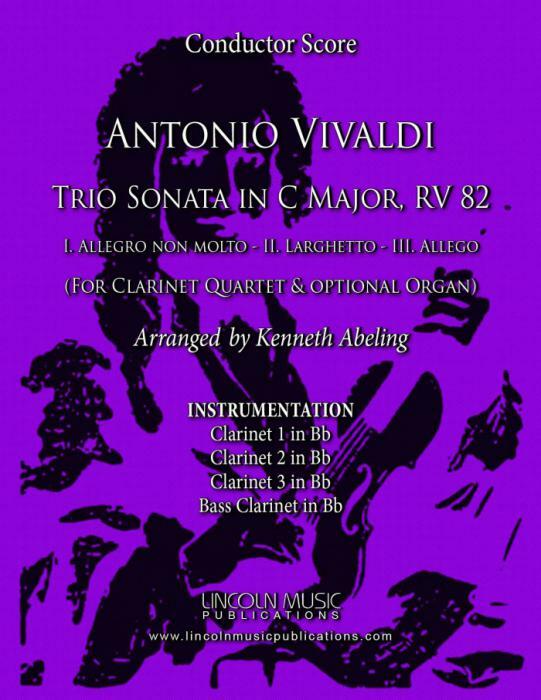 This arrangement is suitable for professional musicians and reachable by less experienced ensembles. 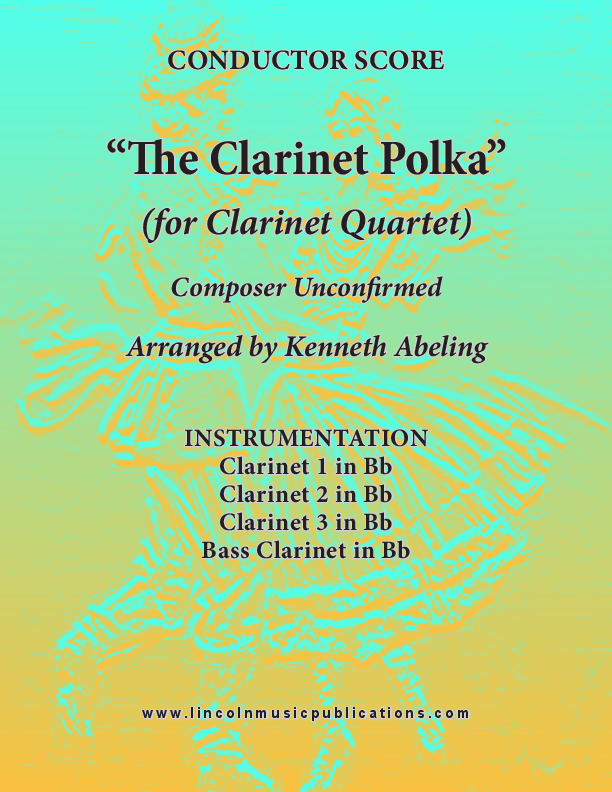 The ever recognizable and ever popular “Clarinet Polka” arranged for Clarinet Quartet. This arrangement is for more advanced ensembles but a good workout for intermediate to lesser-advanced ensembles as well. 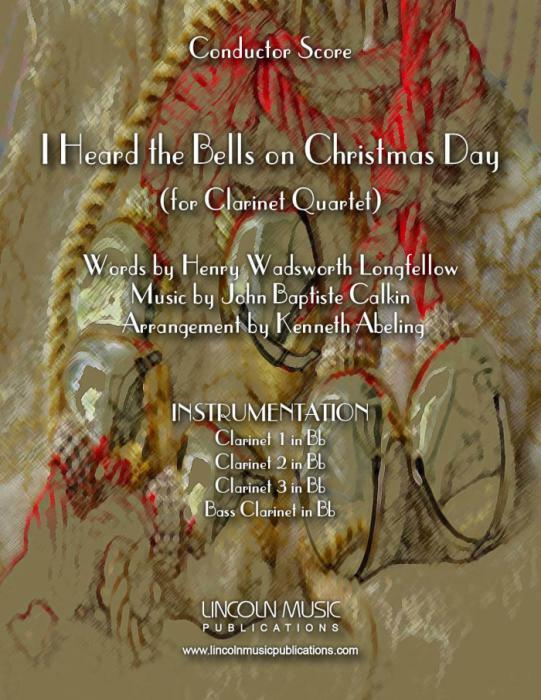 This crowd-pleasing arrangement of Jingle Bells for Clarinet Quartet alternates between swing and Latin on the verses and choruses respectively. The Soli and Tutti sections will show off the precision of your ensemble. 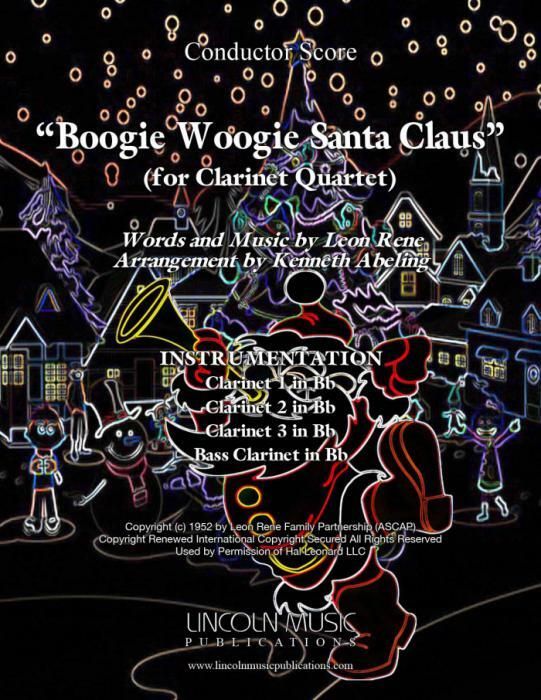 This Jazzy arrangement of We Wish You a Merry Christmas for Clarinet Quartet is will make a nice closing selection for caroling or concert. 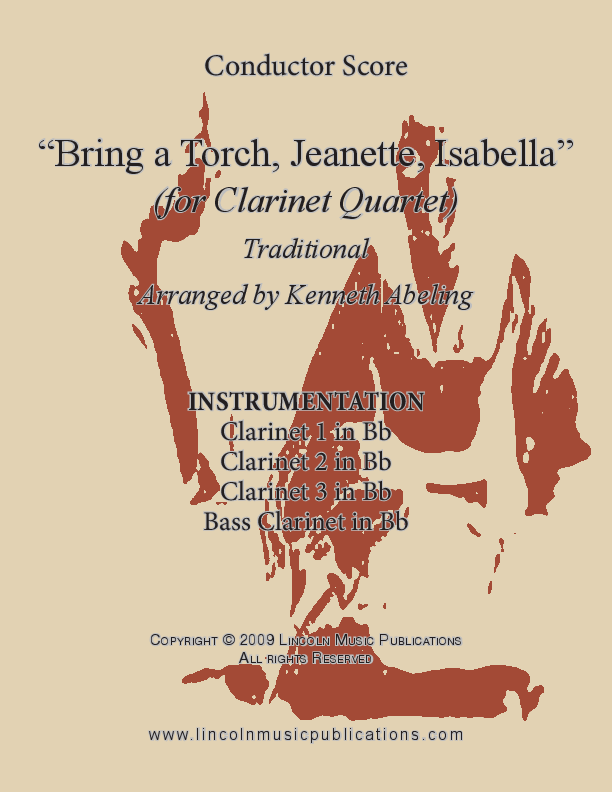 Bring a Torch Jeanette, Isabella for Clarinet Quartet is a traditional carol arranged as a jazz waltz. 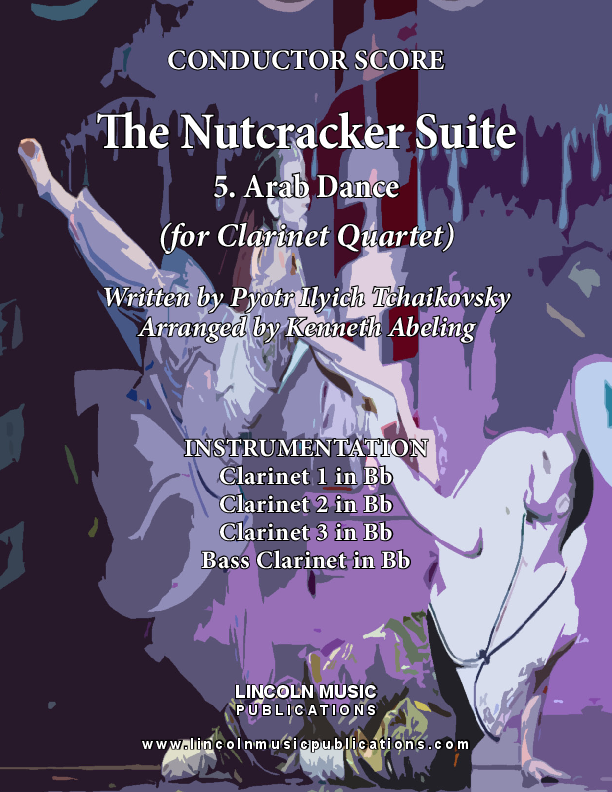 This arrangement is suitable for professional musicians and more experienced ensembles. 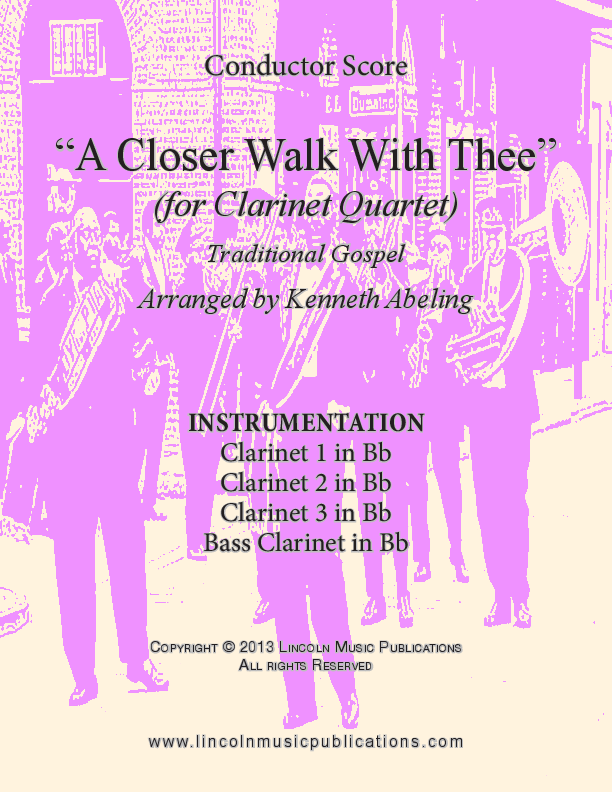 A Closer Walk With Thee for Clarinet Quartet is a quintessential New Orleans funeral dirge that has numerous playing applications and an all time Dixieland favorite. 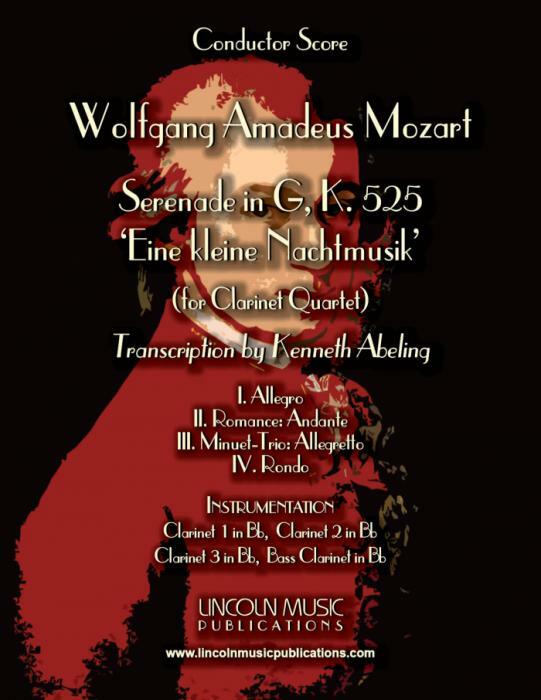 This arrangement is suitable for professional musicians and reachable by less experienced ensembles. 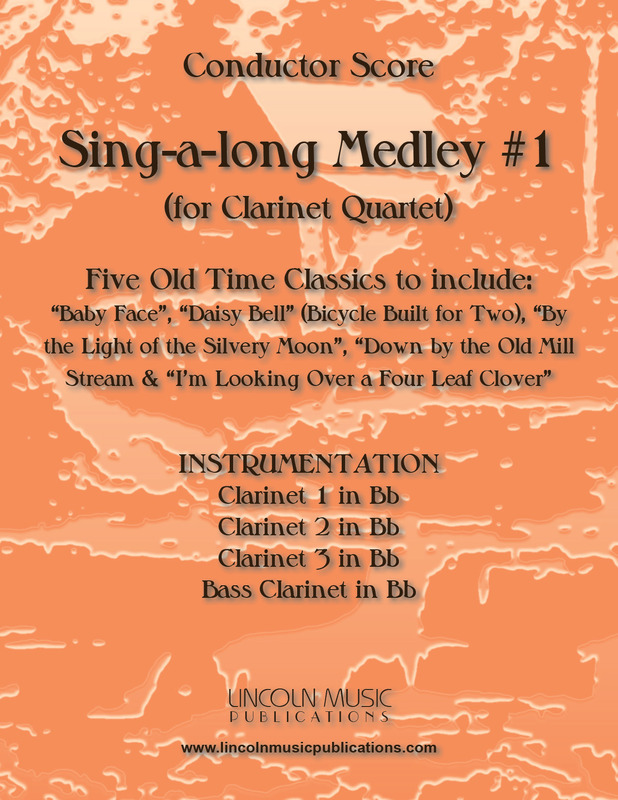 Morning Star Polka arranged for Clarinet Quartet. This is an intermediate, to intermediate advanced level Polka because of a few tricky parts and is Oktoberfest appropriate. 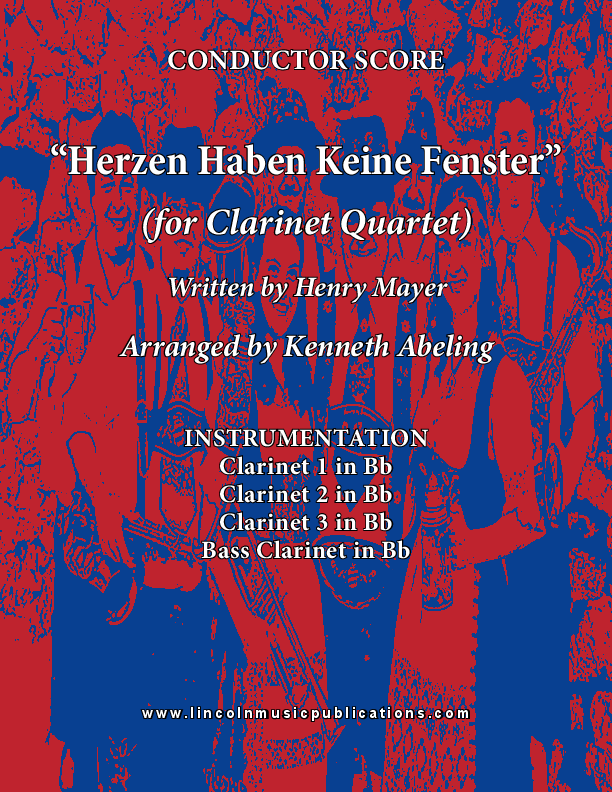 Henry Mayer's Herzen Haben Keine Fenster from which “My Melody of Love” was derived arranged here for Clarinet Quartet. 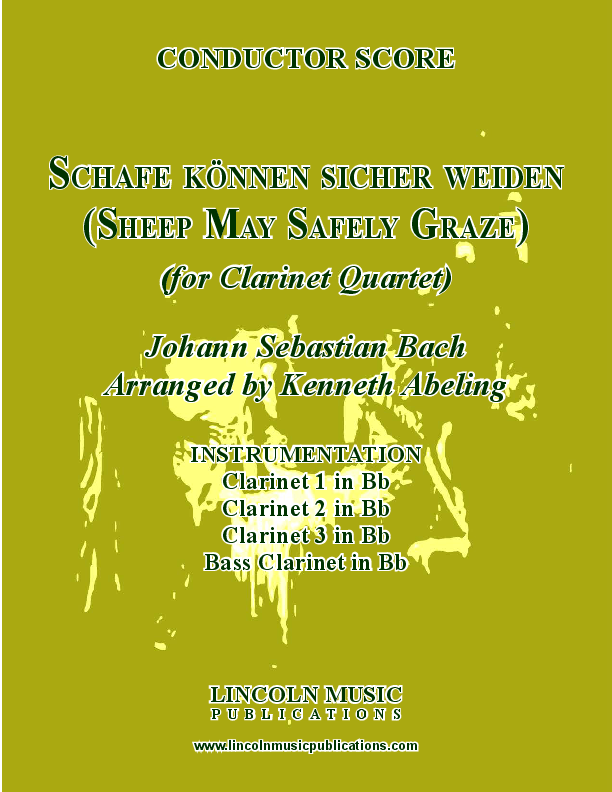 This is an easy to intermediate level arrangement and very suitable for Oktoberfest performances. 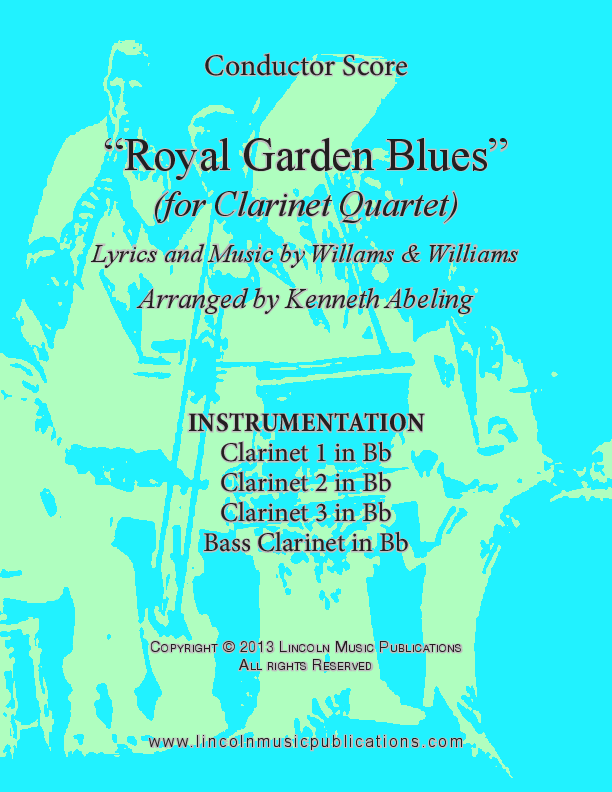 Royal Garden Blues for Clarinet Quartet is a well know and readily recognizable Dixieland classic. 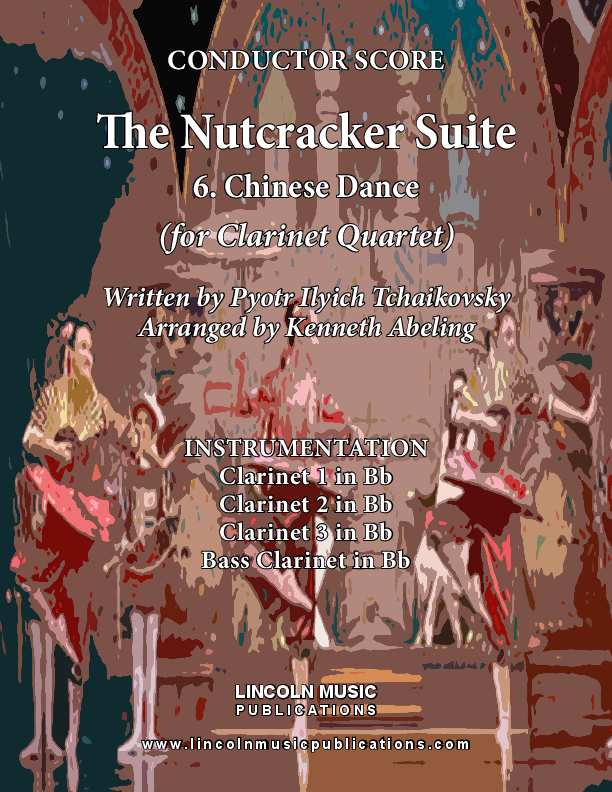 This arrangement is suitable for professional musicians and more experienced ensembles. 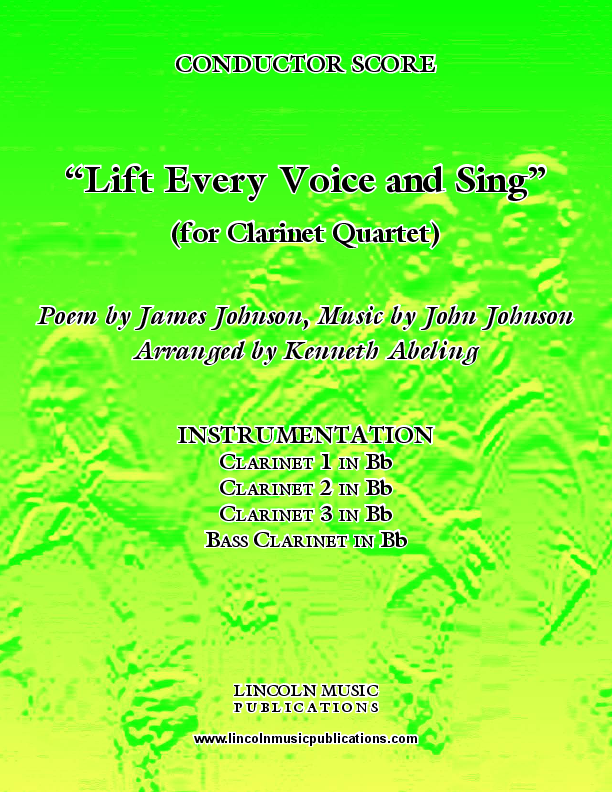 “Lift Every Voice and Sing”, by James & John Johnson and arranged here for Clarinet Quartet is a favorite spiritual! This is a relatively an easy to intermediate arrangement and is suitable for a variety of occasions. 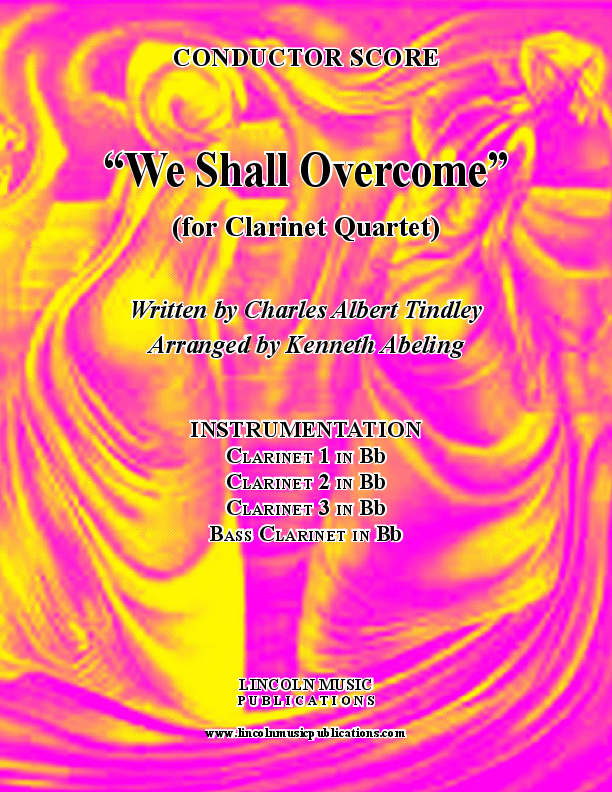 “We Shall Overcome”, by Charles Tindley is a favorite spiritual arranged here for Clarinet Quartet. This is a relatively easy arrangement and is suitable for a variety of occasions. 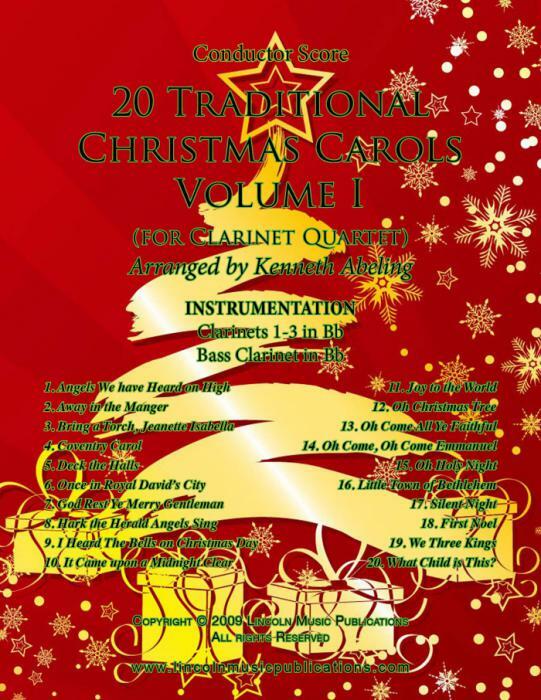 20 Traditional Christmas Carols for Clarinet Quartet Volume II contains 20 more popular Christmas Carols from around the world. 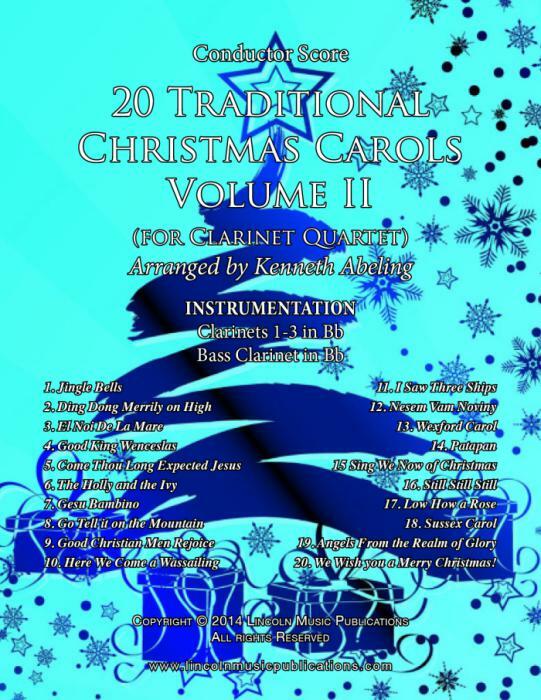 Table of Contents: Jingle Bells, Ding Dong Merrily on High, El Noi De La Mare, Good King Wenceslas, Come Thou Long Expected Jesus, The Holly and the Ivy, Gesu Bambino, Go Tell it on the Mountain, Good Christian Men Rejoice, Here We Come a Wassailing, I Saw Three Ships, Nesem Vam Noviny, Wexford Carol, Patapan, Sing We Now of Christmas, Still Still Still, Low How a Rose, Sussex Carol, Angels From the Realm of Glory, We Wish you a Merry Christmas! 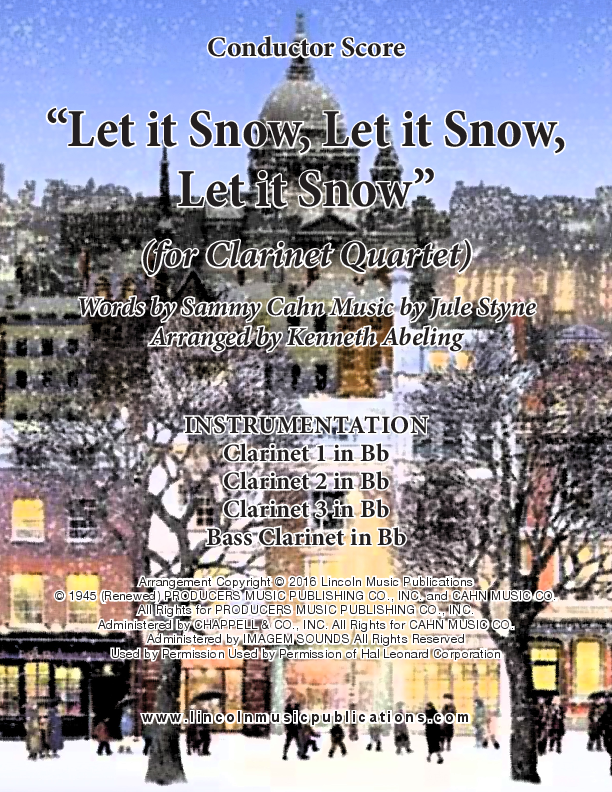 This is Jazz/Dixieland-ish arrangement of the traditional Christmas Carol “Go Tell it in the Mountain” for Clarinet Quartet It is suitable for professional musicians to somewhat more experienced ensembles. 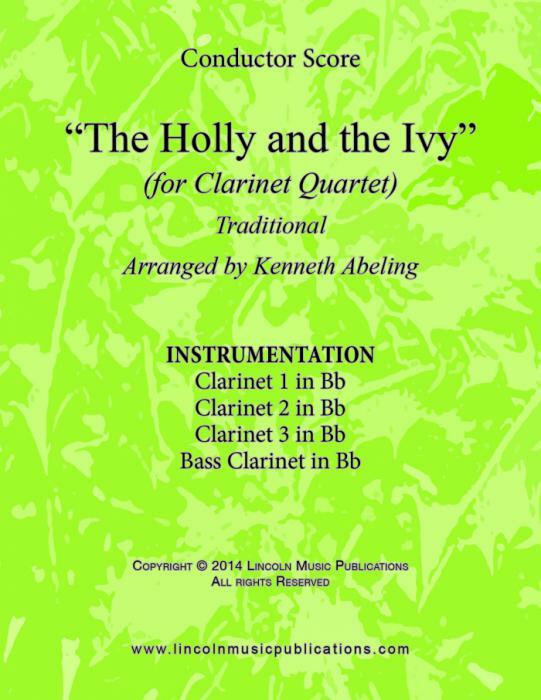 The very beautiful The Holly and the Ivy offered here for Clarinet Quartet will delight your audiences and your ensemble will enjoy playing it as well. 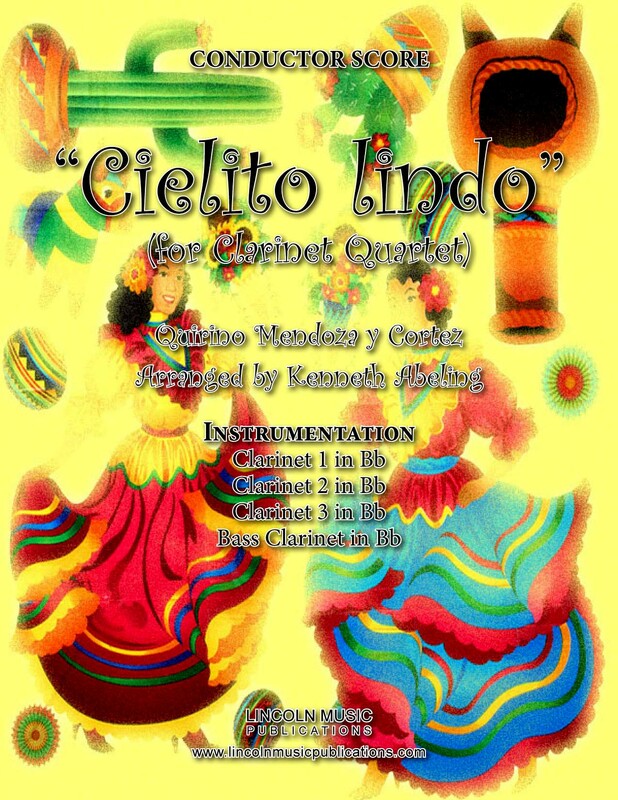 Cielito lindo is a Mexican classic, arranged here for Clarinet Quartet, and is suitable for many festive occasions. 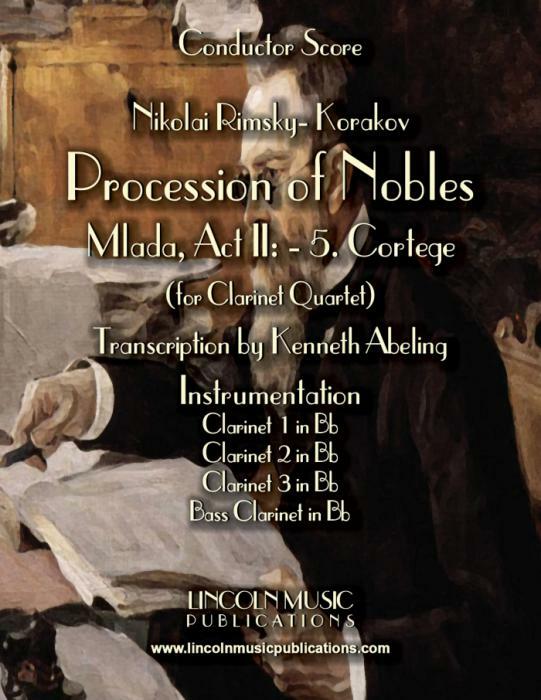 This is an easy to intermediate level arrangement but useful to advanced ensembles and nearly all audiences will recognize this priceless melody. 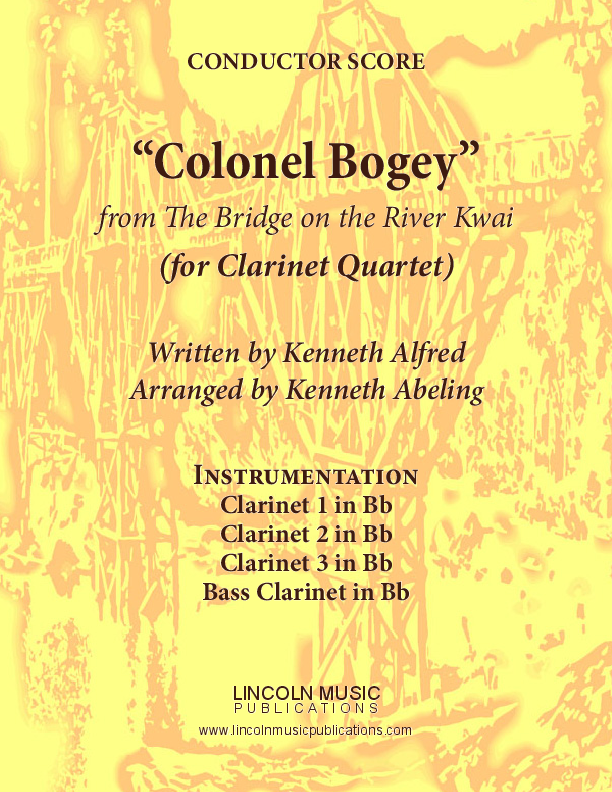 This is “Colonel Bogey” by Kenneth Alfred and featured in the 1957 Academy Award winning movie, The Bridge on the River Kwai. This is an intermediate level transcription for Clarinet Quartet and it’s originally whistled melody will be familiar to most who hear it! 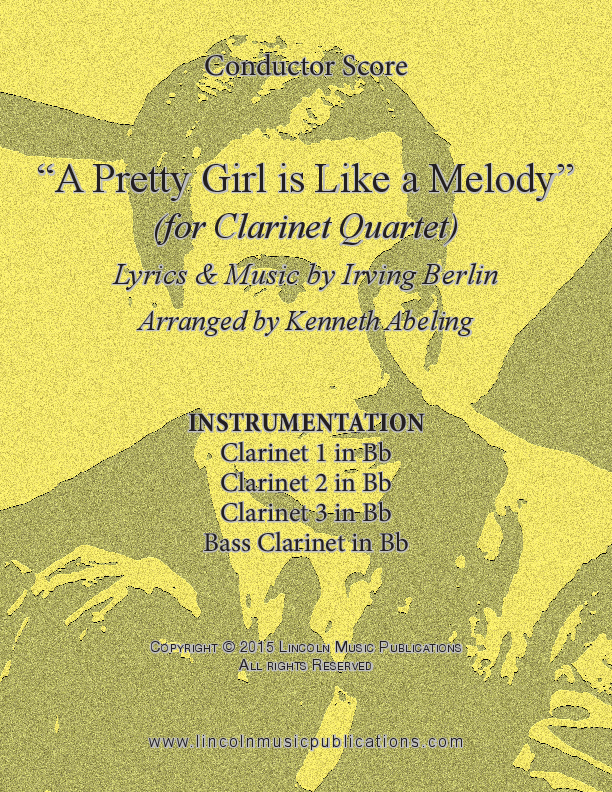 Irving Berlin’s lovely “A Pretty Girl is like a Melody” arranged here for Clarinet Quartet will please your audiences and your ensemble will enjoy playing it as well. 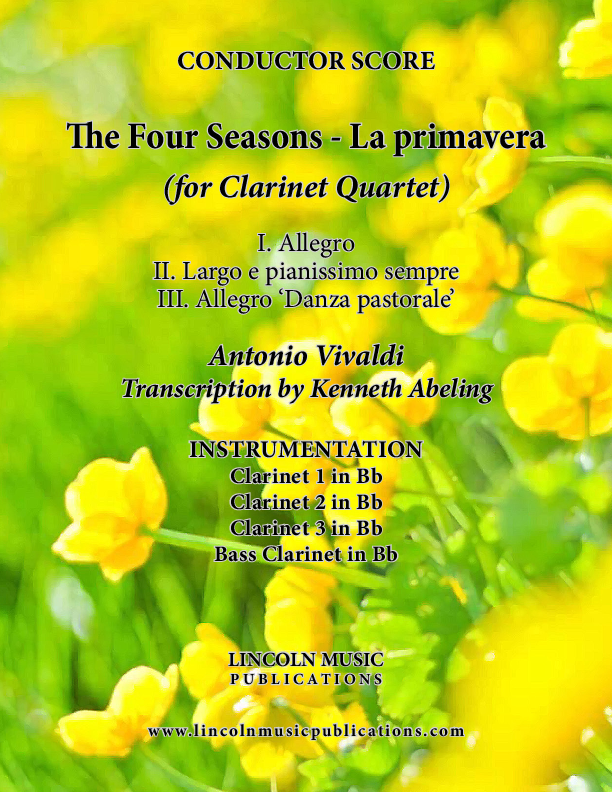 Perhaps one of Antonio Vivaldi’s most popular works, this is La primavera from The Four Seasons transcribed here for Clarinet Quartet. 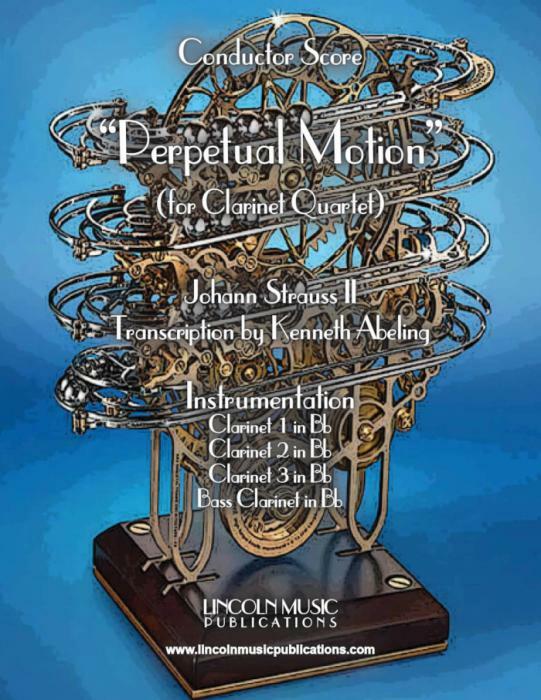 The movements of Concerto No. 1 (originally in E Maj), Op. 8, RV 269, “Spring” are: I. Allegro, II. Largo e pianissimo sempre and III. 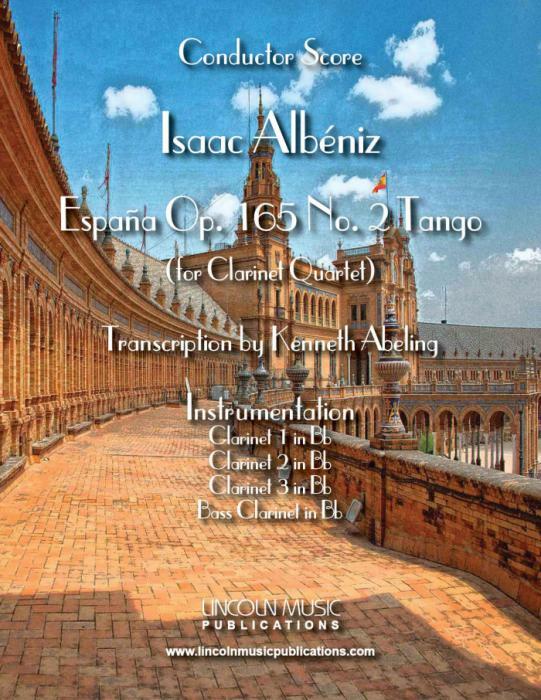 Allegro 'Danza pastorale'. 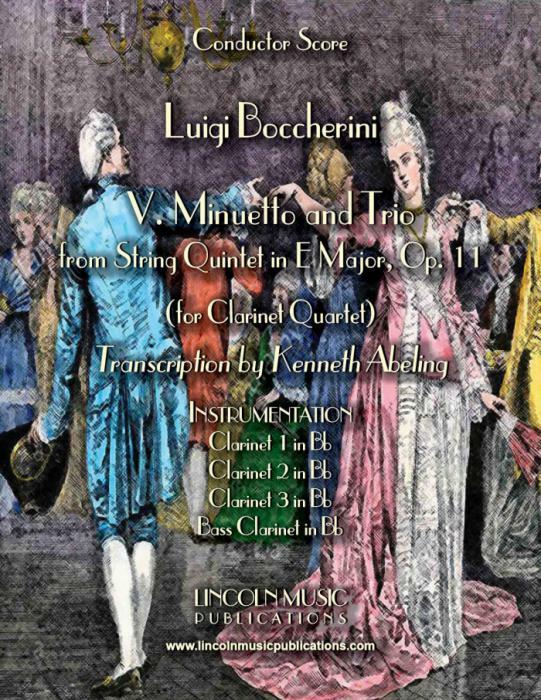 This Transcription is suitable for Advanced Intermediate musicians. 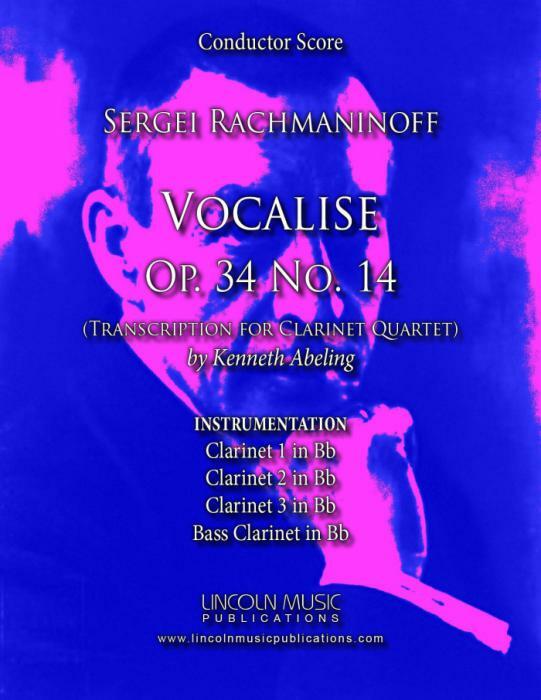 "Vocalise" by Sergei Rachmaninoff transcribed for Clarinet Quartet by Kenneth Abeling is the last of his 14 Romances in Opus 34. 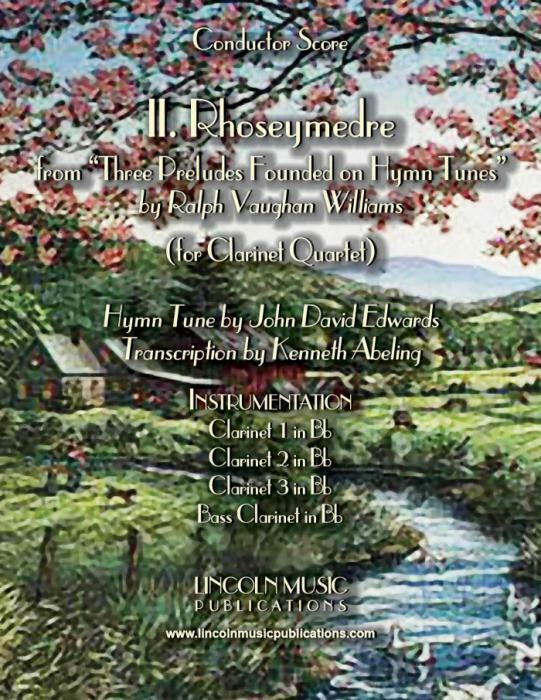 This is an Intermediate Level transcription and is suitable for many performance applications both secular and sacred. 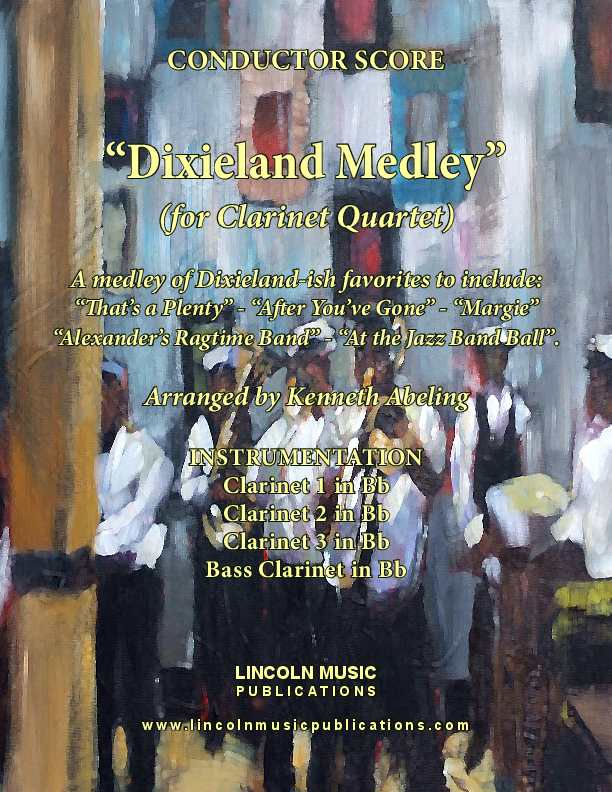 “Dixieland Medley” for Clarinet Quartet is a collection of five “Dixieland-ish” favorites to include: “That’s a Plenty”, “After You've Gone”, “Alexander's Ragtime Band”, “Margie” and “At the Jazz Band Ball”. This is an Advanced Intermediate arrangement. 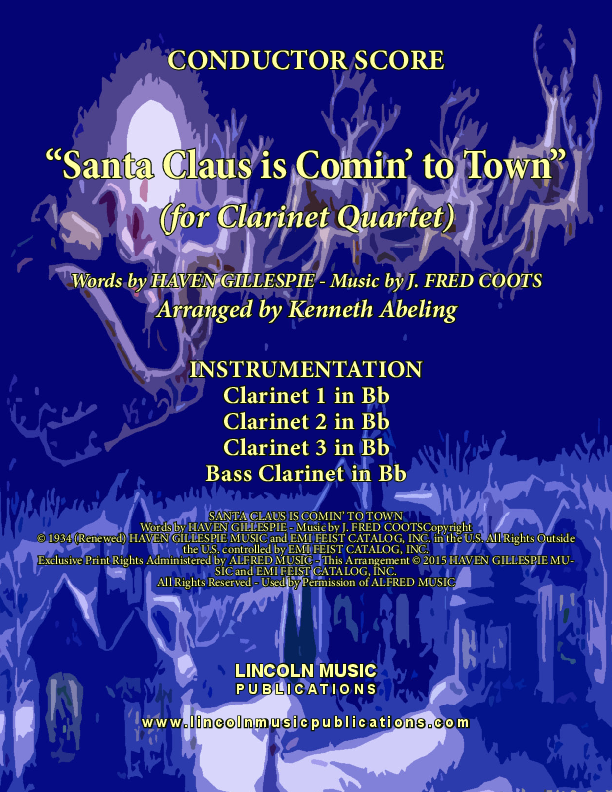 “Santa Claus is Comin’ to Town” for Clarinet Quartet is a Christmas favorite. 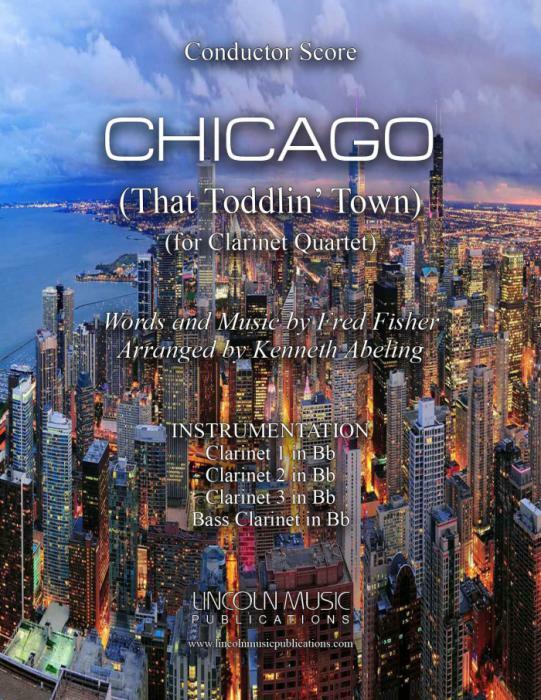 This Jazzy arrangement features lively soli and tutti sections to show off your ensemble and is certain to entertain your audiences! 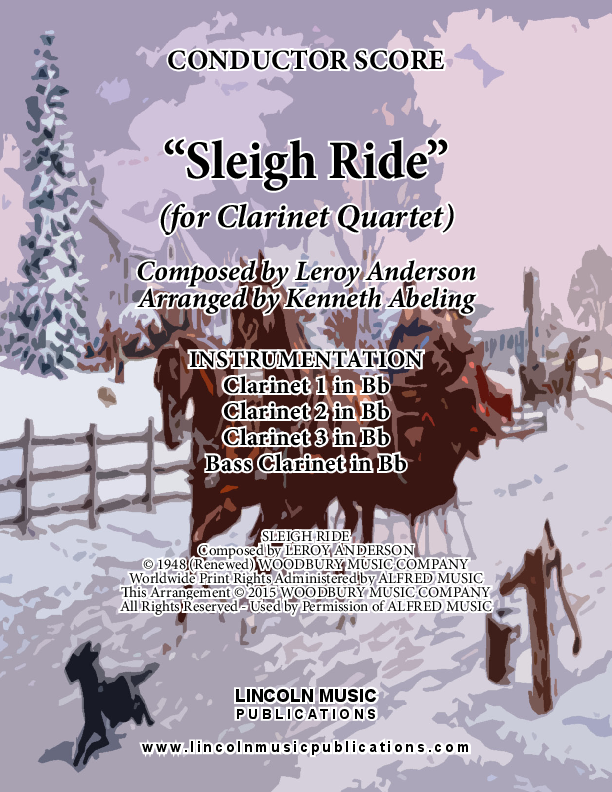 This challenging arrangement of “Sleigh Ride” for Clarinet Quartet is a faithful transcription of Leroy Anderson’s Christmas favorite that your audiences will adore! 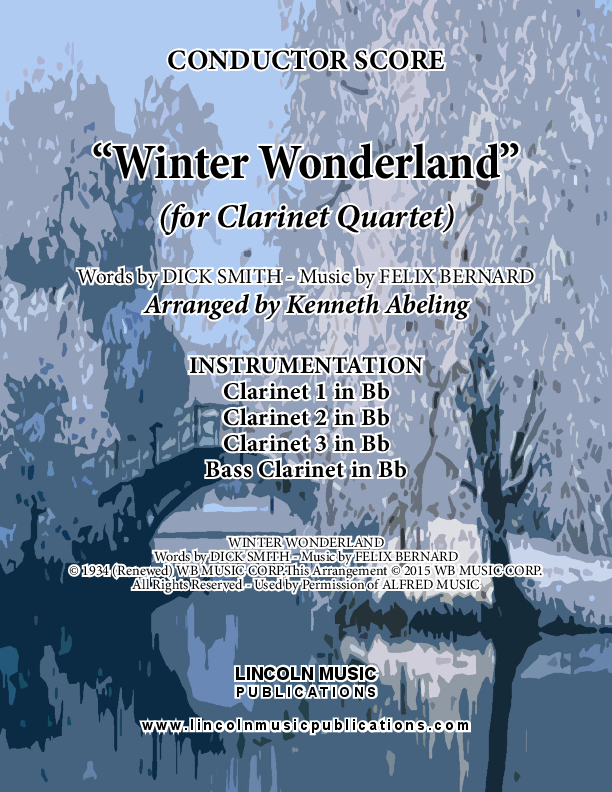 This rather elegantly simple arrangement of Smith & Bernard’s “Winter Wonderland” for Clarinet Quartet is both technically accessible to younger quartets and a useful lighter Christmas selection for more professional ensembles. 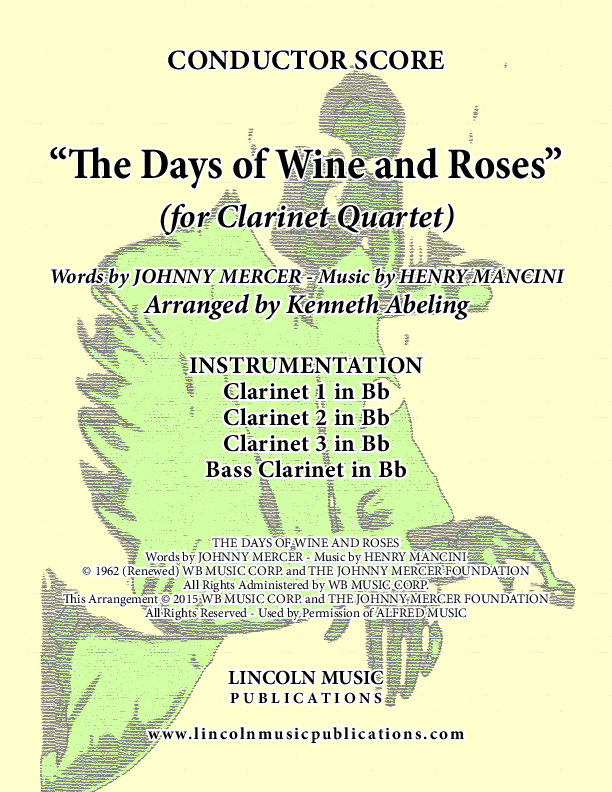 This somewhat challenging arrangement of Henry Mancini’s “The Days of Wine and Roses” for Clarinet Quartet is suitable for both concert performance or background music. 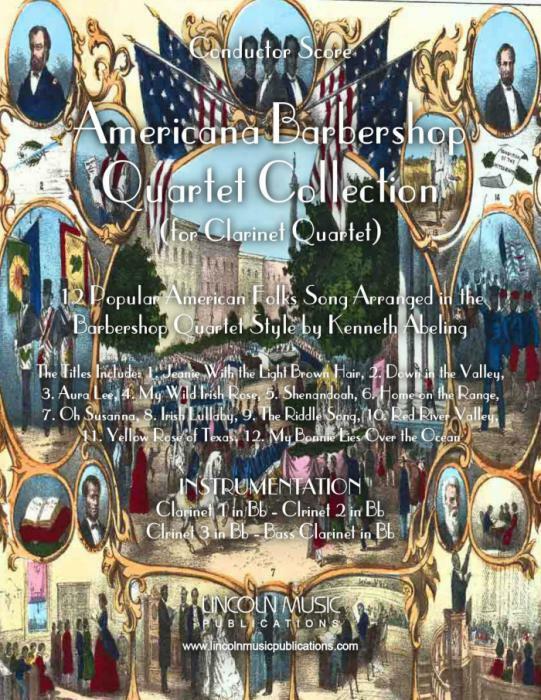 The melody is shared amongst all members of the quartet and the piece features tutti and soli sections that will showcase the precision of your quartet!
" 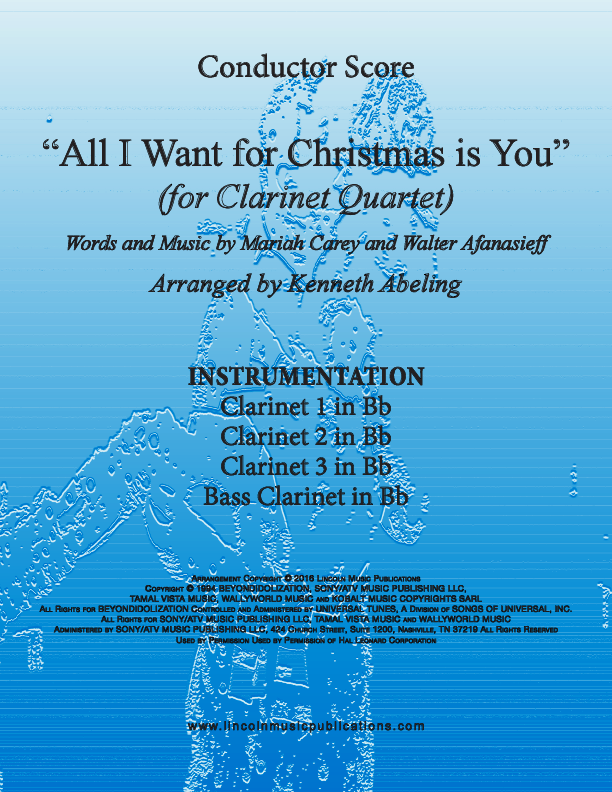 All I Want for Christmas is You" Words and Music by Mariah Carey and Walter Afanasieff and arranged here for Clarinet Quartet is a Pop Christmas staple. 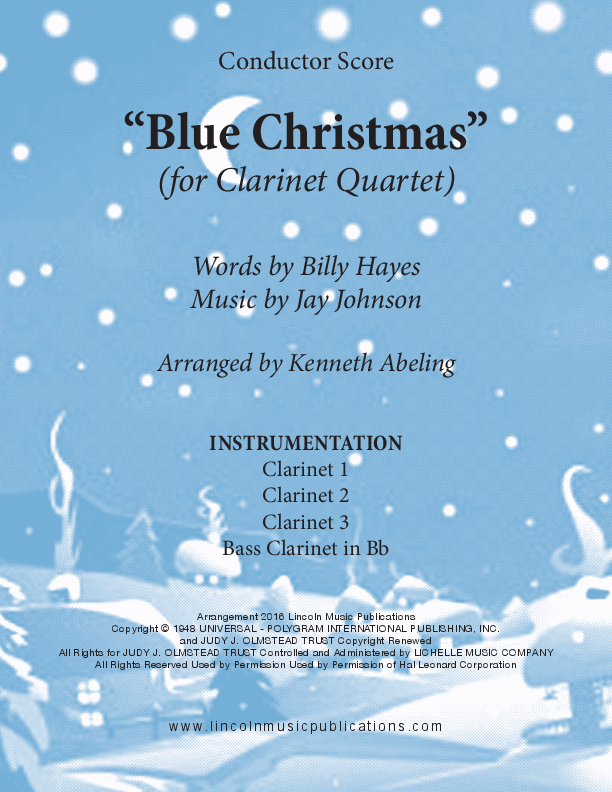 “Blue Christmas”, words and music by Billy Hayes and Jay Johnson and made famous by Elvis Presley arranged here for Clarinet Quartet. 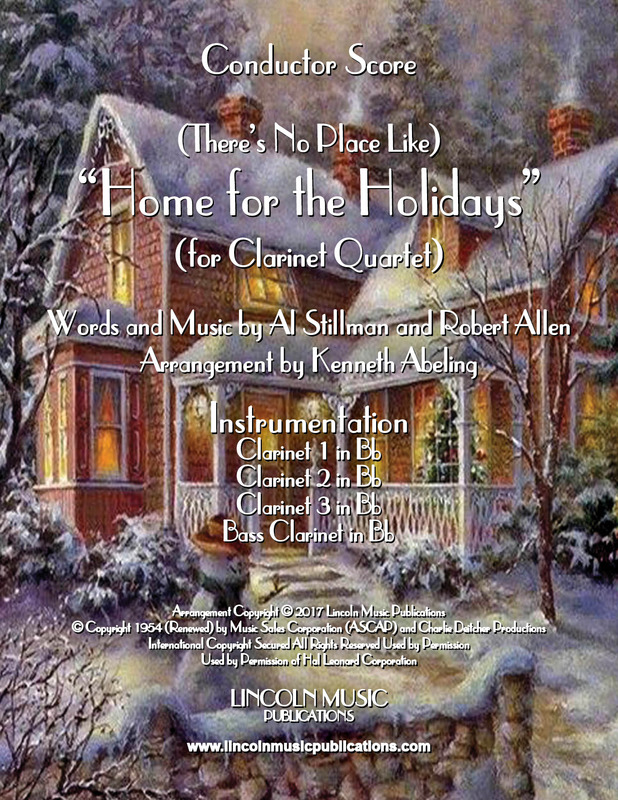 This arrangement of a perennial Christmas favorite and should be accessible by intermediate level ensembles. 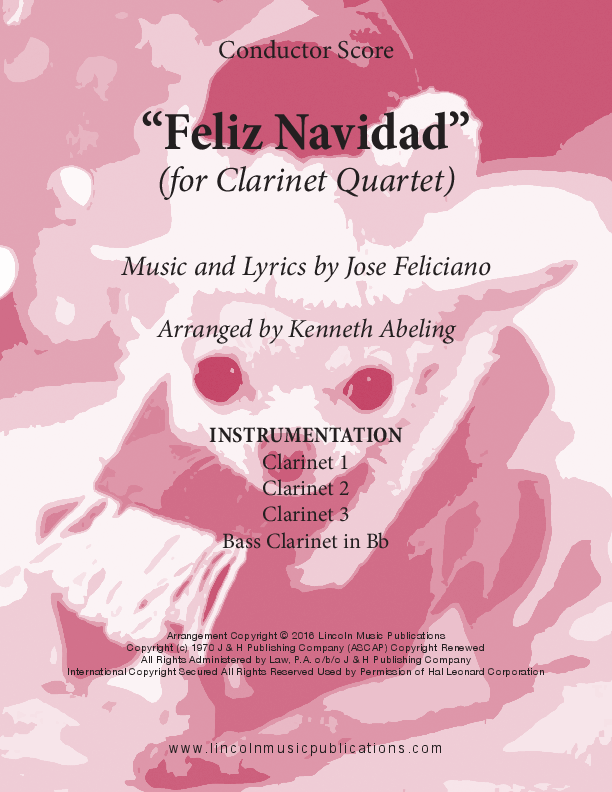 “Feliz Navidad”, words & music by Jose Feliciano arranged here for Clarinet Quartet is a Christmas time favorite. It’s a bit of a workout for the Bari Sax Player but it lies well on the instrument. 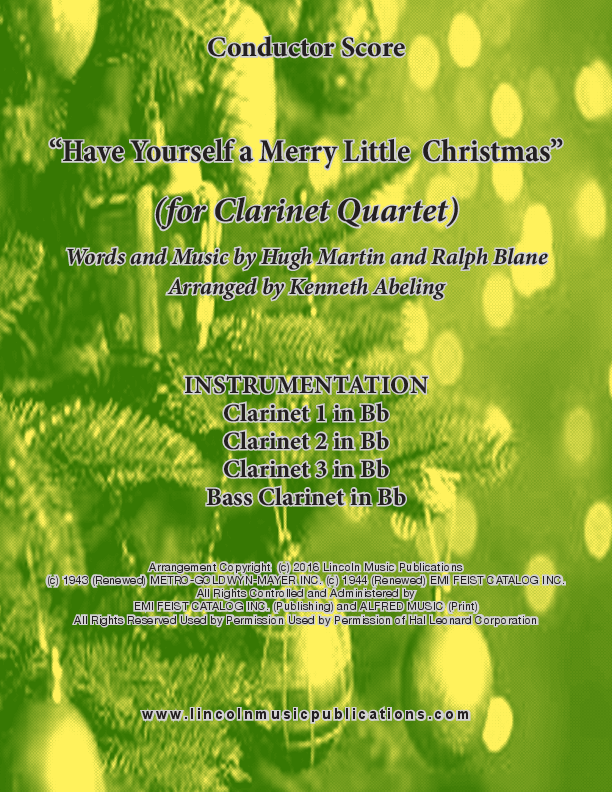 "Have Yourself a Merry Little Christmas " for Clarinet Quartet, Words and Music by Hugh Martin and Ralph Blane arranged here in a slow “bluesy” beguine. 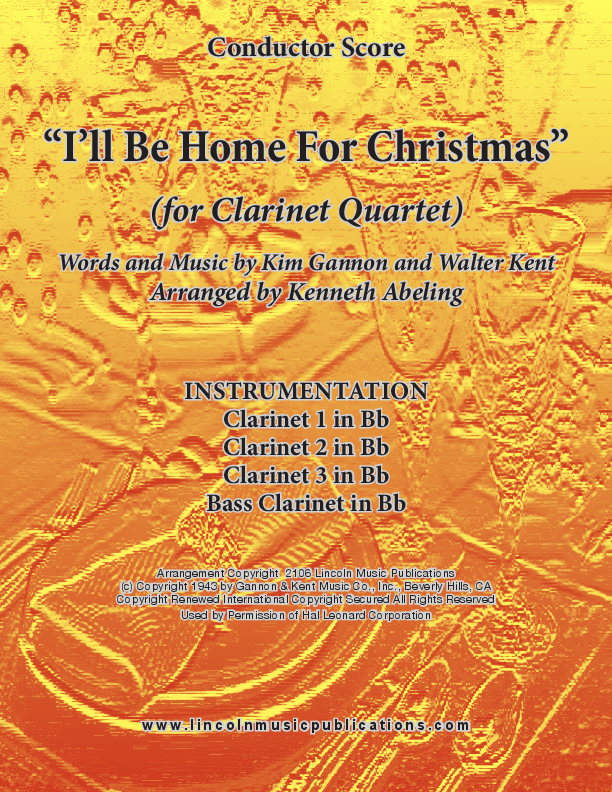 “I’ll Be Home For Christmas” arranged here for Clarinet Quartet, words and music by Kim Gannon and Walter Kent is another Christmas favorite. 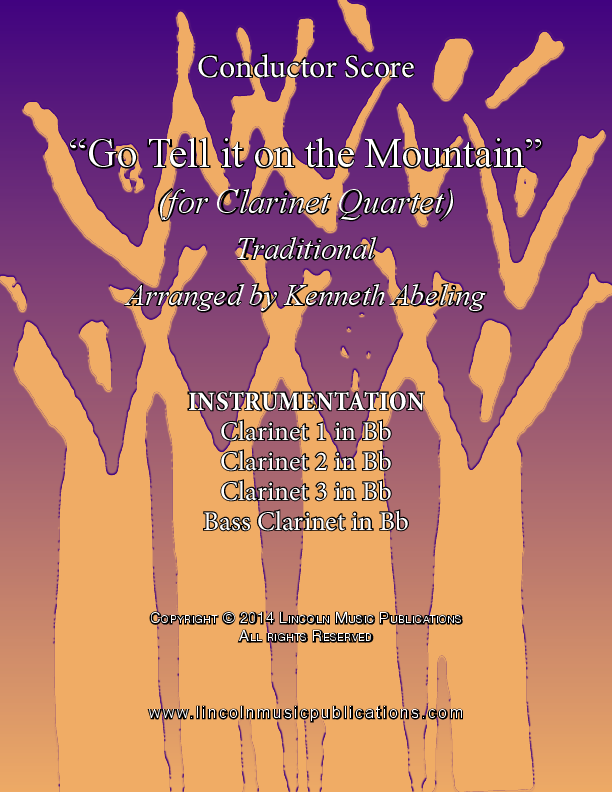 This arrangement is full of solos and playable by intermediate to advanced ensembles. "Let it Snow! Let it Snow! Let it Snow!" 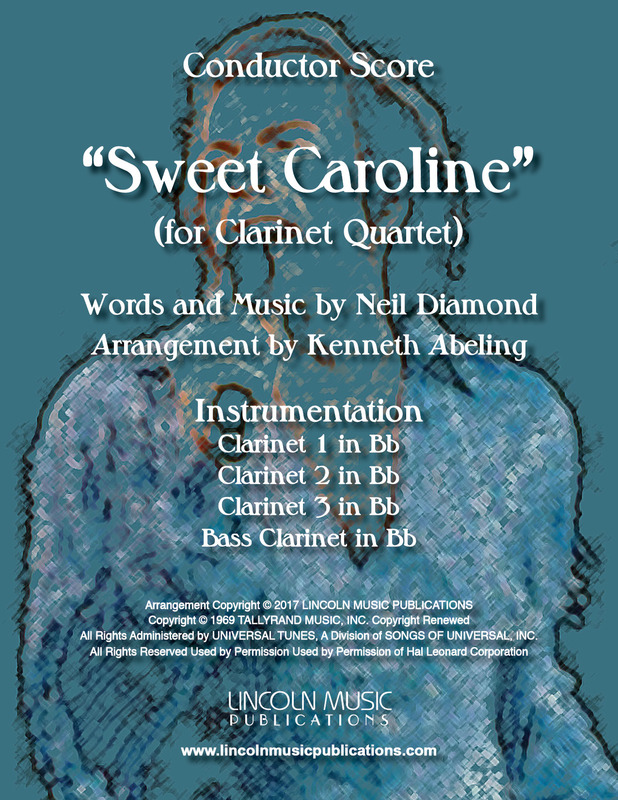 arranged here for Clarinet Quartet, Words by Sammy Cahn Music by Jule Styne is another Christmas favorite. 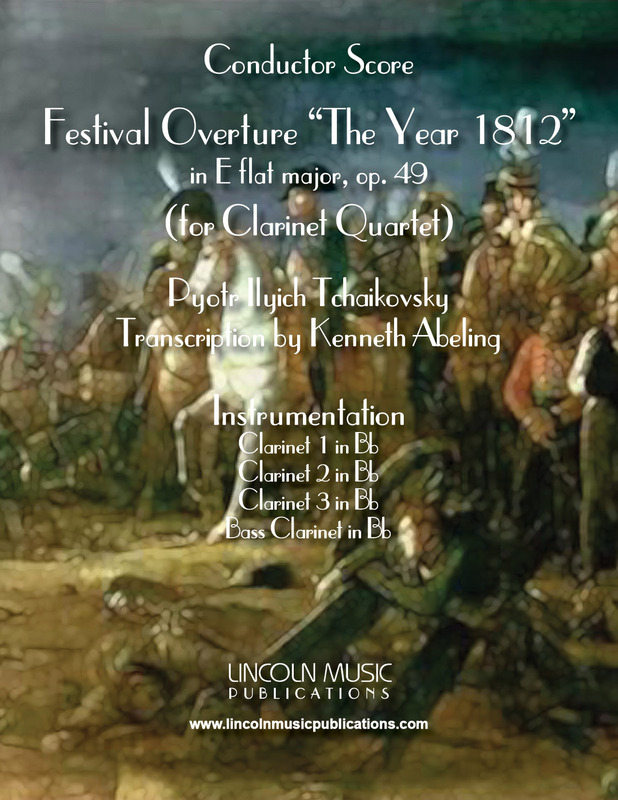 This arrangement is fun to play, has a little bit of everything, playable by intermediate to advanced ensembles and sure to be an ensemble and crowd pleaser. 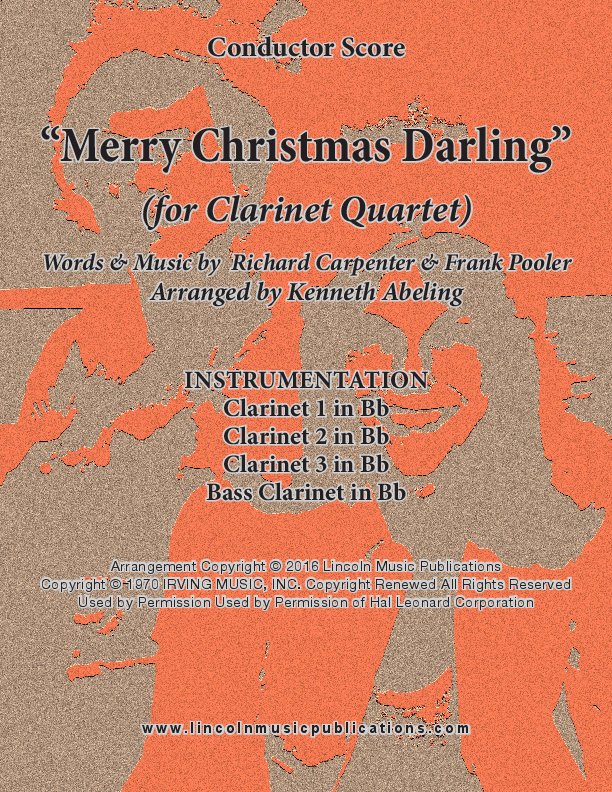 "Merry Christmas Darling" arranged here for Clarinet Quartet and made famous by The Carpenters is another Christmas classic. 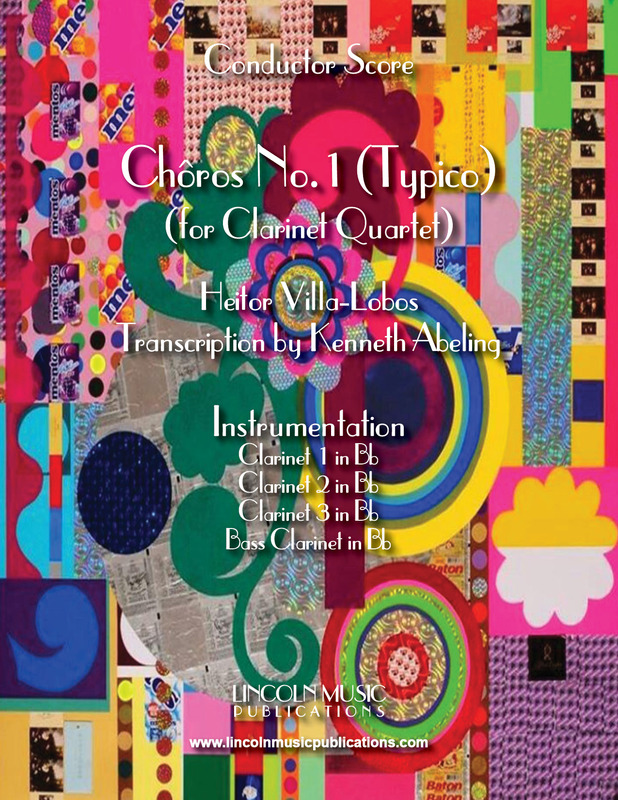 This is a lush, full arrangement playable by intermediate to advanced ensembles. 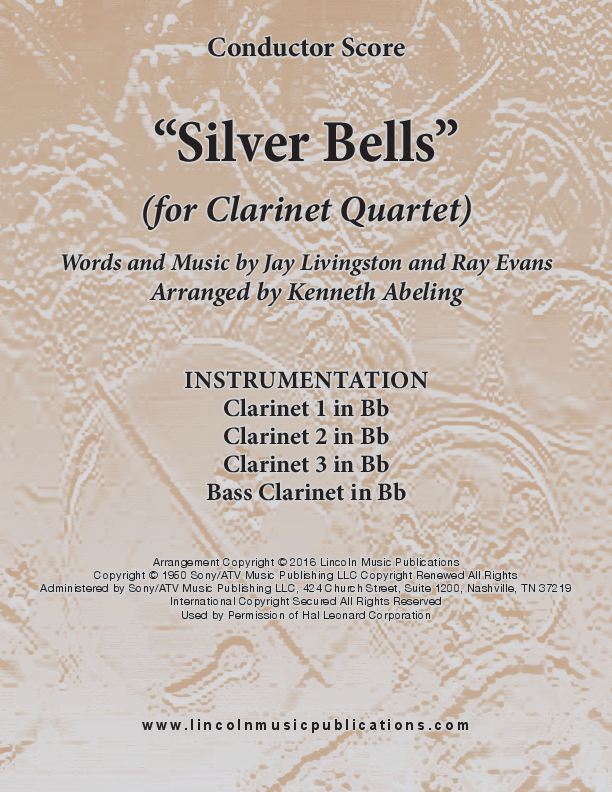 "Silver Bells" arranged here for Clarinet Quartet, words and music by Jay Livingston and Ray Evans is another perennial Christmas standard. This arrangement is characterized by dovetailing flowing counter lines and playable by intermediate to advanced ensembles. 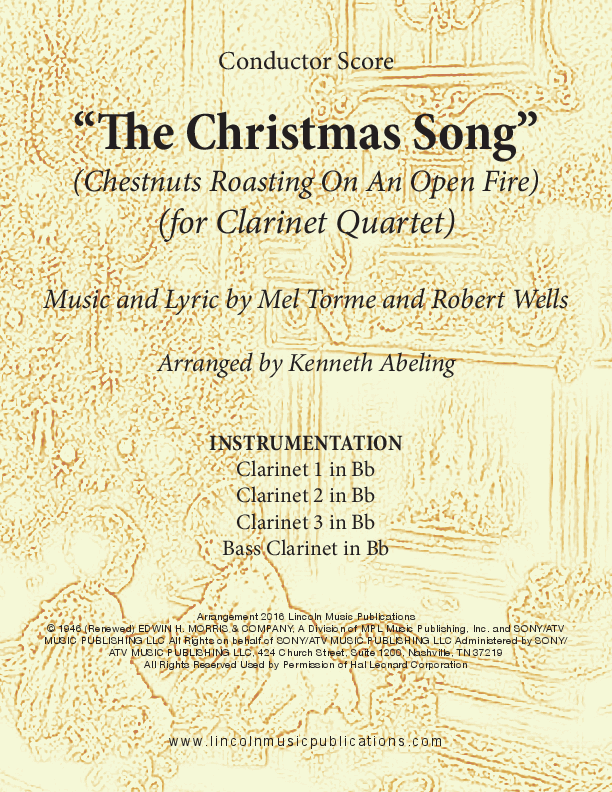 “The Christmas Song”, Music and Lyric by Mel Torme and Robert Wells is timeless Christmas Classic, arranged here for Clarinet Quartet. 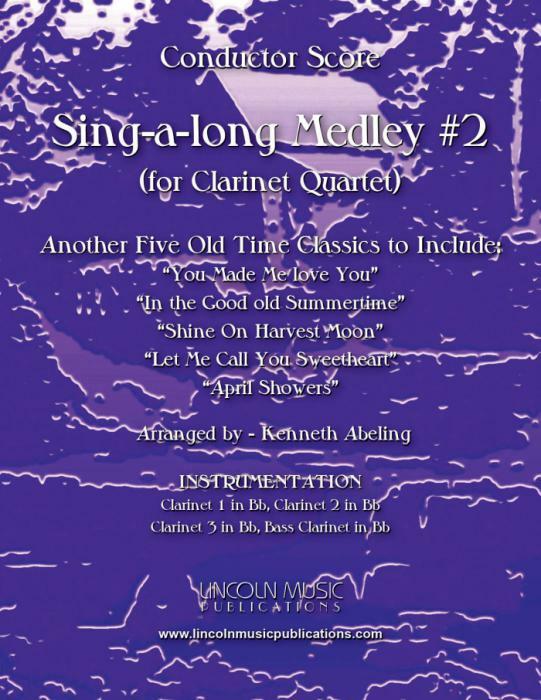 This arrangement features solos for the Soprano/Alto substitute and Tenor sax with a soli/tutti section and a double time break. 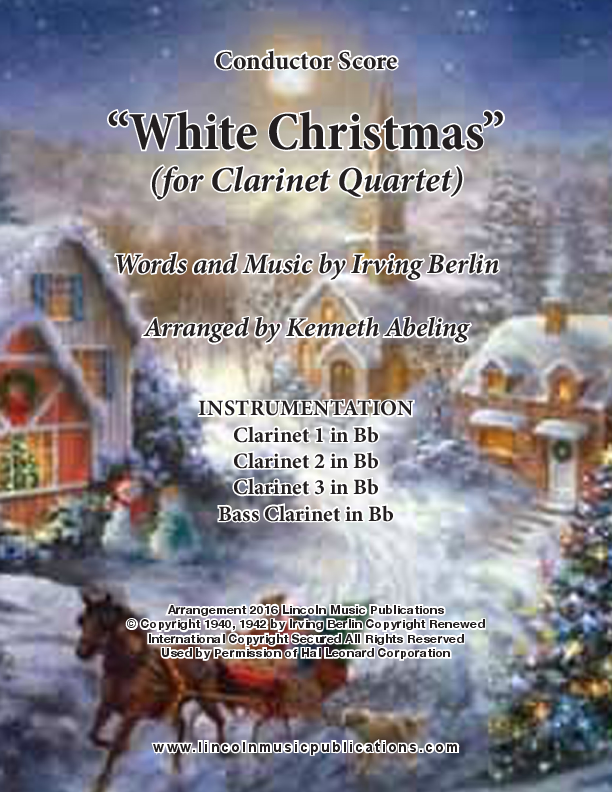 This is a rather easy arrangement of Irving Berlin’s “White Christmas” offered here for Clarinet Quartet. It is easily within reach of younger and less experienced groups but a nice “break” selection for more experienced ensembles. 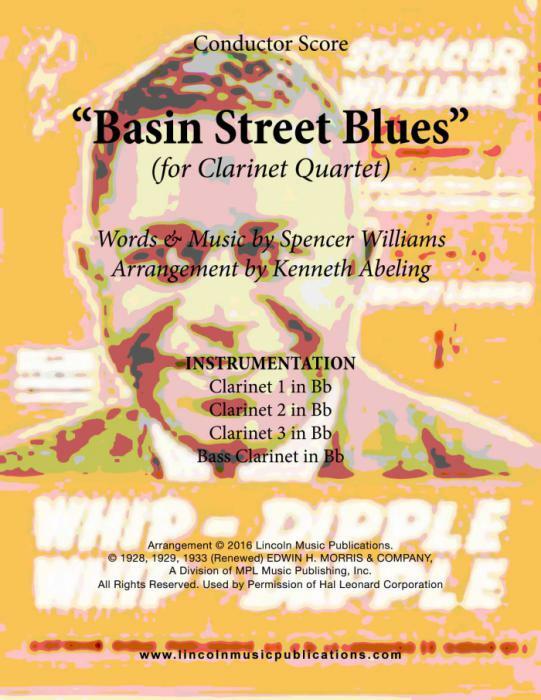 "Basin Street Blues" written by Spencer Williams, first published in 1926 and made famous by a Louis Armstrong recording in 1928 is a Dixieland favorite. 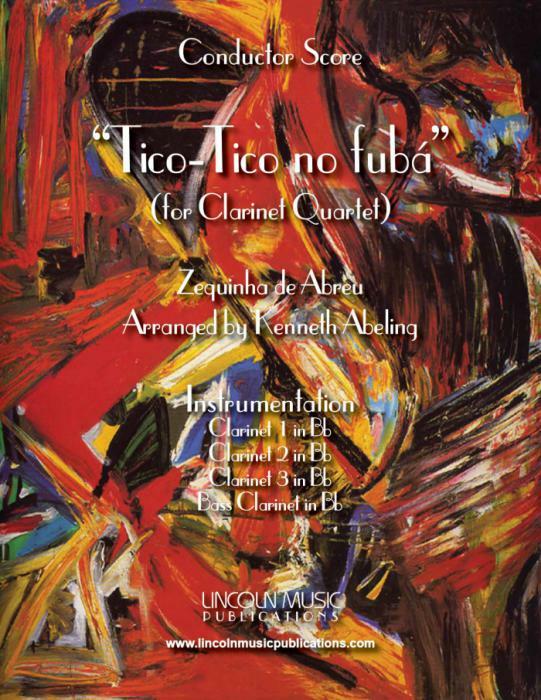 This arrangement for Clarinet Quartet features solo sections by all in the ensemble and a fun read for the professional Quartet while still being accessible to younger or less experienced musicians. 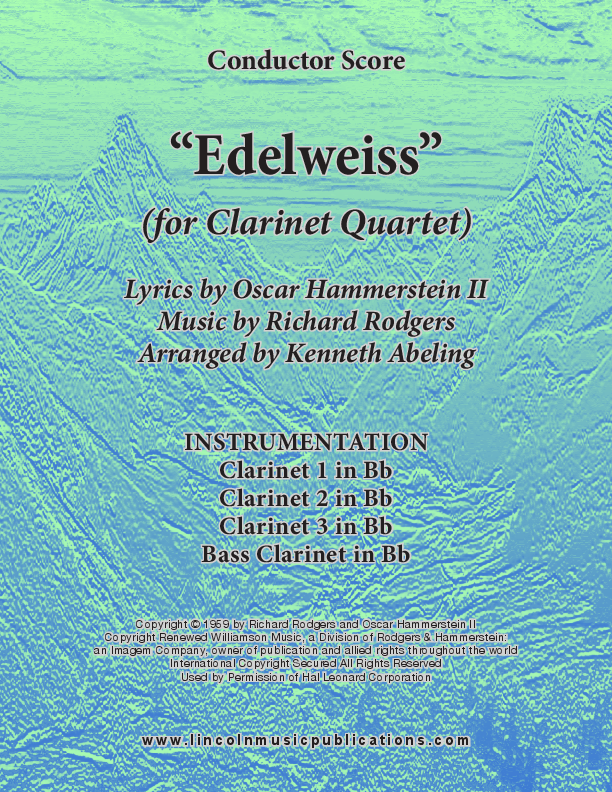 “Edelweiss” arranged here for Clarinet Quartet. 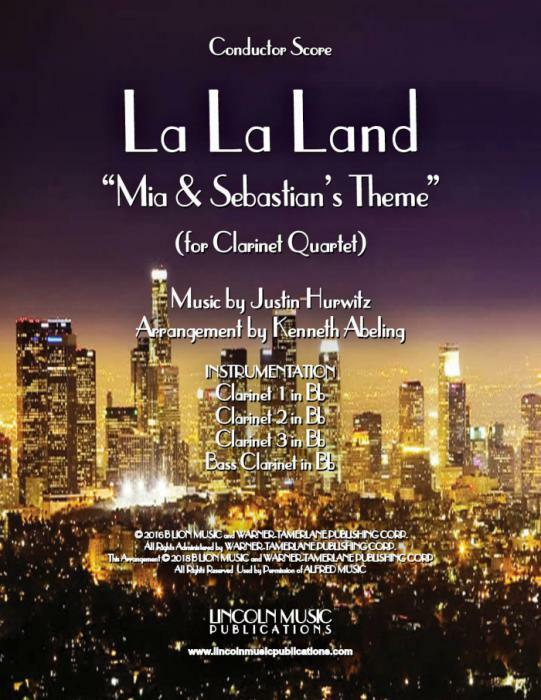 This is an intermediate level arrangement of Richard Rodgers and Oscar Hammerstein lovely melody from “The Sound of Music”. 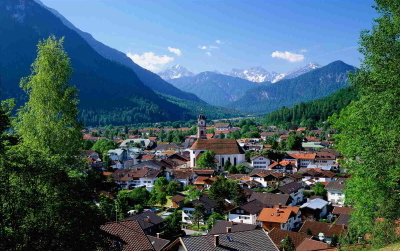 This song and arrangement are very suitable to Oktoberfest and similar performances. 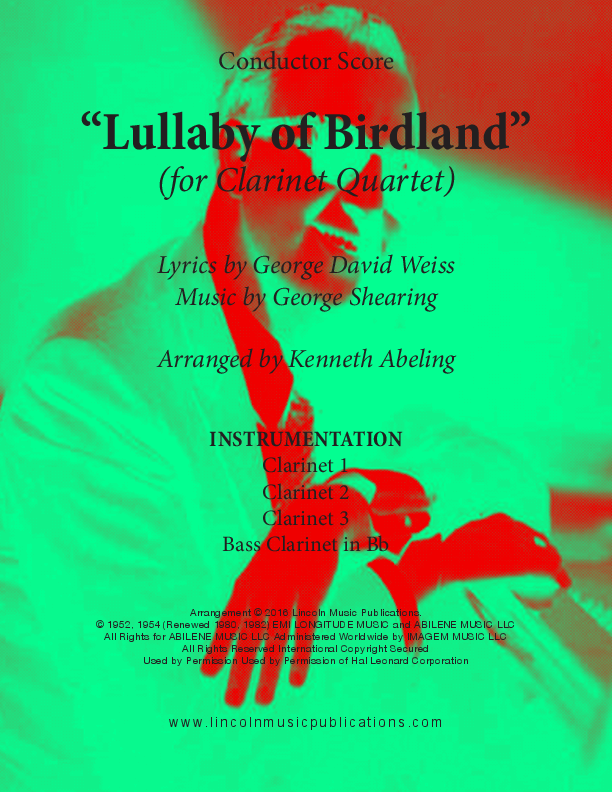 This is an advanced arrangement for Clarinet Quartet of George Shearing's "Lullaby of Birdland". 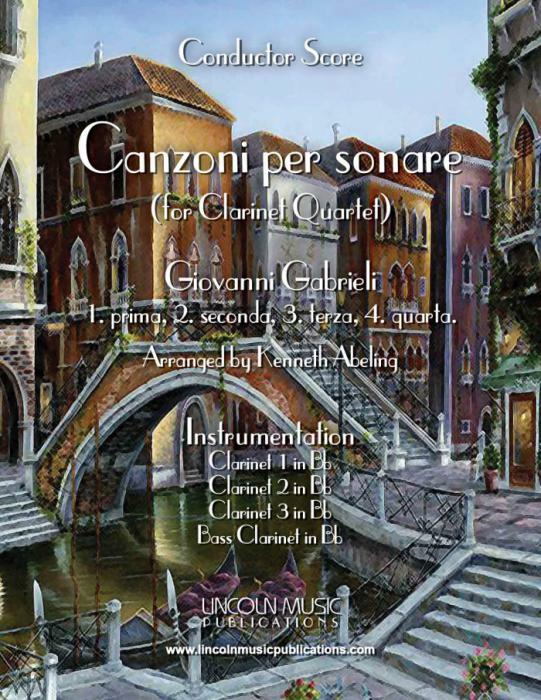 The arrangement features individual solos as well as numerous soli and tutti sections and while a little challenging, it is a lot of fun to play. 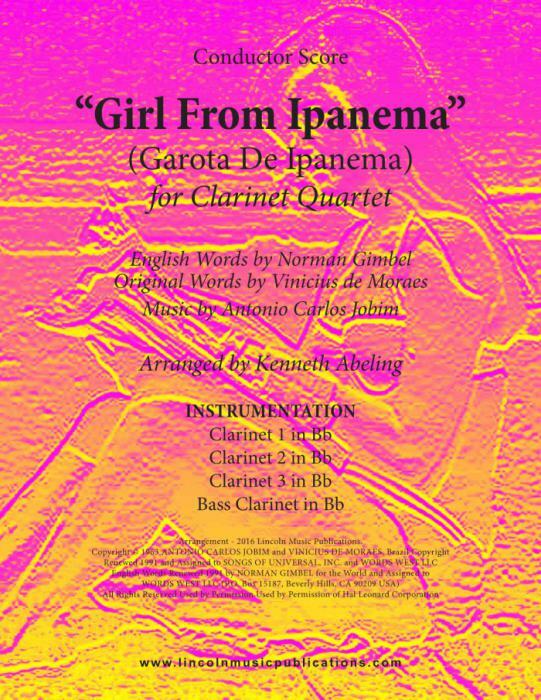 "The Girl From Ipanema" by Antonio Carlos Jobim, arranged here for Clarinet Quartet, is a staple in any professional quartets Jazz repertoire. 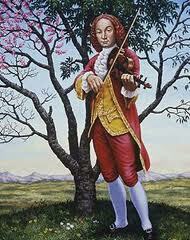 However, this arrangement is still accessible to younger or less experienced Quartets. 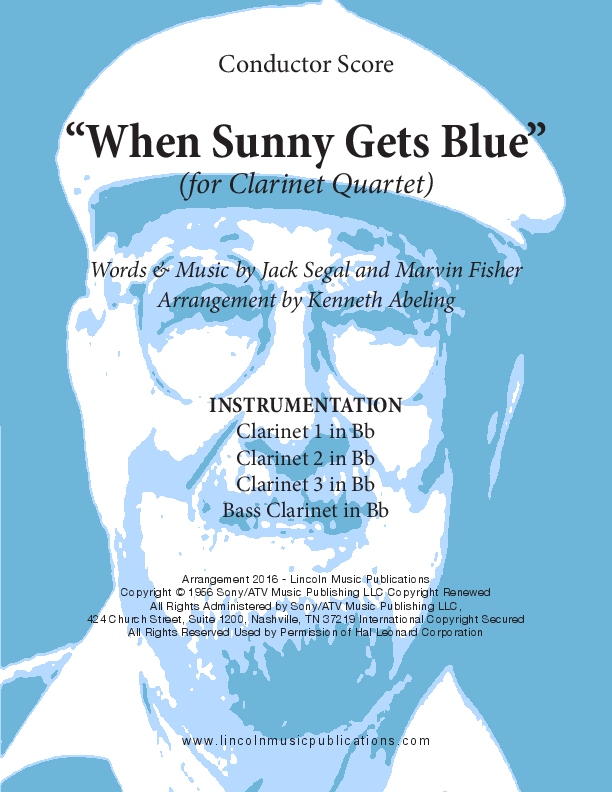 "When Sunny Gets Blue", music by Marvin Fisher and arranged here for Clarinet Quartet, is a timeless classic and a "must have" in any professional quartets Jazz library. 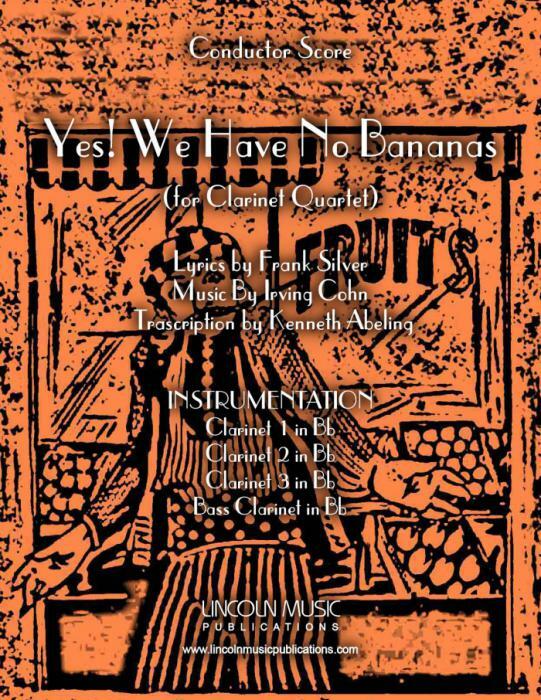 This arrangement is also playable by younger or less experienced Quartets. 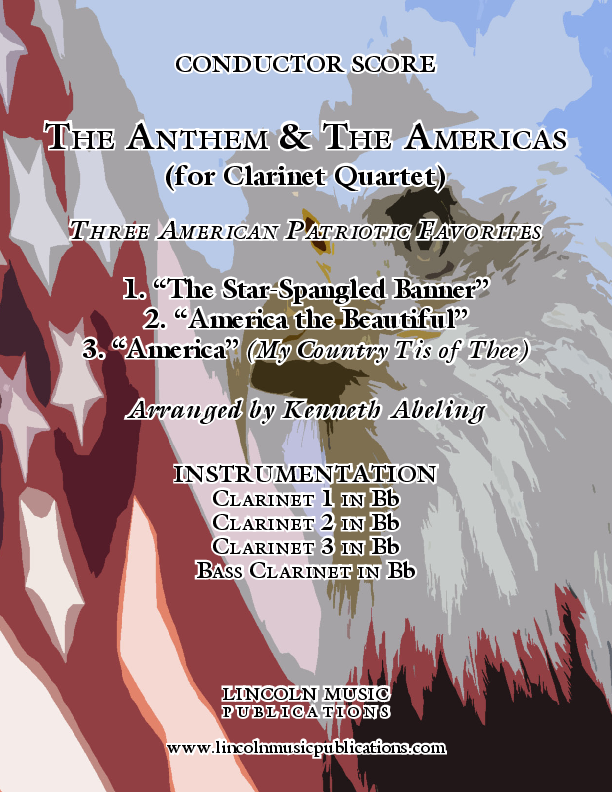 Three Popular Patriotic and Ceremonial favorites to include: “The Star-Spangled Banner”, “America the Beautiful” and “America” (My Country Tis of Thee) arranged here for Clarinet Quartet. 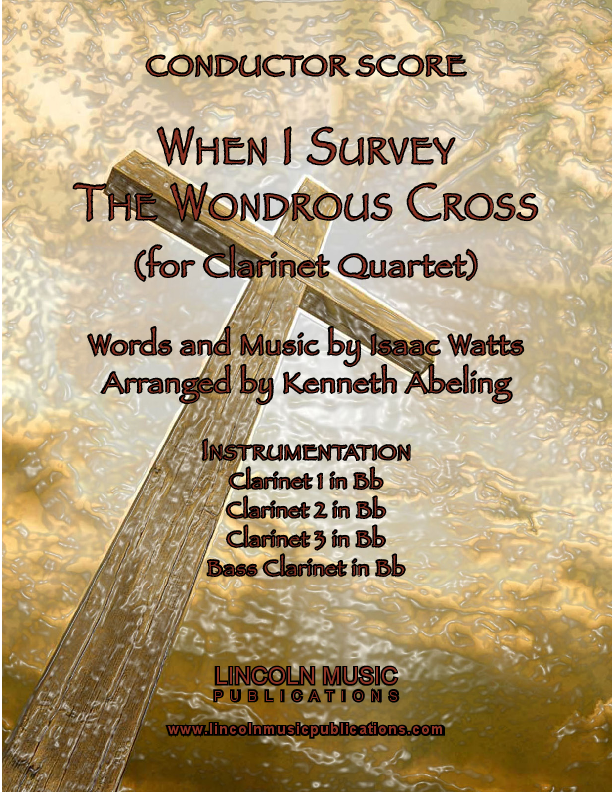 “When I Survey the Wondrous Cross” by Isaac Watts arranged here for Clarinet Quartet is a favorite Easter time hymn. 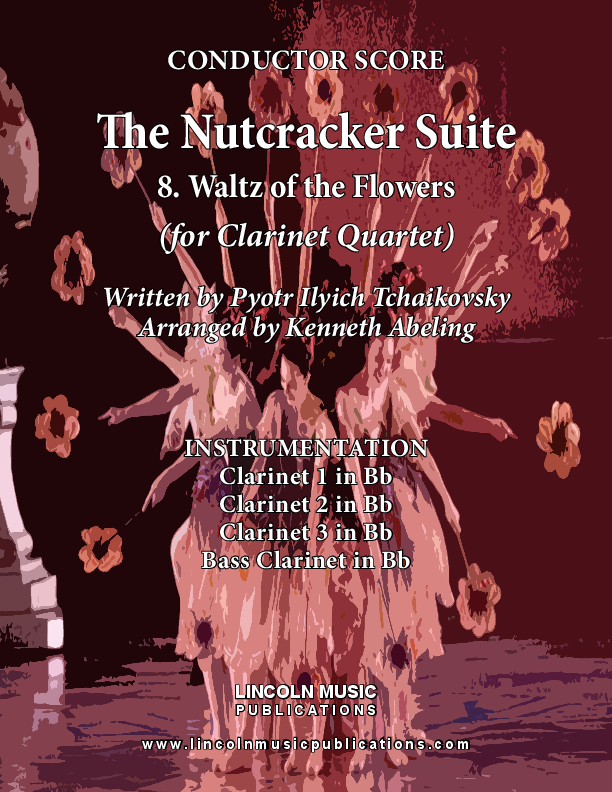 This intermediate arrangement is a more modern treatment of the timeless classic. 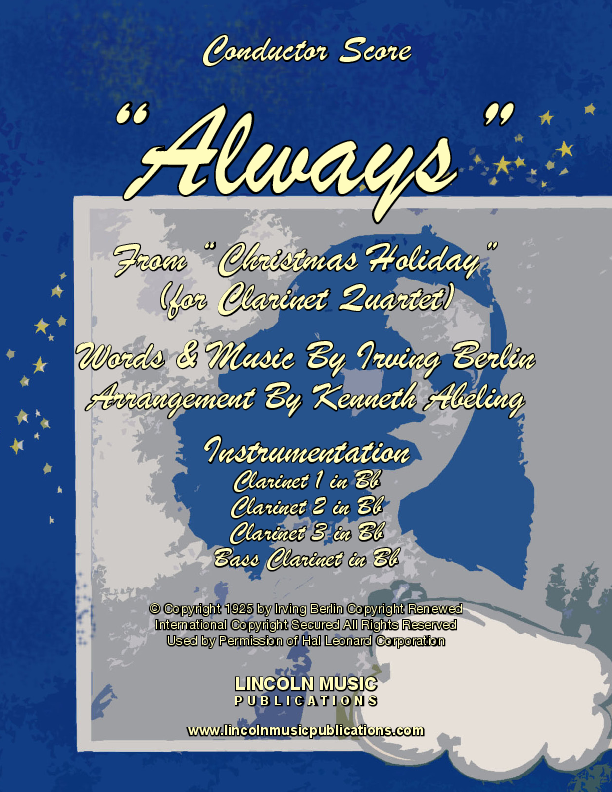 This is Irving Berlin’s “Always” for Clarinet Quartet from Christmas Holiday. 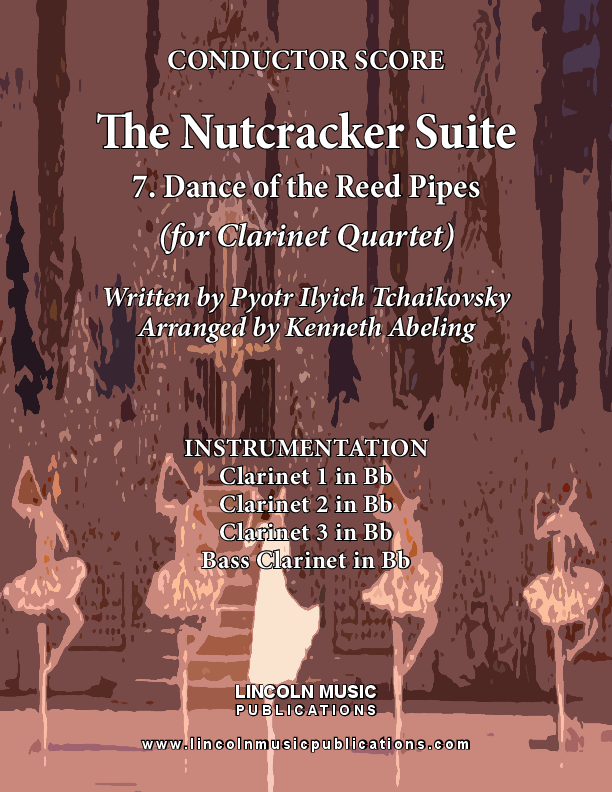 This lovely song is appropriate for various occasions including Weddings and Christmas and the arrangement is of intermediate level difficulty. 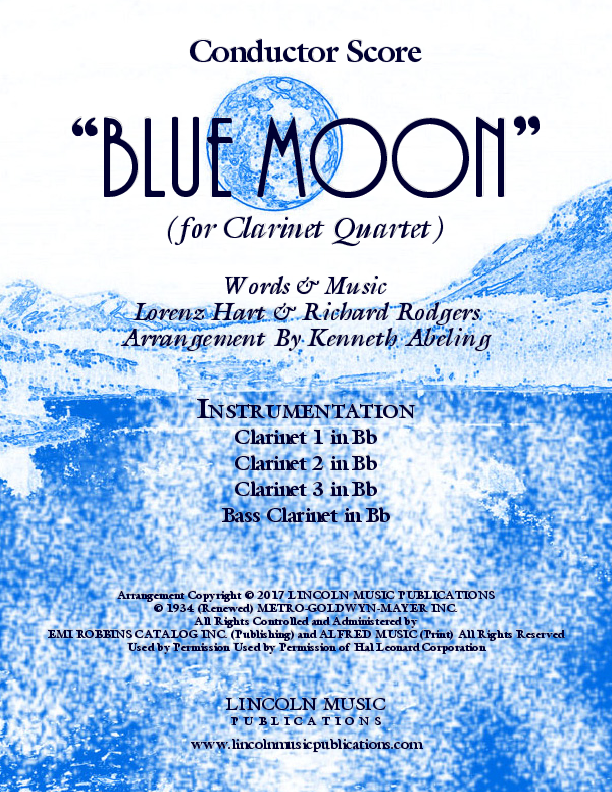 “Blue Moon” by Lorenz Hart & Richard Rodgers, arranged here for Clarinet Quartet, is an ageless standard most audiences will remember. 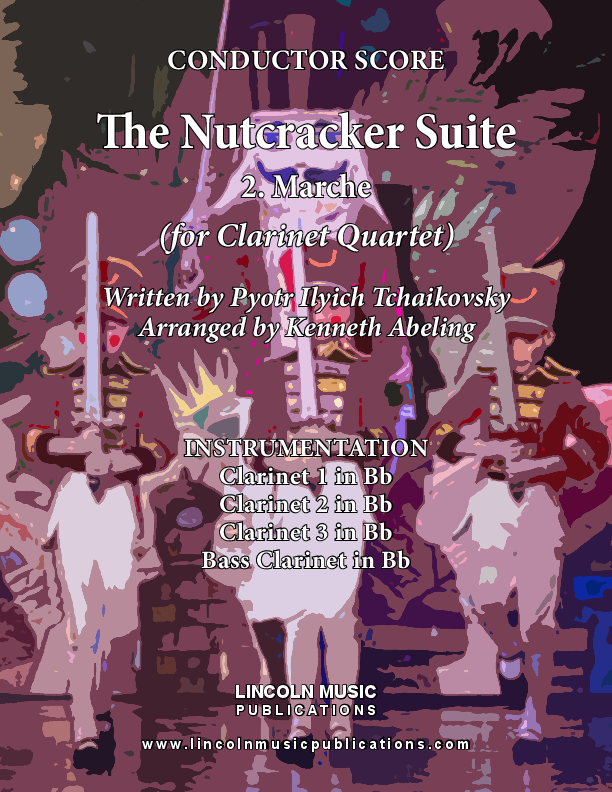 This is an intermediate to advanced intermediate level arrangement depending on the ensemble you choose. 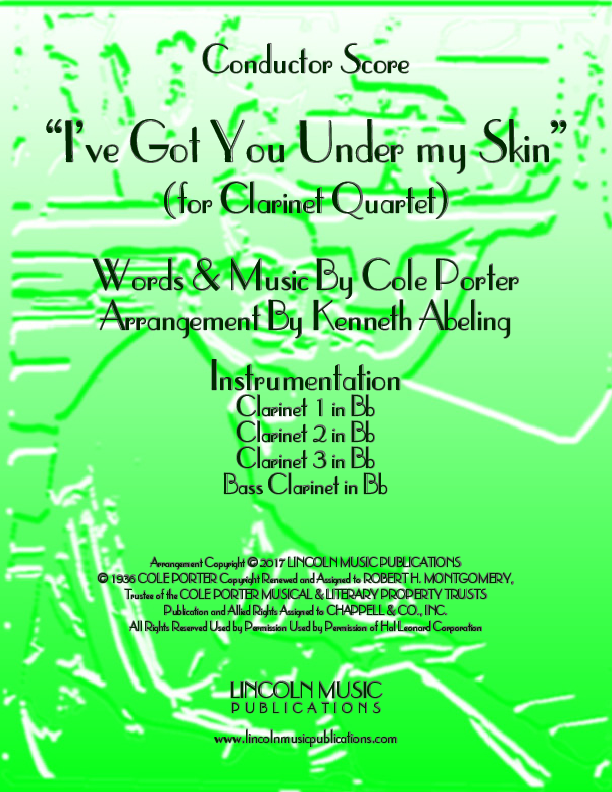 Cole Porter’s romantic, “I’ve Got You Under My Skin” for Clarinet Quartet. 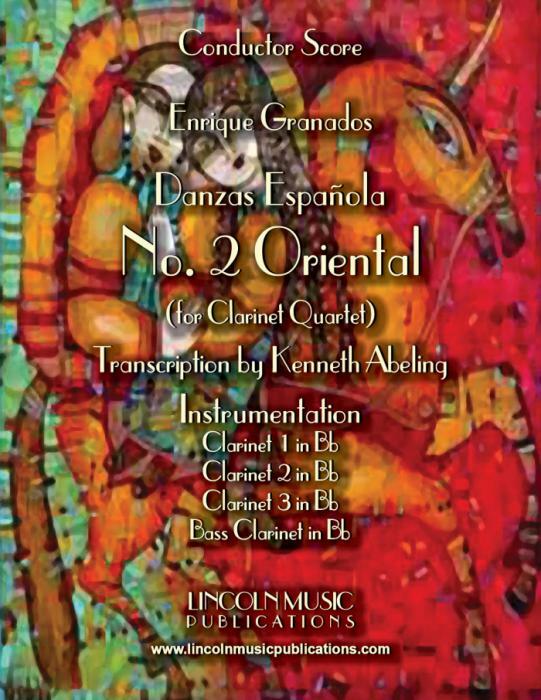 This arrangement is in a “Latin feel” and a good device for learning 2 against 3 & 3 against 4. Intermediate and professional players will both find this chart useful. 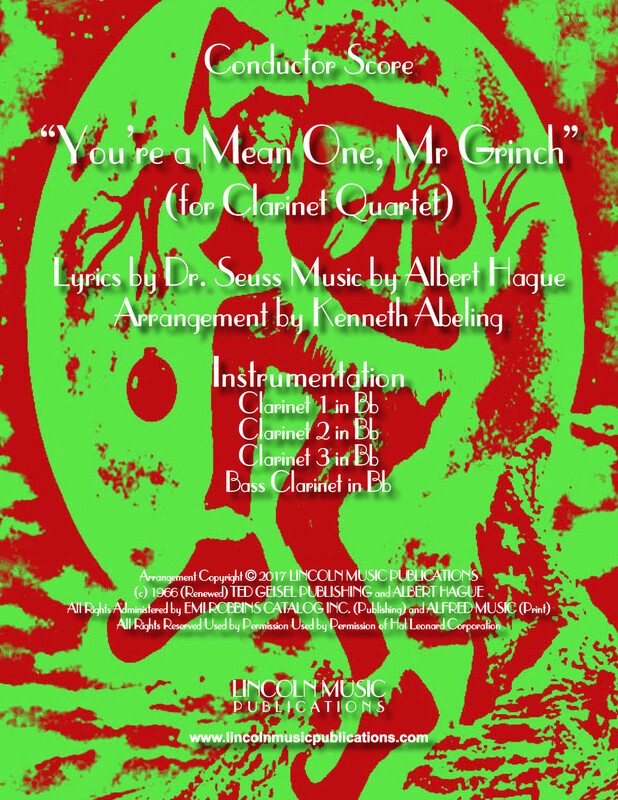 “You're A Mean One, Mr. Grinch" arranged here for Clarinet Quartet. 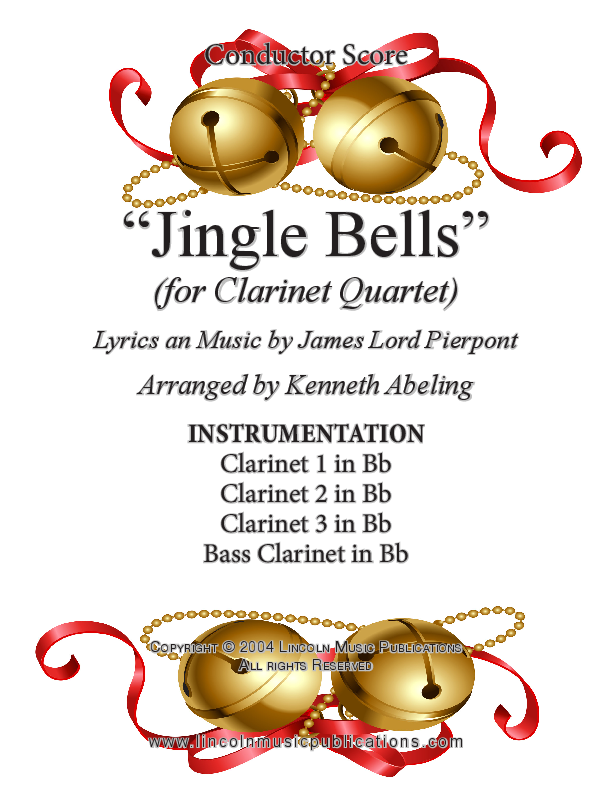 This is an intermediate to advanced intermediate level arrangement of a humorous Christmas time favorite. 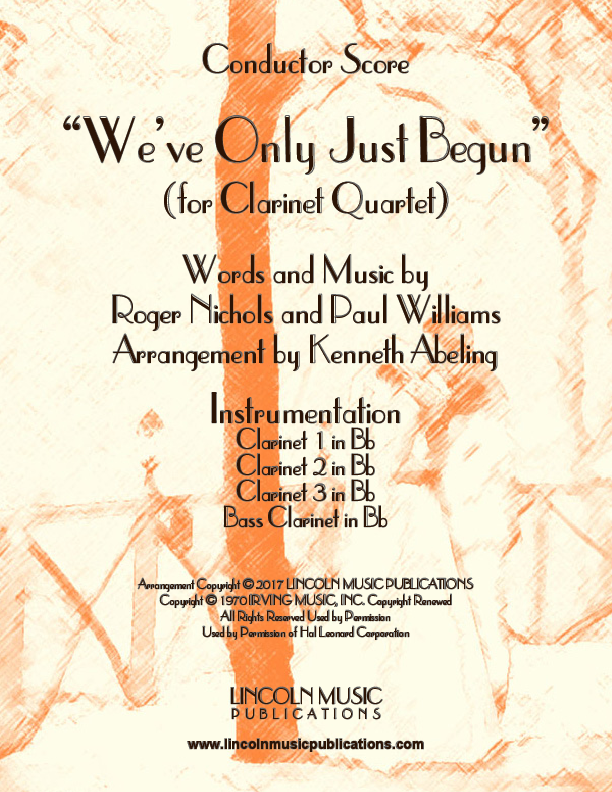 "We've Only Just Begun", Words and Music by Roger Nichols and Paul Williams, and made popular by the Carpenters is a Wedding favorite, arranged here for Clarinet Quartet. 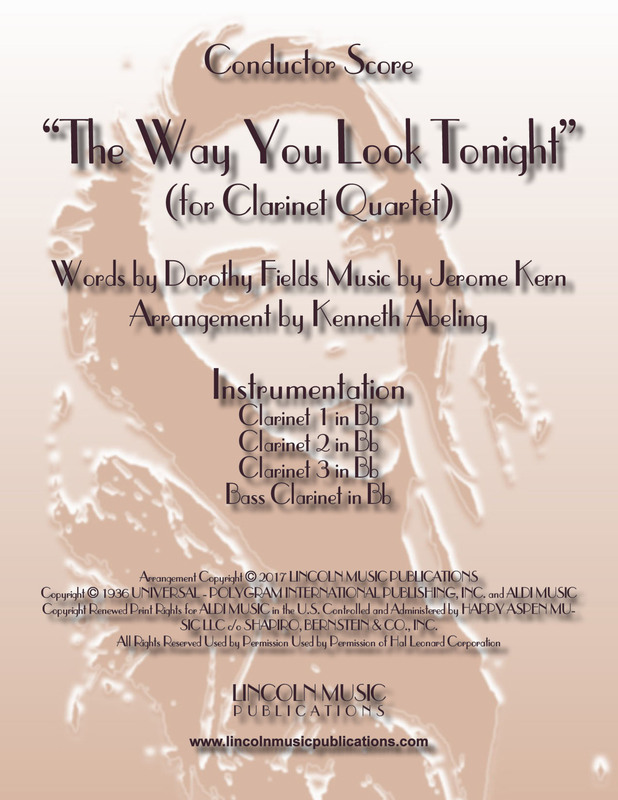 “The Way You Look Tonight”, Words by Dorothy Fields Music by Jerome Kern for Clarinet Quartet. This is an intermediate to advanced intermediate level arrangement through professional players will enjoy playing it as well. 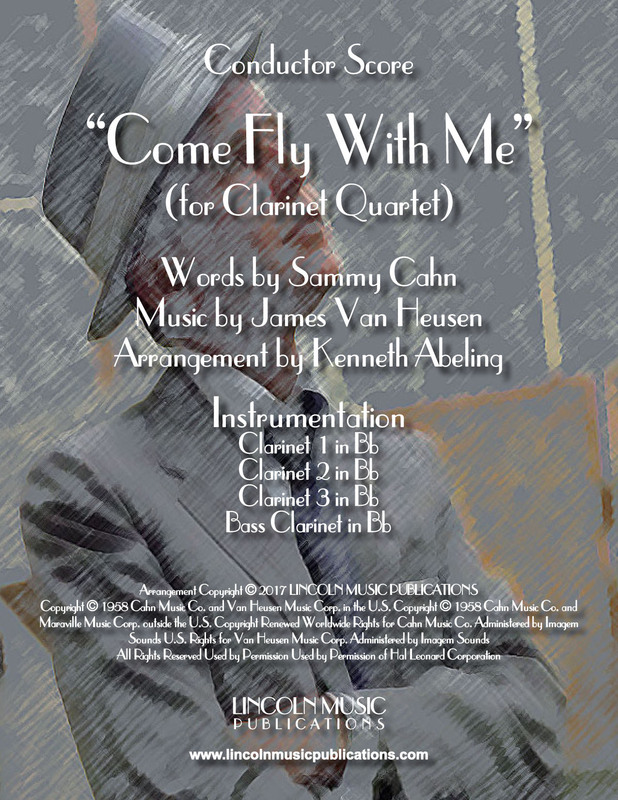 “Come Fly With Me” Words & Music by Sammy Cahn & James Van Heusen and arranged here for Clarinet Quartet. This is an intermediate to advanced intermediate level arrangement of a jazz standard. 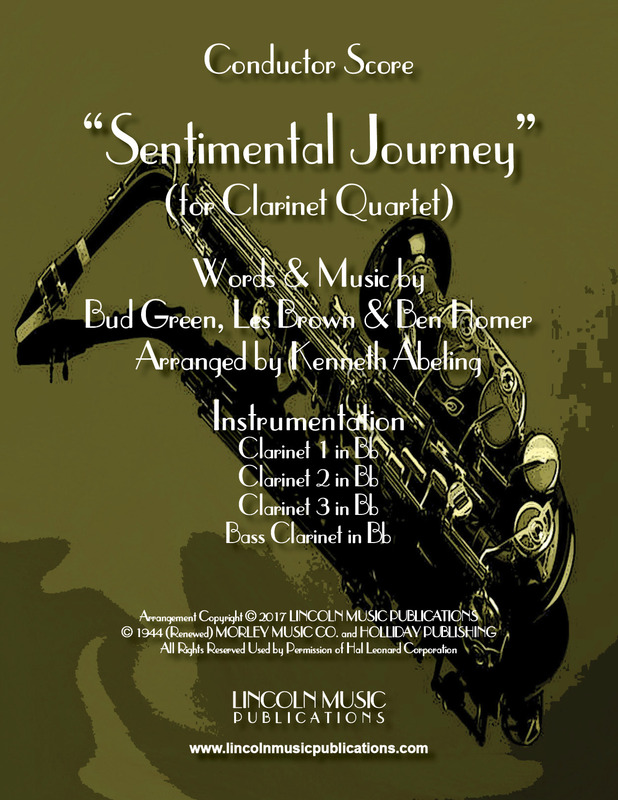 “Sentimental Journey”, Words and Music by Bud Green, Les Brown and Ben Homer, arranged for Clarinet Quartet. This is a delightful intermediate level arrangement of a Jazz / Show Tune staple. 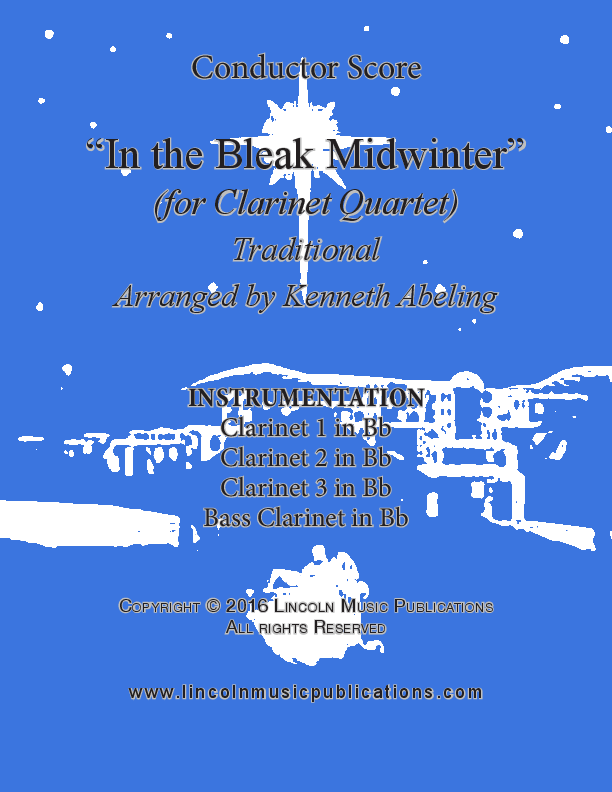 “Mele Kalikimaka”, Words and Music by R. Alex Anderson, arranged here for Clarinet Quartet. This is the very popular Hawaiian Christmas song made popular by Bing Crosby and featured as “bed music” in several Hollywood movies as well. This is an intermediate level arrangement. 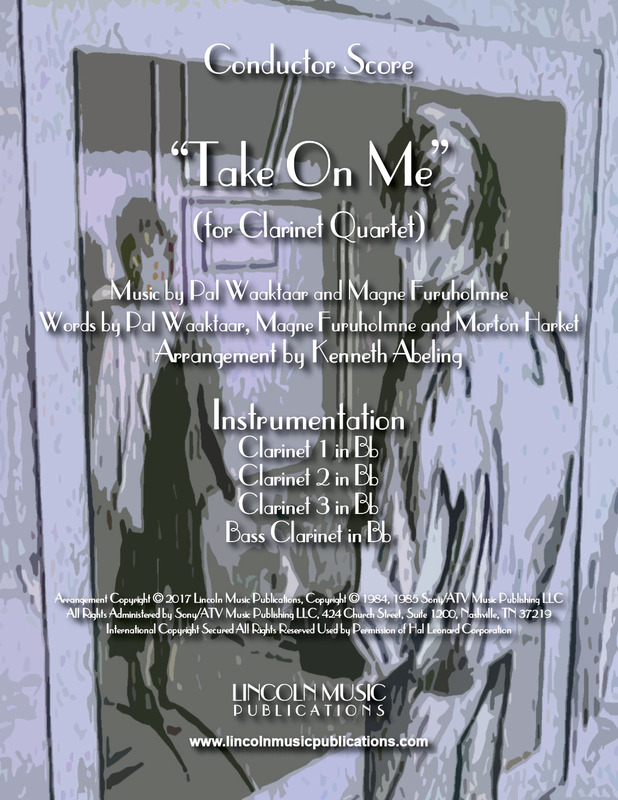 “Take On Me”, Music by Waaktaar and Magne Furuholmne and Words by Waaktaar, Furuholmne and Harket arranged here for Clarinet Quartet. 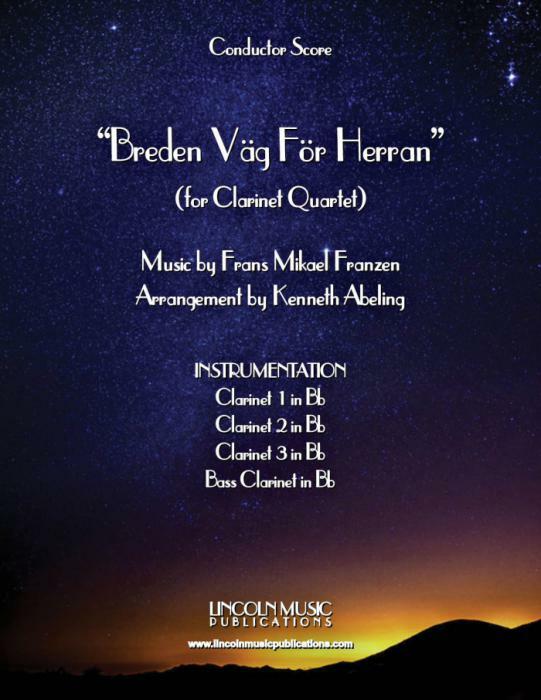 This is an intermediate to advanced arrangement depending on the ensemble of the still very popular song created and made popular by the Norwegian Band a-ha. 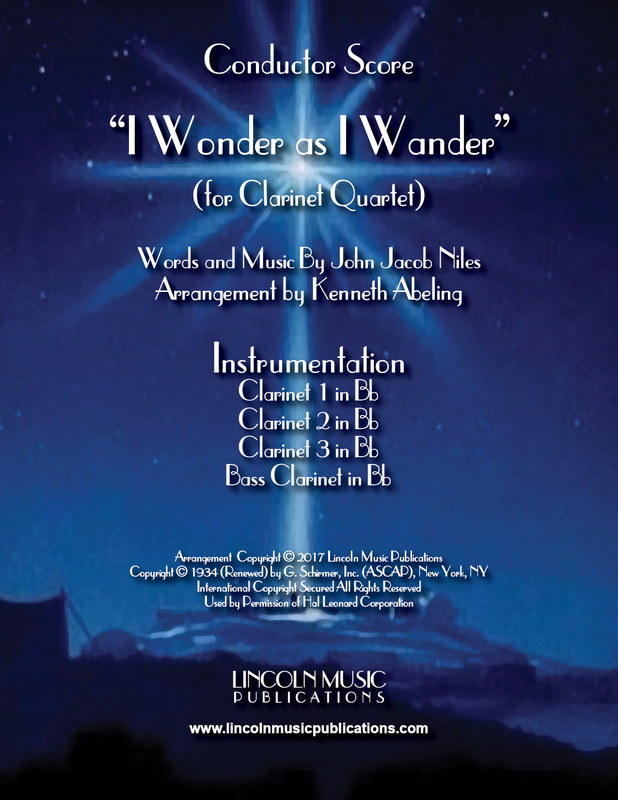 “I Wonder as I Wander” by John Jacob Niles arranged here for Clarinet Quartet is Christmas time favorite. This is an Intermediate to advanced intermediate arrangement with a different harmonic take. 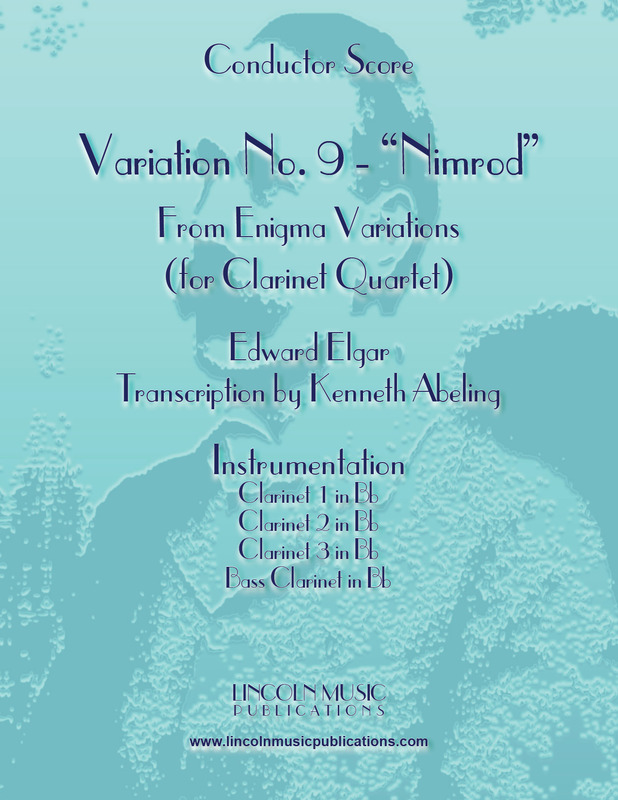 No.9 - “Nimrod” from Edward Elgar’s Enigma Variations transcribed here for Clarinet Quartet. 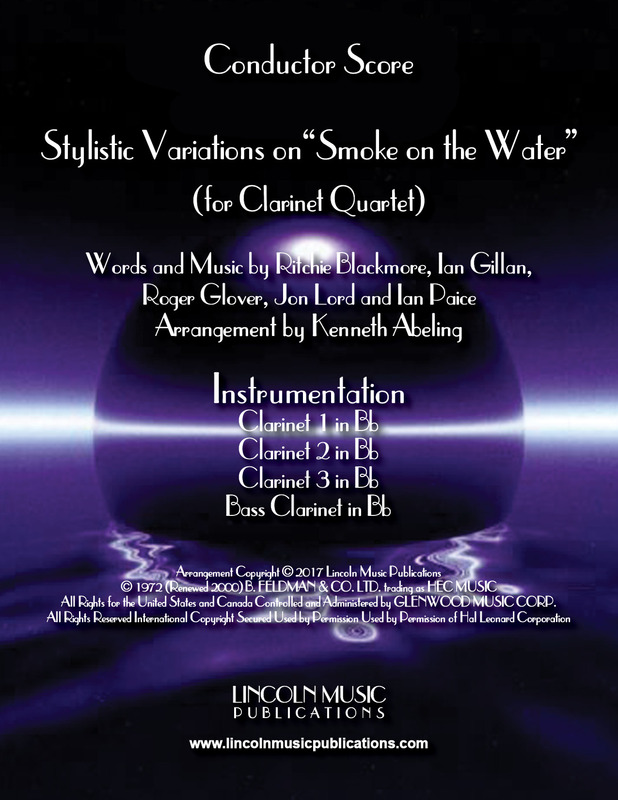 This is an easy to intermediate level arrangement of Elgar’s most popular variation from the Enigma variations. 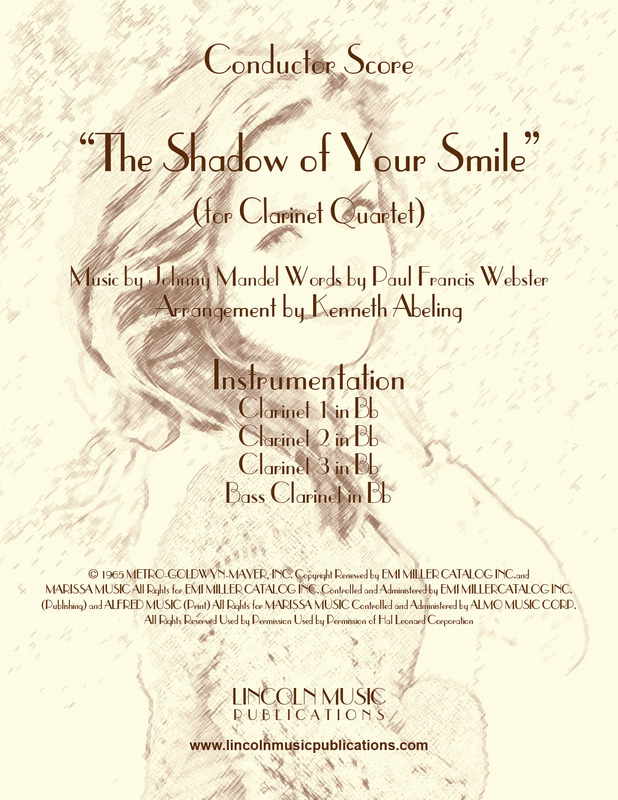 “The Shadow of Your Smile”, Words by Paul Francis Webster and Music by Johnny Mandel arranged for Clarinet Quartet. This charming song was first introduced in the 1965 film “The Sandpiper” and won the Grammy Award for Song of the Year as well as the Academy Award for Best Original Song. 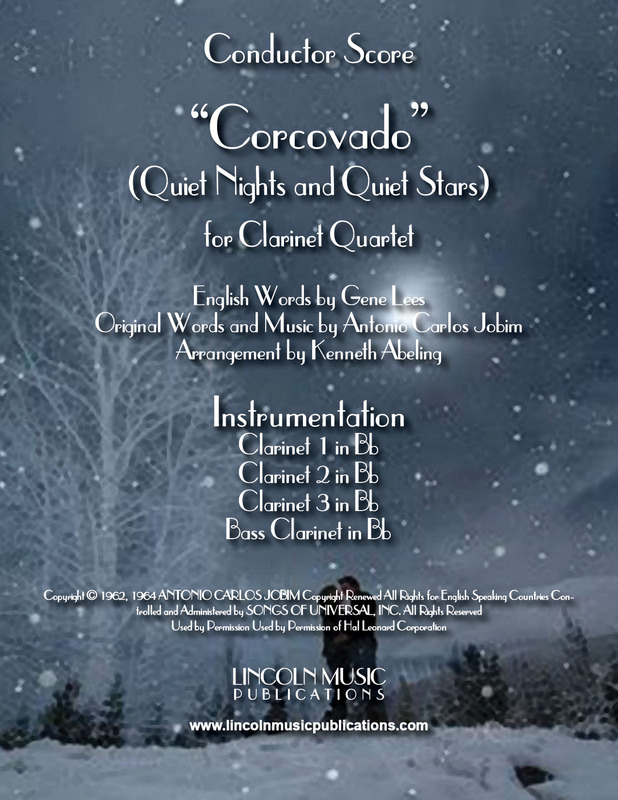 “Quiet Nights and Quiet Stars” or “Corcovado”, (its Spanish title), Words & Music by Antonio Carlos Jobim arranged here for Clarinet Quartet. This is an Intermediate to advanced intermediate arrangement of Jobim’s romantic Latin Jazz standard. 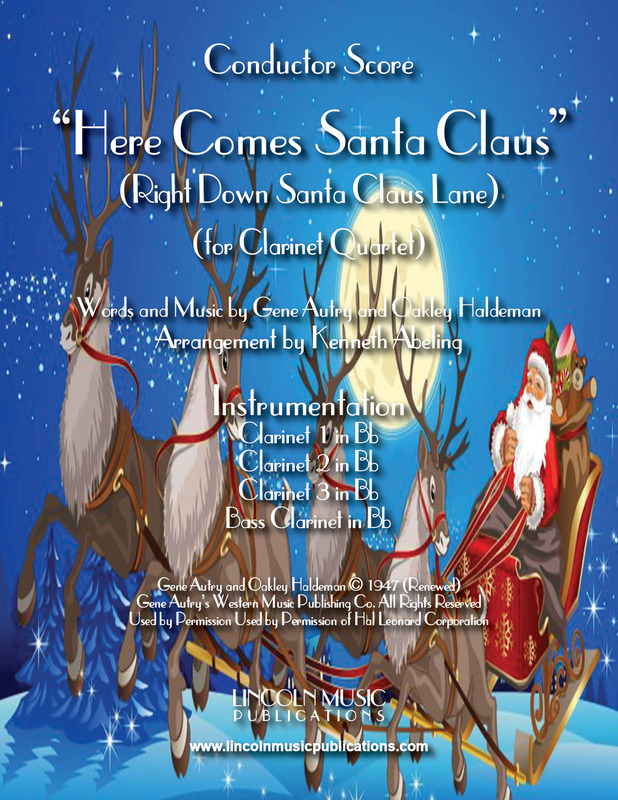 "Here Comes Santa Claus" (Right Down Santa Claus Lane) Words and Music by Gene Autry & Oakley Haldeman arranged here for Brass Quartet. This is a Jazzy little advanced intermediate arrangement of another Christmas time favorite. 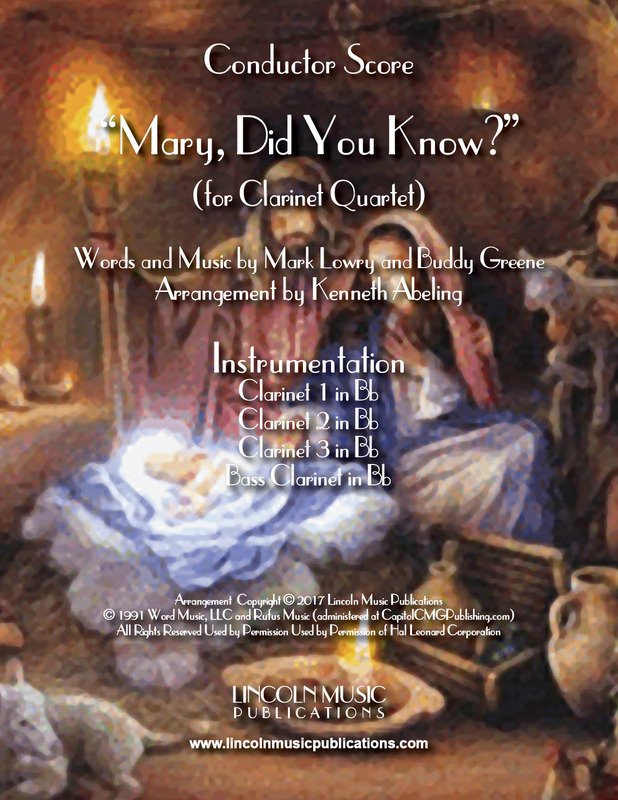 “Mary, Did You Know?”, Words and Music by Mark Lowery & Buddy Greene and arranged here for Clarinet Quartet. 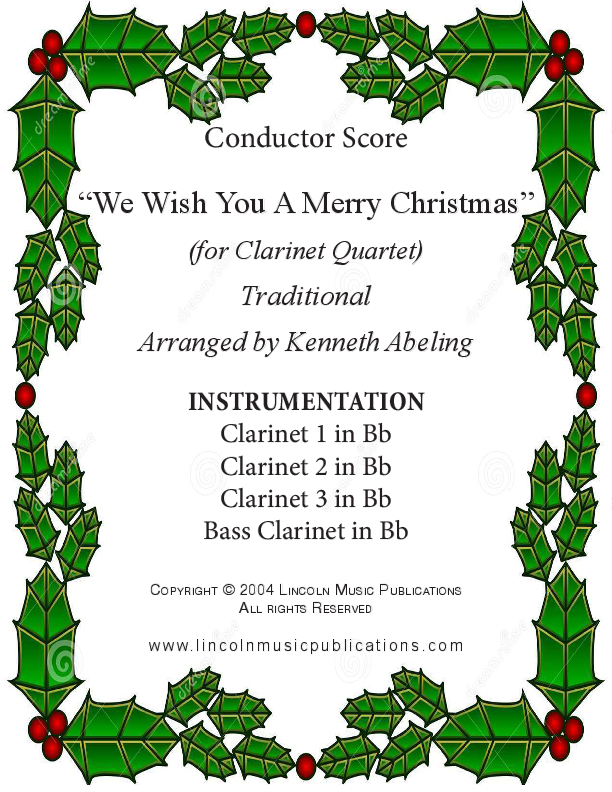 This is an Intermediate to advanced intermediate arrangement of a more modern Christmas standard and suitable for sacred Christmas performances as well as secular settings. 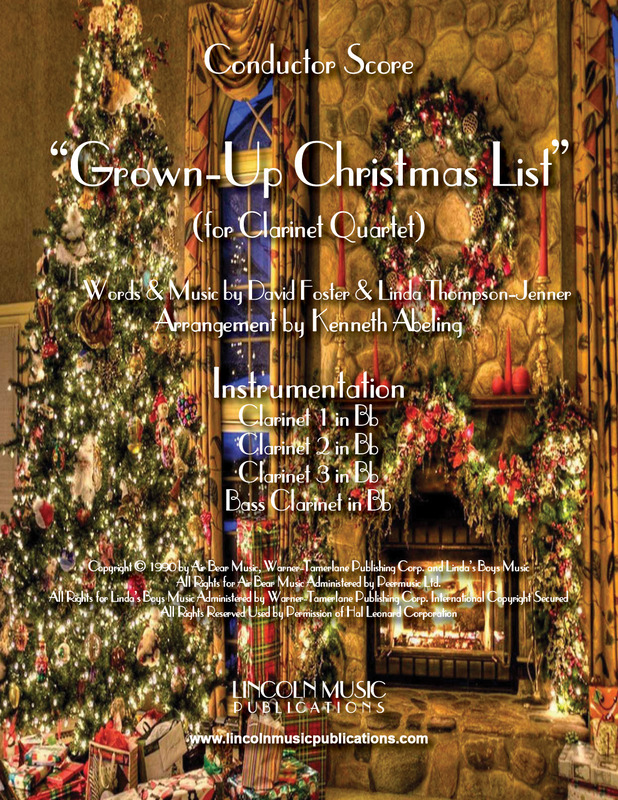 “Grown-Up Christmas List”, Word and Music by David Foster & Linda Thompson-Jenner arranged here for Clarinet Quartet. 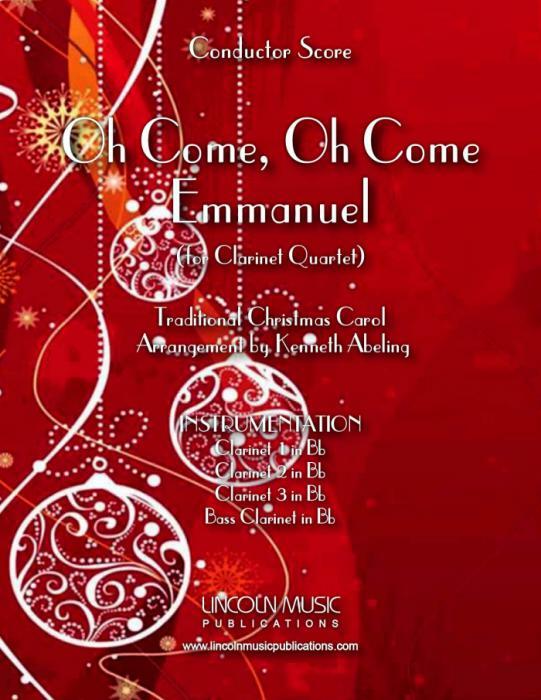 This is an intermediate level arrangement of a very beautiful Christmas song. 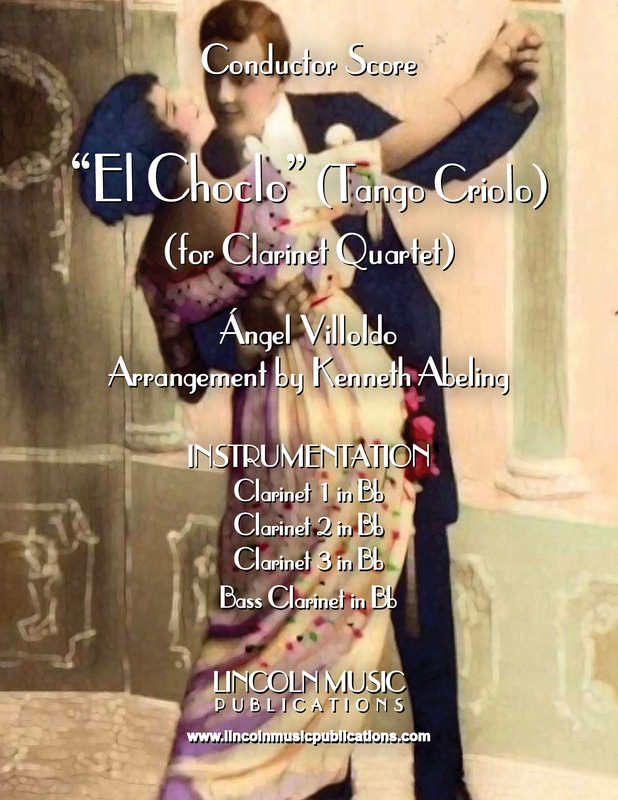 “El Choclo” (Tango Criolo) is a very popular Argentinian tango written by Angel Villoldo and arranged here Clarinet Quartet. This is an advanced intermediate to easy advanced arrangement, gives every member a chance to shine and a lot of fun to play! 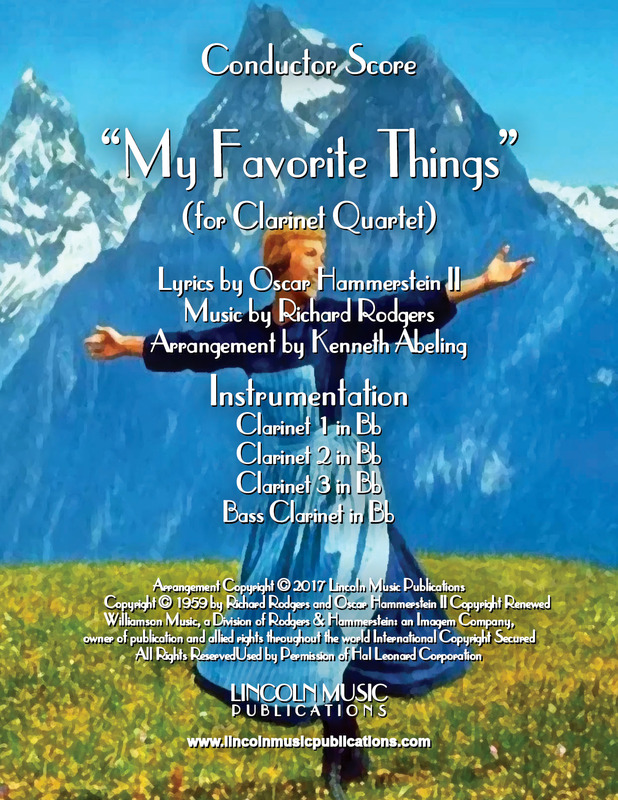 “My Favorite Things” arranged here for Clarinet Quartet. 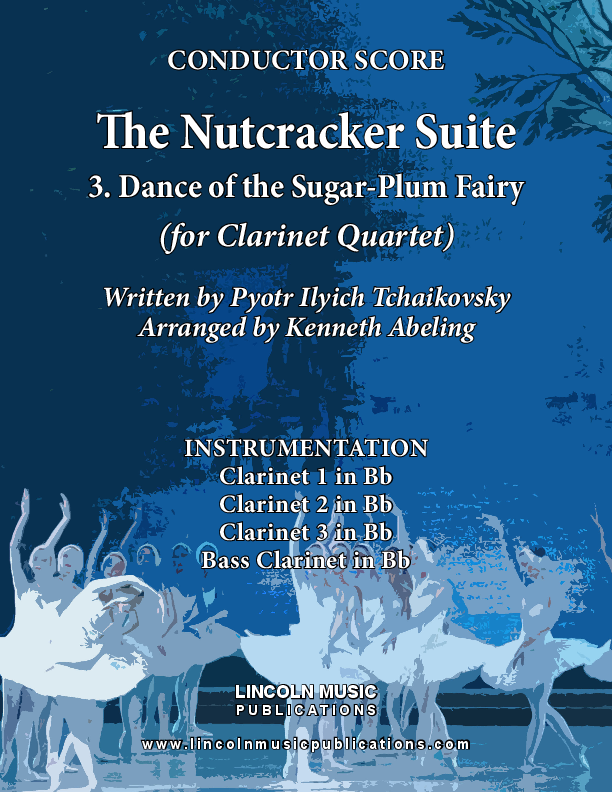 This is an advanced intermediate to advanced level arrangement of Richard Rodgers and Oscar Hammerstein’s timeless classic from The Sound of Music. 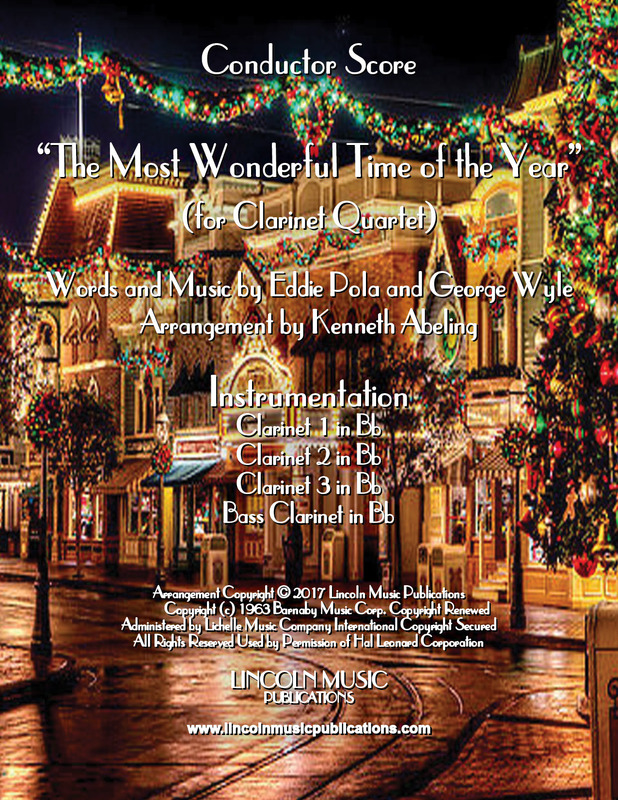 “The Most Wonderful Time of the Year”, Words and Music by Eddie Pola and George Wyle arranged here for Clarinet Quartet. 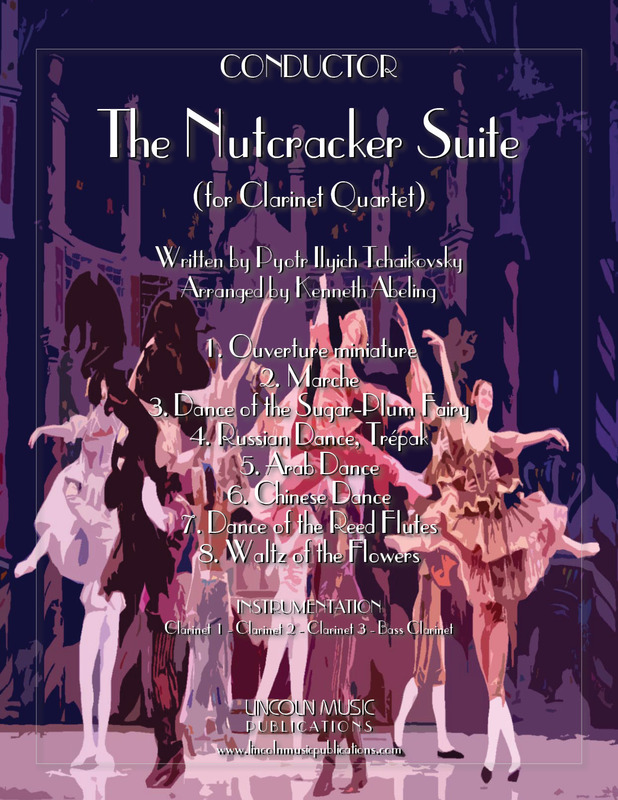 This is an advanced intermediate to easy advanced arrangement of another Christmas time favorite in a jazz waltz style. 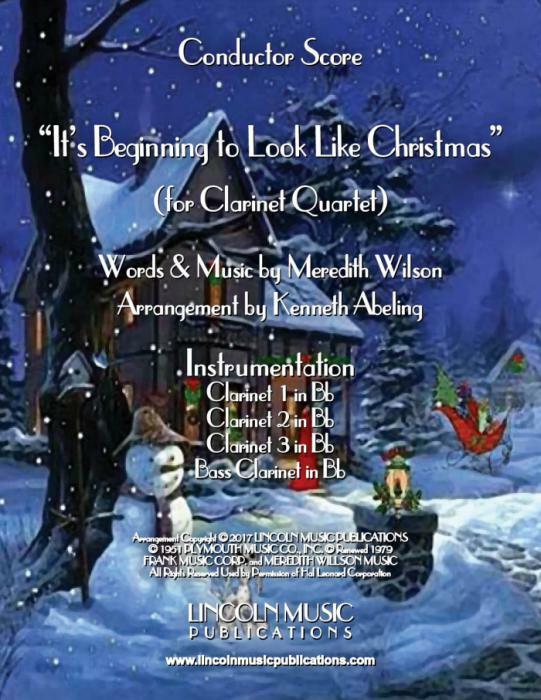 “It’s Beginning to Look Like Christmas” or “It’s Beginning to Look a Lot Like Christmas”, Words and Music by Meredith Wilson arranged here for Clarinet Quartet. This is an advanced intermediate to easy advanced arrangement of another Christmas time favorite. 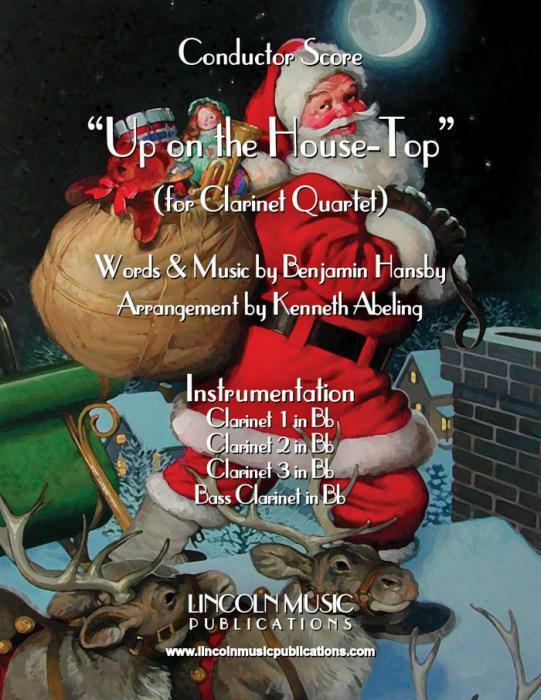 “Up on the House-Top & Variations”, Words and Music by Benjamin Hansby arranged here for Clarinet Quartet. This is an advanced intermediate to easy advanced arrangement of another Christmas time favorite in a theme and variations format. 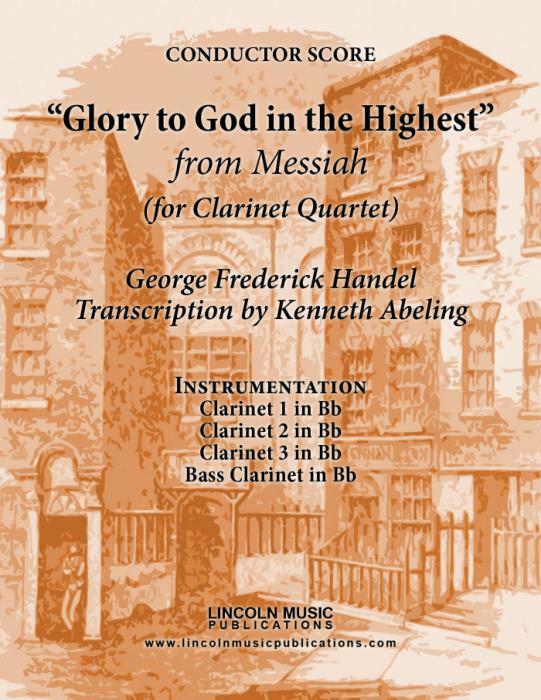 This is “Glory to God in the Highest” from George Fredrick Handel’s Messiah, transcribed here for Clarinet Quartet. This is an advanced intermediate to easy advanced transcription from Part I of Handel’s Messiah and appropriate for sacred Christmas events. 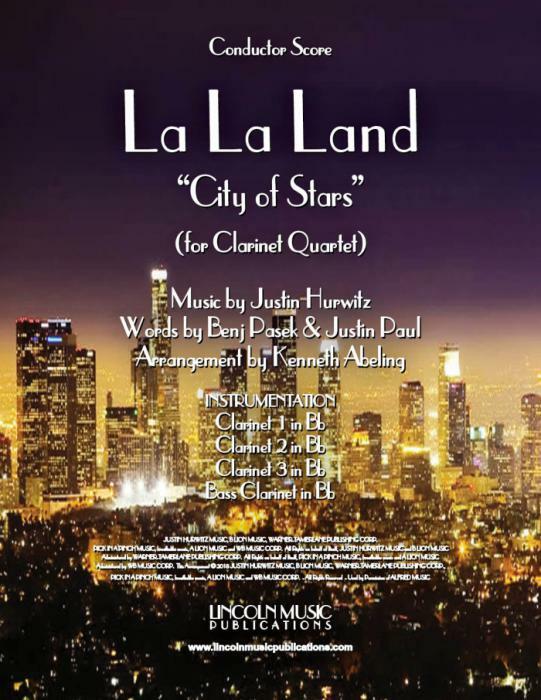 “Mia & Sebastian’s” Theme” from La La Land, Music by Justin Hurwitz arranged for Clarinet Quartet. 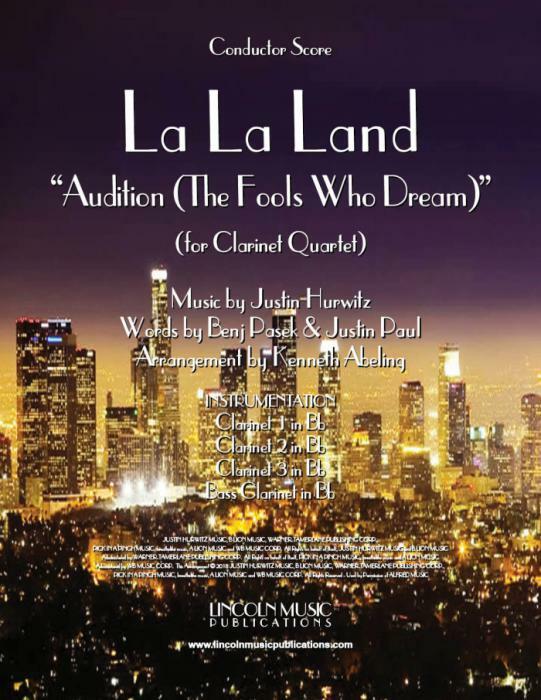 This is an advanced intermediate to easy advanced level arrangement of a multi-award winning, modern day movie musical classic! 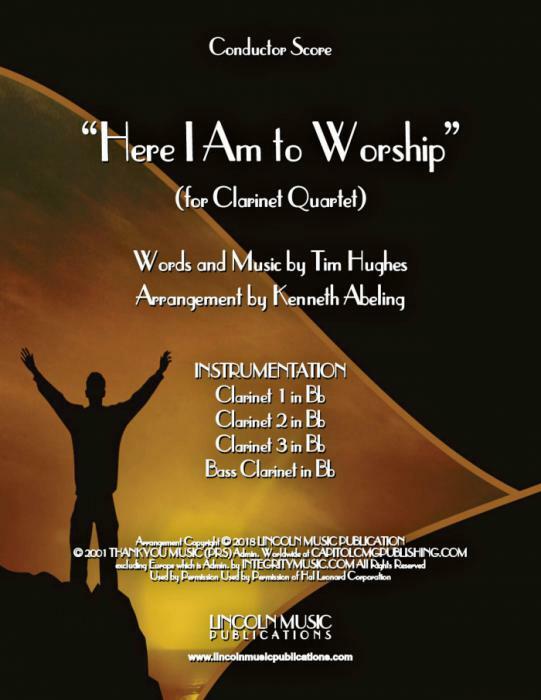 “Here I Am to Worship” – Words & Music by Tim Hughes arranged for Clarinet Quartet. 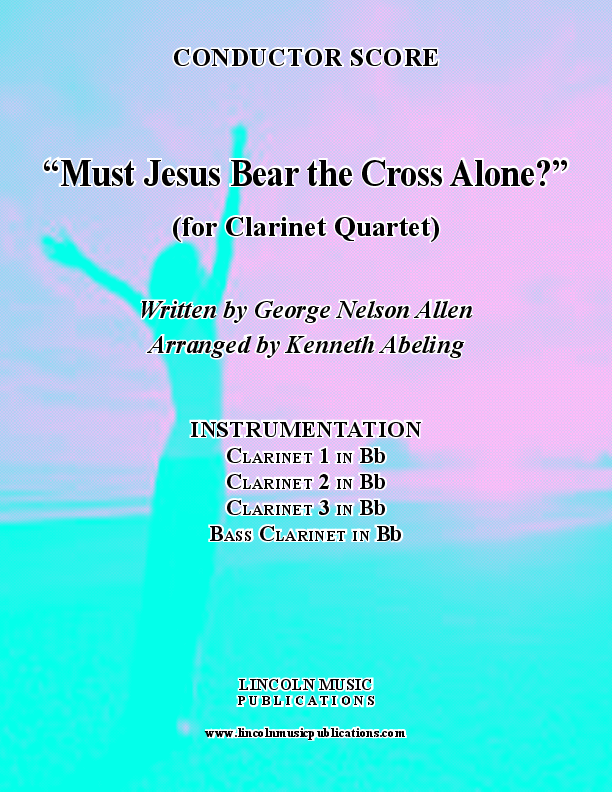 This is an Advanced Intermediate level arrangement of Hughes’ very popular worship ballad and fitting for traditional and contemporary religious services. 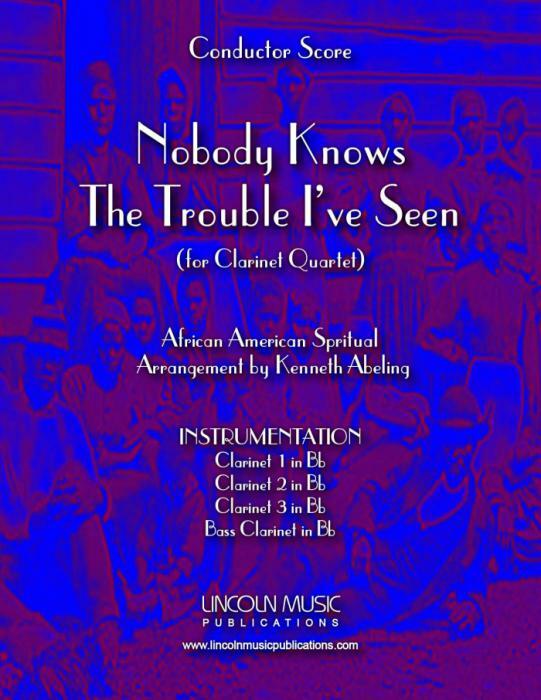 “Don’t Get Around Much Anymore”, Words by Bob Russell Music by Duke Ellington for Clarinet Quartet. This is an advanced ?level arrangement of a classic jazz standard. 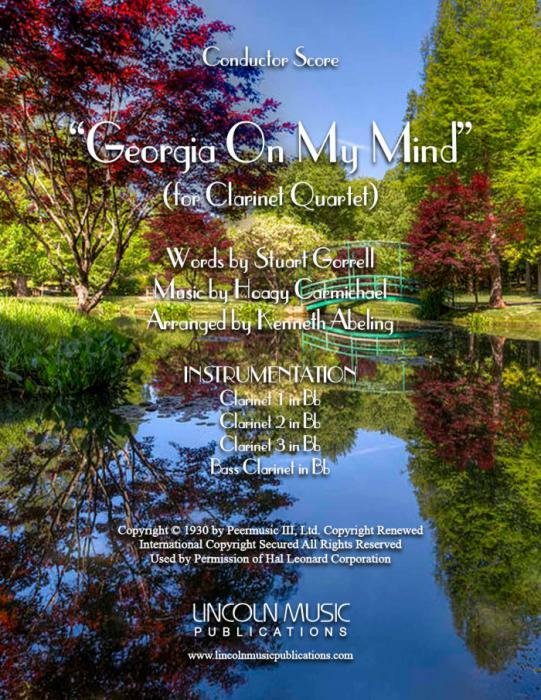 “Georgia on My Mind”, Words by Stuart Gorrell & Music by Hoagy Carmichael for Clarinet Quartet. This is an easier advanced to advanced arrangement of Hoagy Carmichael’s tribute to his home state. While there are some challenging sections, the tempo and the way it lays should make it accessible to many ensembles. 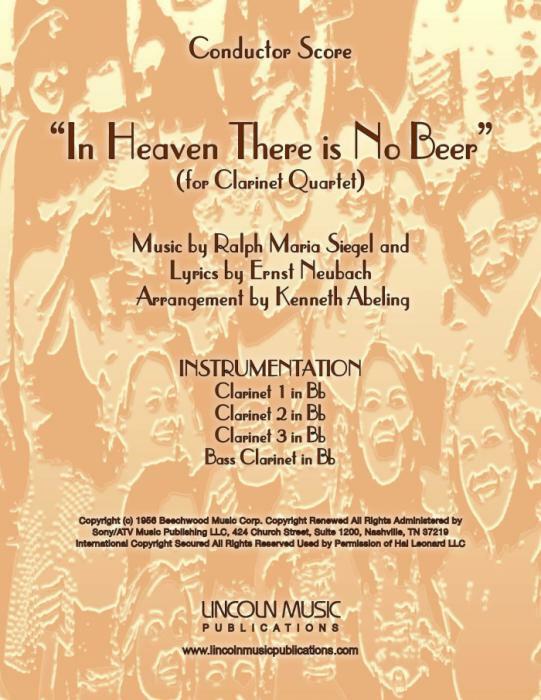 “In Heaven There is No Beer”, Music by Ralph Maria Siegel & Lyrics by Ernst Neubach for Clarinet Quartet, arr. Ken Abeling. This is an easier advanced arrangement of a Polka Classic. You cannot play an Oktoberfest gig without this chart! 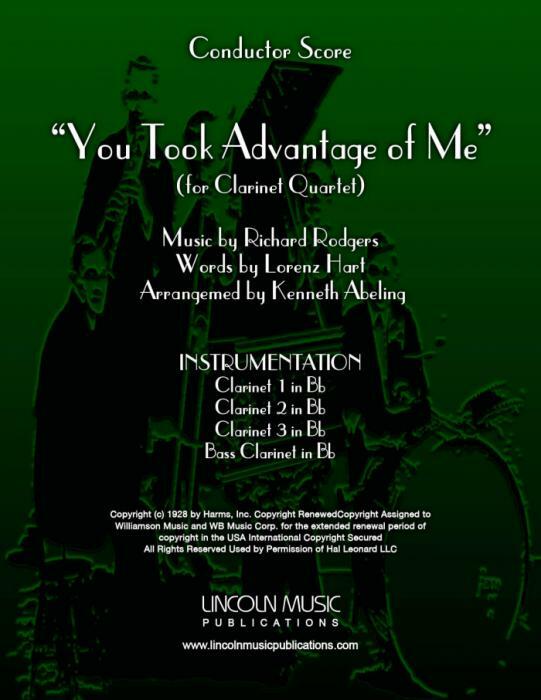 “You Took Advantage of Me”, Music by Richard Rogers & Lyrics by Lorenz Hart for Clarinet Quartet, arr. Ken Abeling. 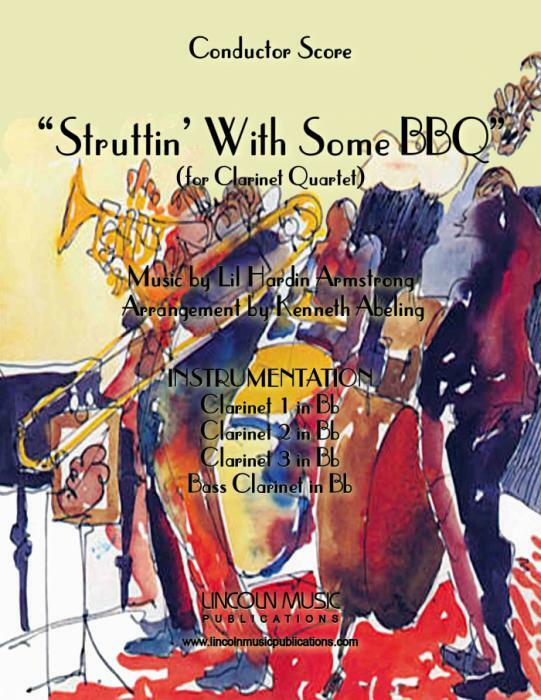 This is an advanced arrangement of an all time Show Tune turned Dixieland favorite that will showcase your entire ensemble. 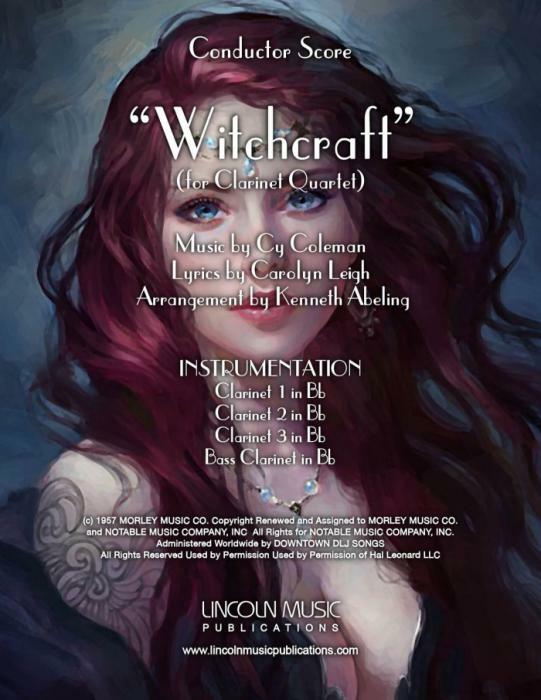 “Witchcraft”, Music by Cy Coleman & Lyrics by Carolyn Leigh for Clarinet Quartet, arr. Ken Abeling. This is a more advanced arrangement of another Frank Sinatra staple. Sketched in the same “Opus” as “Lullaby of Birdland”, if you liked that chart, you will like this one as well! 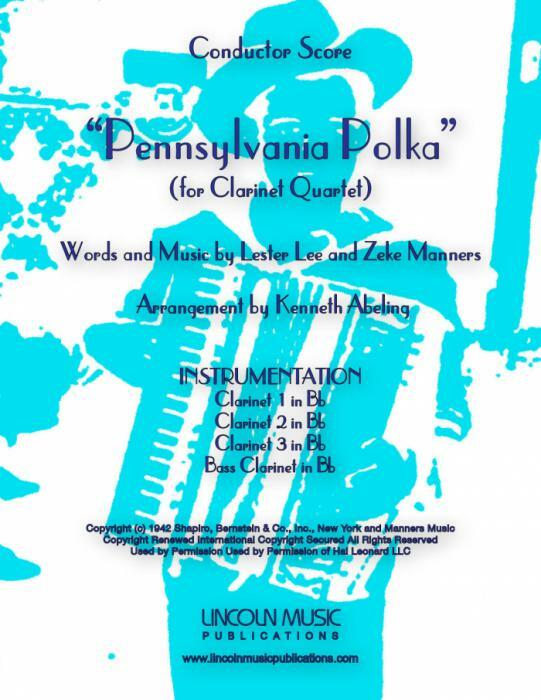 “Pennsylvania Polka”, Music & Lyrics by Words and Music by Lester Lee and Zeke Manners for Clarinet Quartet, arr. Ken Abeling. This is a great polka featured in the movie “Groundhog Day” and suitable for many occasions especially Oktoberfest type performances. 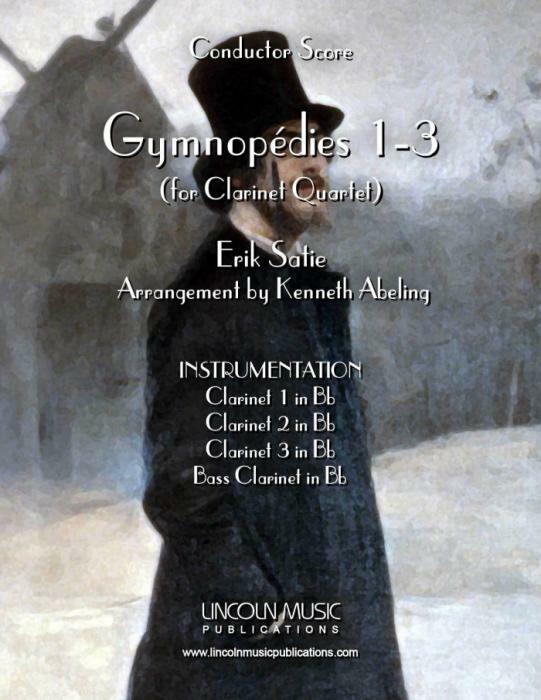 It is a more advanced arrangement to play “as is” but simplified alternatives are provided for some passages and your ensemble director ought to be able to help one in need easily simplify any solo passages if necessary. 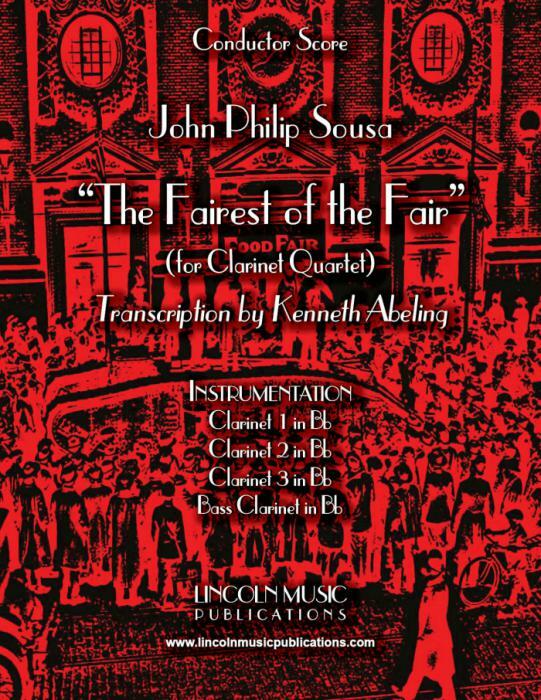 “The Fairest of the Fair”, here for Clarinet Quartet, is one of John Philip Sousa’s perhaps lesser played but certainly one of his best marches. 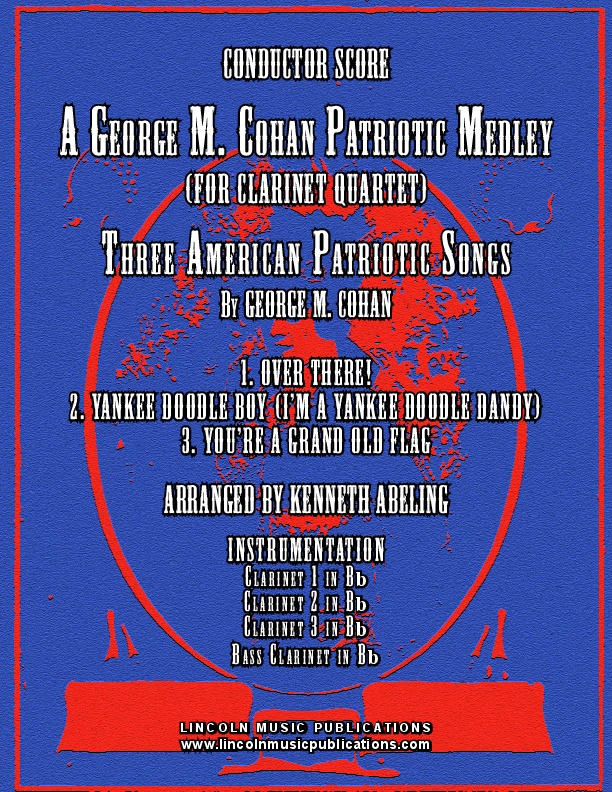 This arrangement is an advanced intermediate to easy advanced level of difficulty and perfect for Patriotic ceremonies and events. 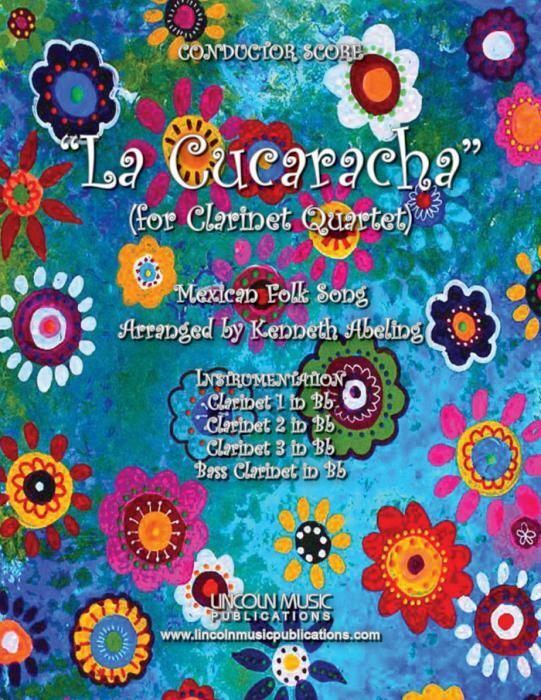 “I Want a Little Girl”, Words and Music by Murray Mencher and Billy Moll for Clarinet Quartet, arr. Ken Abeling. 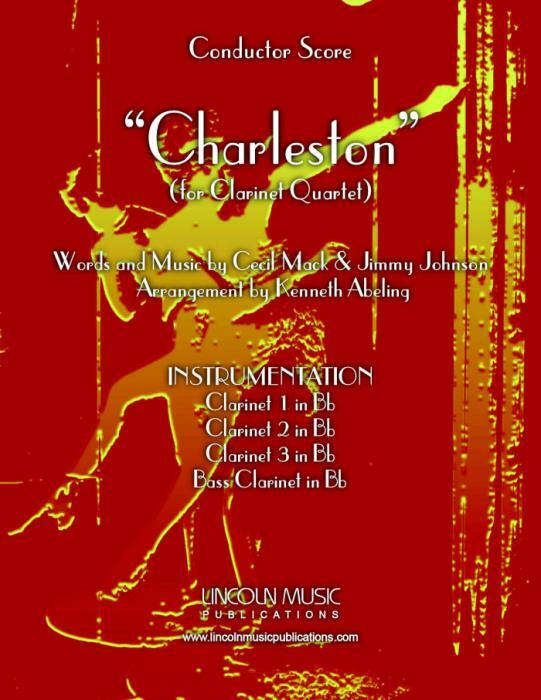 This is an easier advanced to advanced Dixieland arrangement of an old Vaudeville favorite. 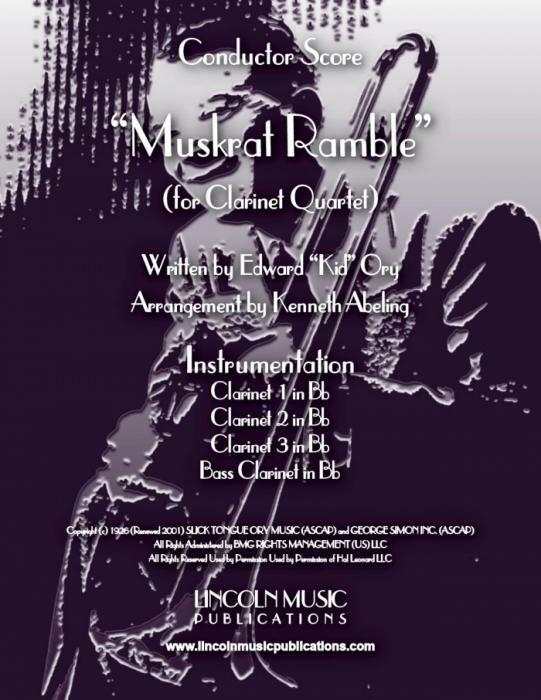 “Muskrat Ramble”, Music by Edward “Kid” Ory for Clarinet Quartet, arr. 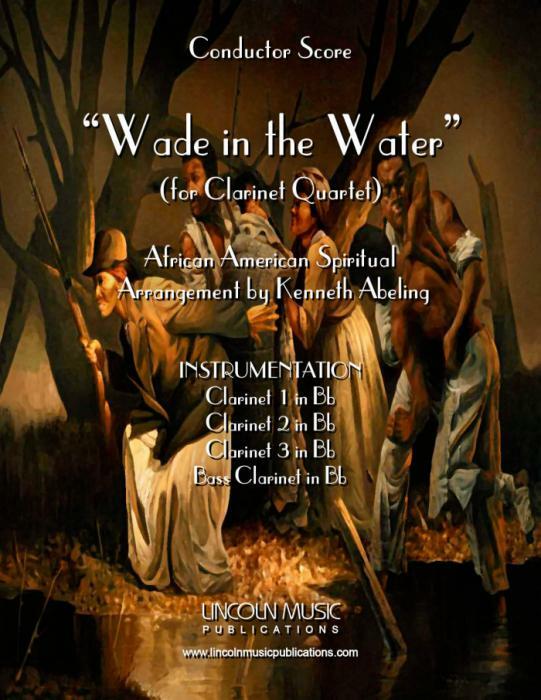 Ken Abeling. This is a rather advanced arrangement of a chart you will find on anyone’s list of top ten best Dixieland songs ever written! 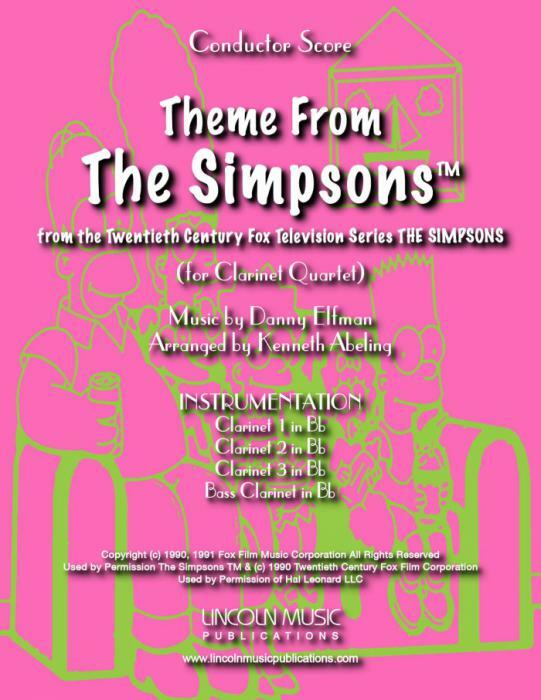 Theme from The Simpsons by Danny Elfman, arranged by Kenneth Abeling for Clarinet Quartet. 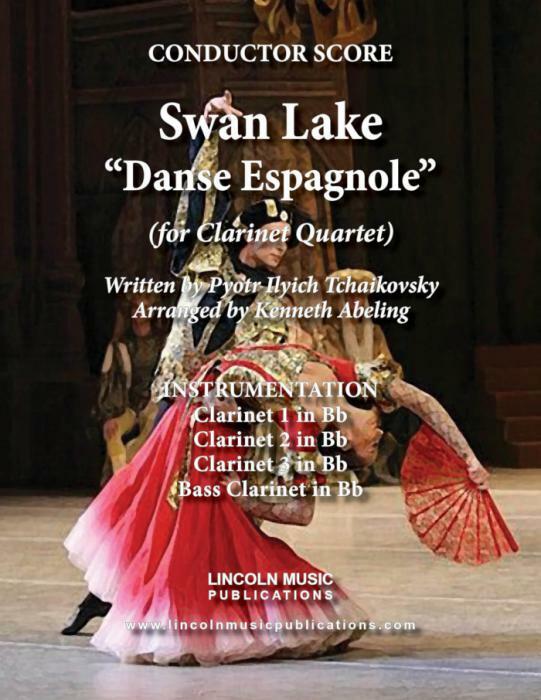 This is an advanced arrangement but an upper ossia staff with a simplification of the more difficult passages has been provided to make it accessible to less experienced players. This is based on one of the earlier versions of the theme to this enduring Cartoon legend. 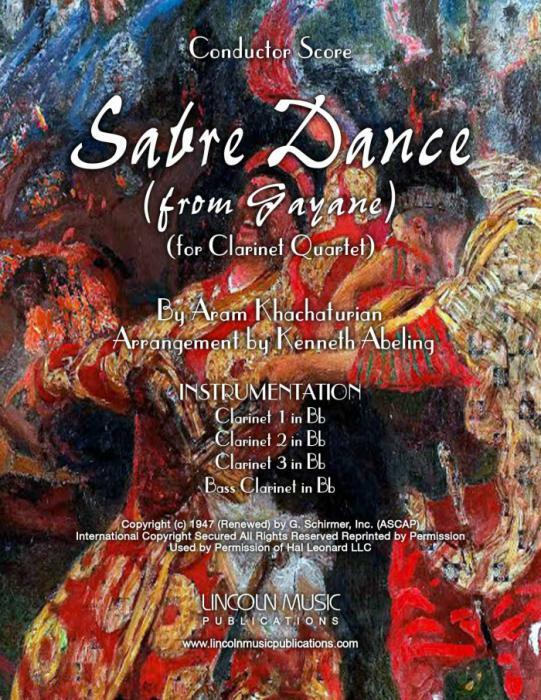 Sabre Dance from the Ballet “Gayane” or “Gayanah” by Aram Khachaturian arranged here for Clarinet Quartet by Kenneth Abeling. 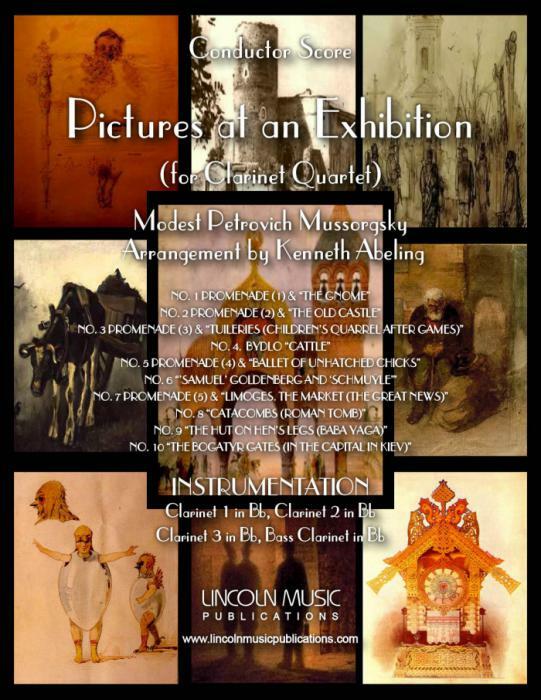 This is an easier advanced arrangement of one Khachaturian’s most memorable and recognizable works. 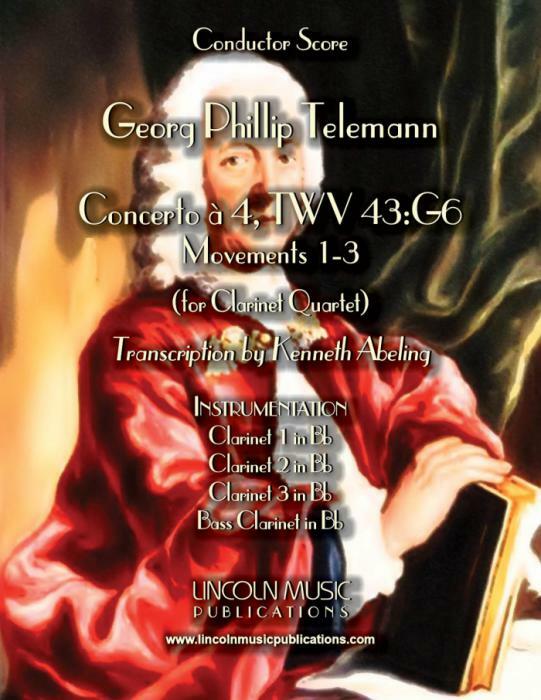 Concerto à 4, TWV 43:G6 by Georg Philipp Telemann. 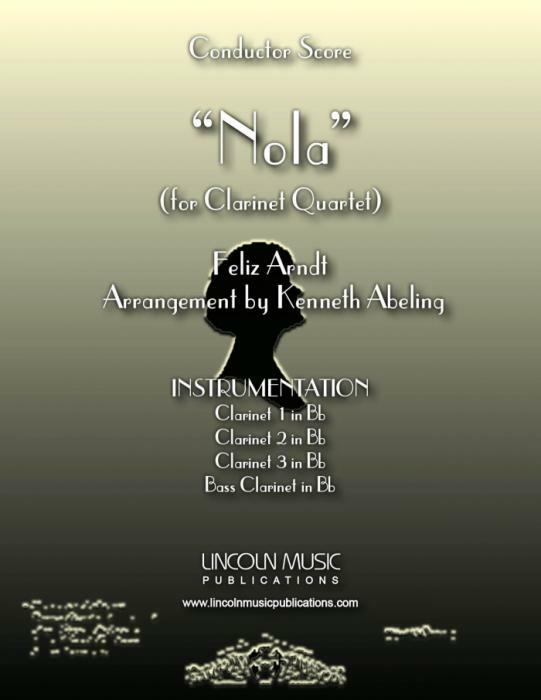 Originally written for Recorder, Oboe, Violin and Continuo (Basso) and transcribed here for Clarinet Quartet (with optional Organ) by Kenneth Abeling. 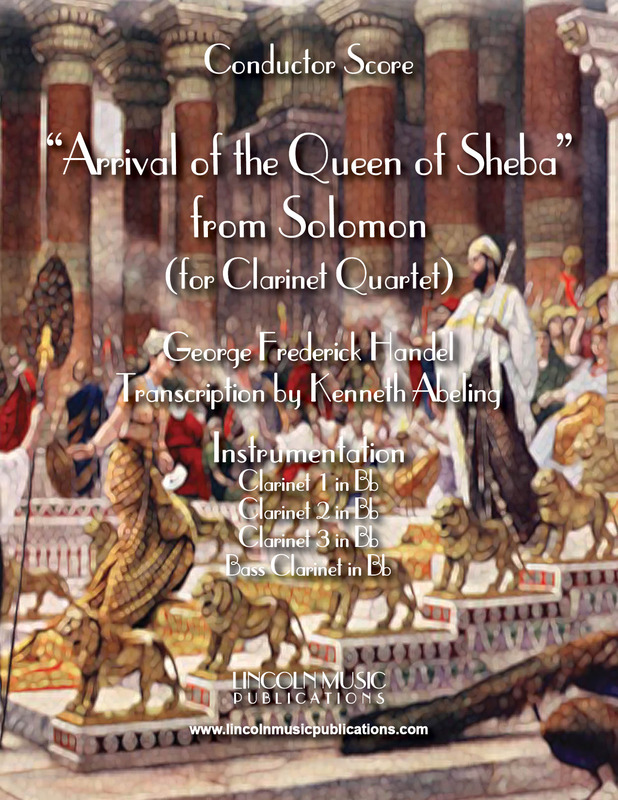 This is an easier advanced level composition and suitable for both secular and sacred performances. Please note that the Organ part is optional! 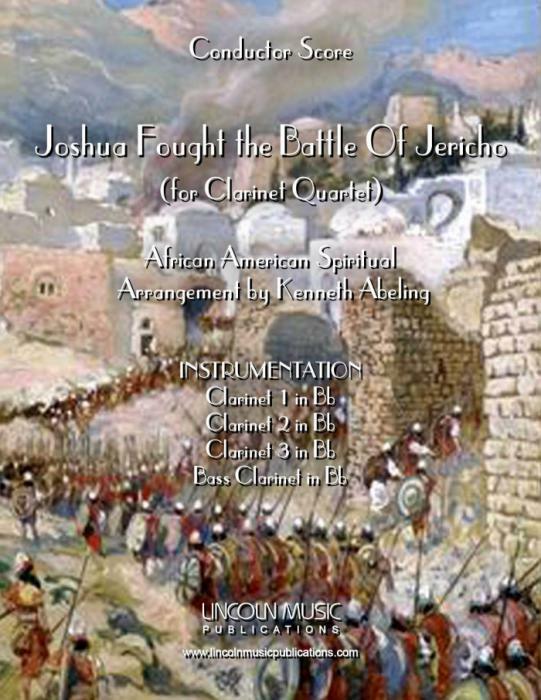 “Joshua Fought the Battle of Jericho” arranged for Clarinet Quartet by Kenneth Abeling. 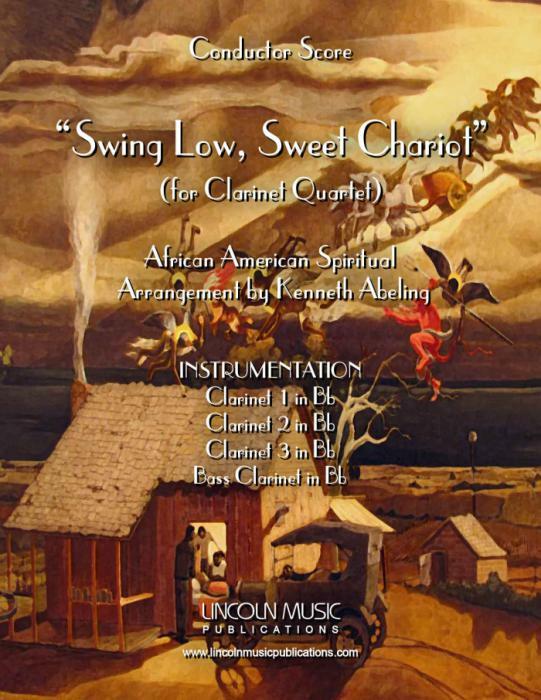 This is the final installment in a series of popular African American Spirituals. 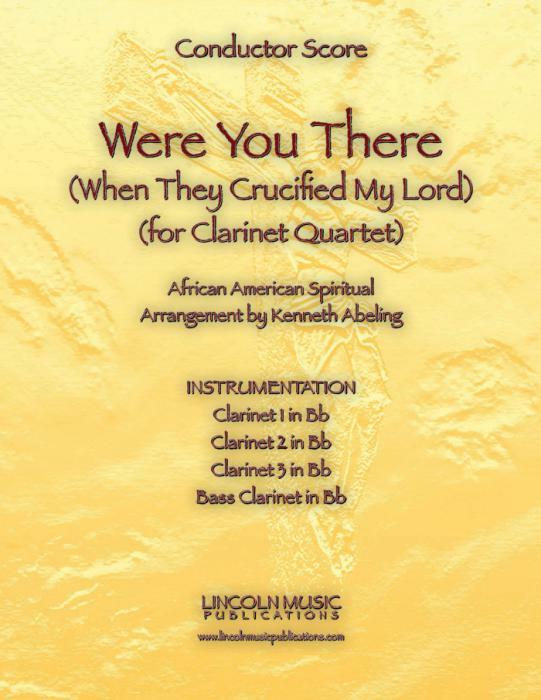 It is an Intermediate level arrangement and is appropriate for all religious services and Black History events. 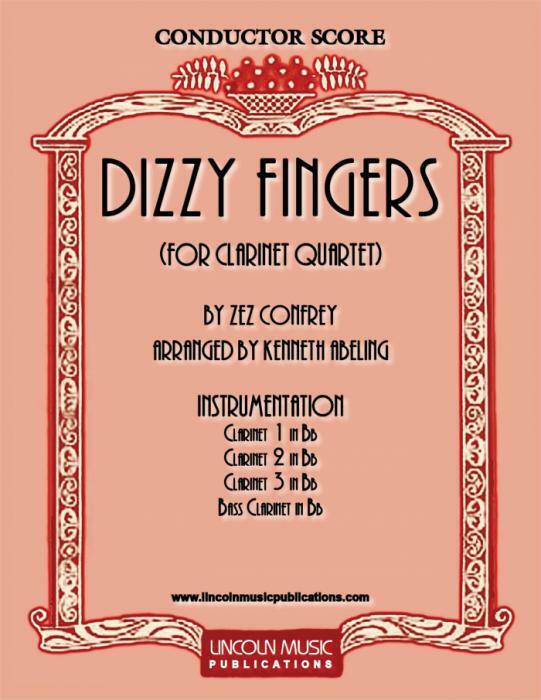 “Dizzy Fingers” by Zez Confrey arranged here for Clarinet Quartet by Kenneth Abeling. This is an advanced arrangement of a memorable and widely popular Novelty Rag. It is both charming and challenging! Playing Time 2:45. 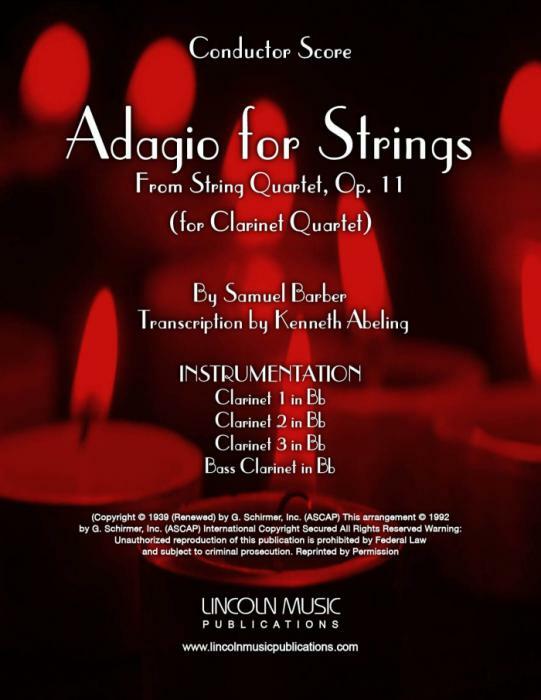 Adagio for Strings by Samuel Barber from String Quartet, Op.11 transcribed here for Clarinet Quartet by Kenneth Abeling. 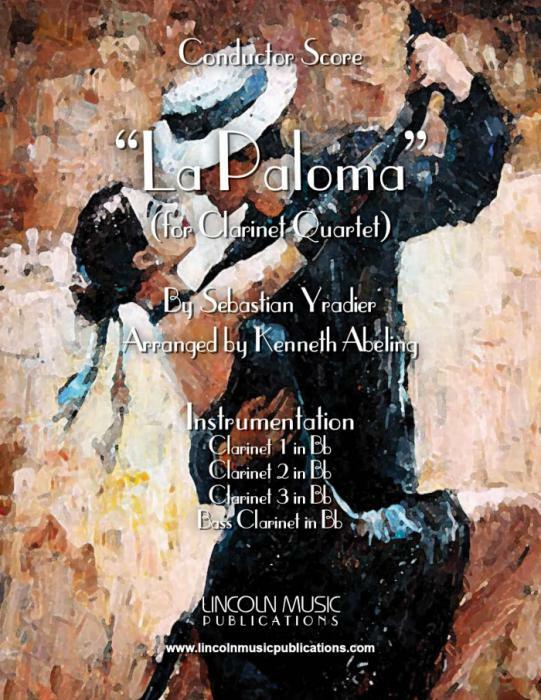 Arguably one of Samuel Barber’s best-known works, this piece has been used in several Movies and TV Shows, perhaps most notably the 1986 Academy Award Winning movie “Platoon”. 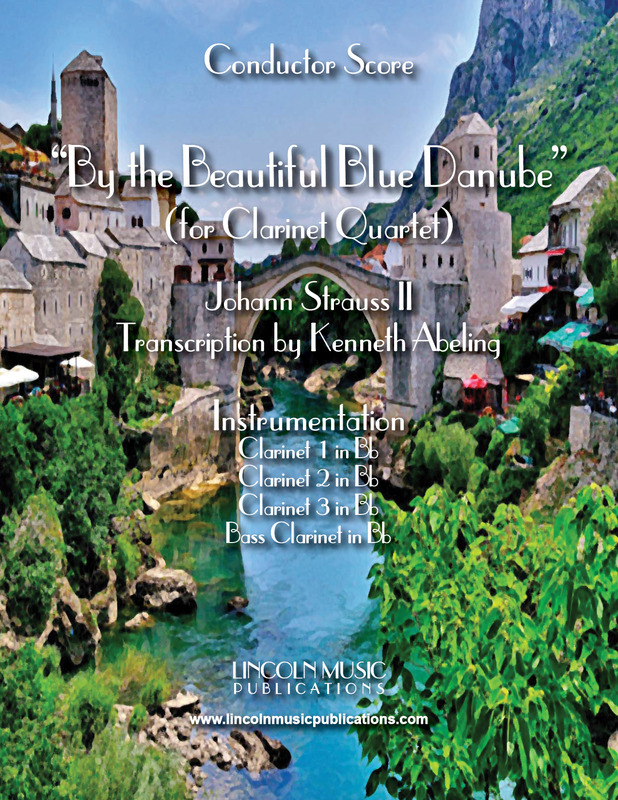 This beautiful but mournful piece is suitable for general performance, Worship Services, Funerals or other sad and reflective events. While not technically difficult, it is emotionally exhaustive to play. Playing Time 6:10. 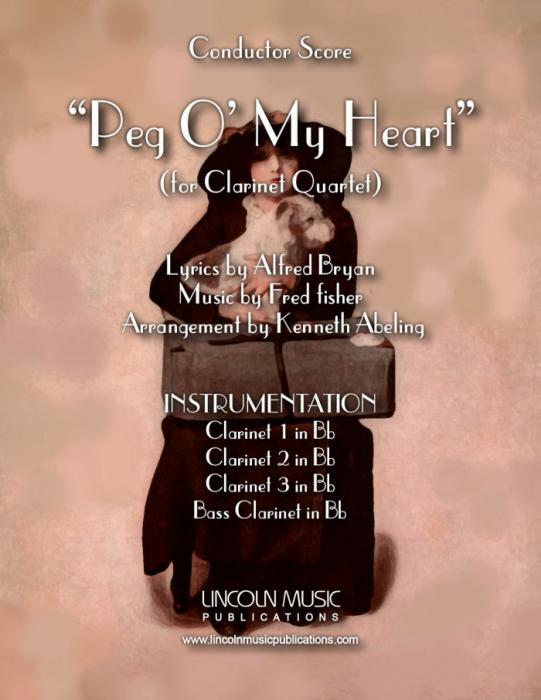 I’ve Found a New Baby, Music by Spencer Williams and Lyrics by Jack Palmer for Clarinet Quartet and arranged by Kenneth Abeling. 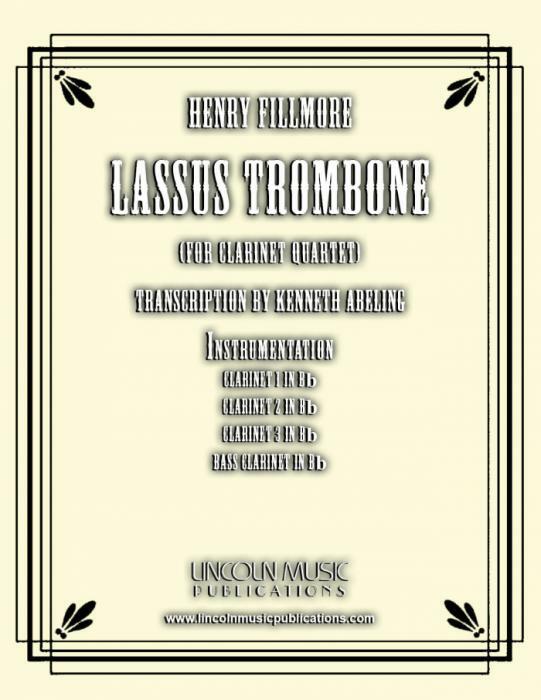 This is an advanced arrangement of one of the most popular Dixieland charts of all time and a must for your Dixieland library!! Playing Time 3:10. 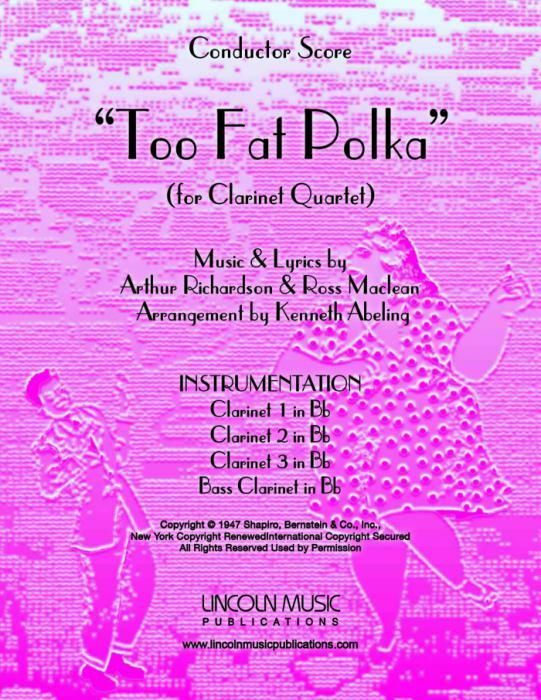 Too Fat Polka or “She’s / He’s Too Fat for Me” Music & Lyrics by Arthur Richardson and Ross Maclean arranged for Clarinet Quartet by Kenneth Abeling. 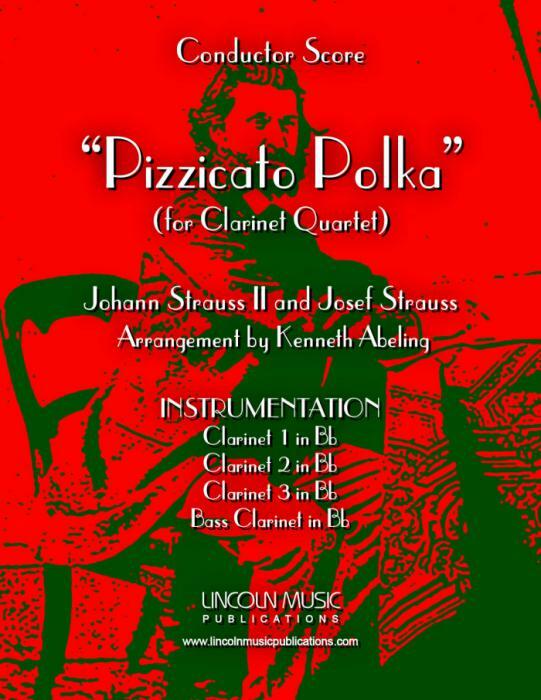 This is one of the most popular polkas of all time and suitable for many occasions especially Oktoberfest type performances. 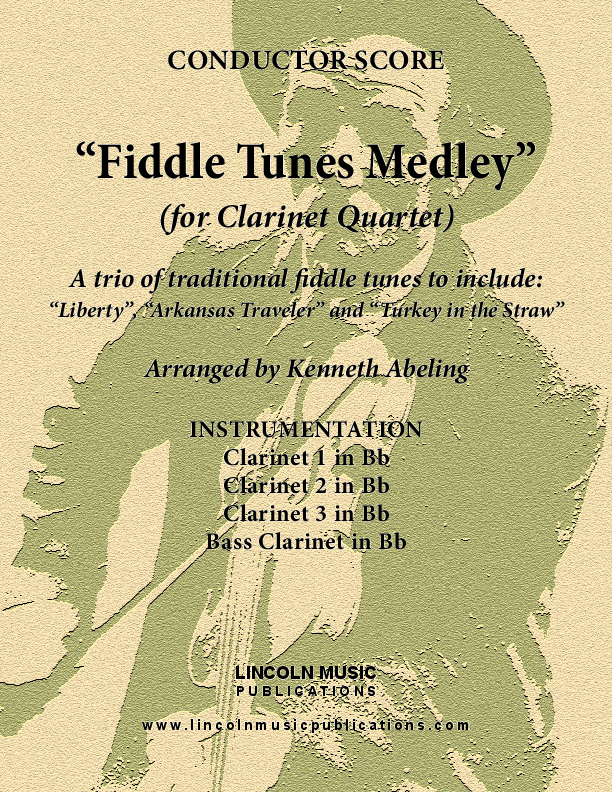 It is for the most part a moderate to perhaps moderately difficult arrangement, but some of the few solo lines might be considered a little tricky. 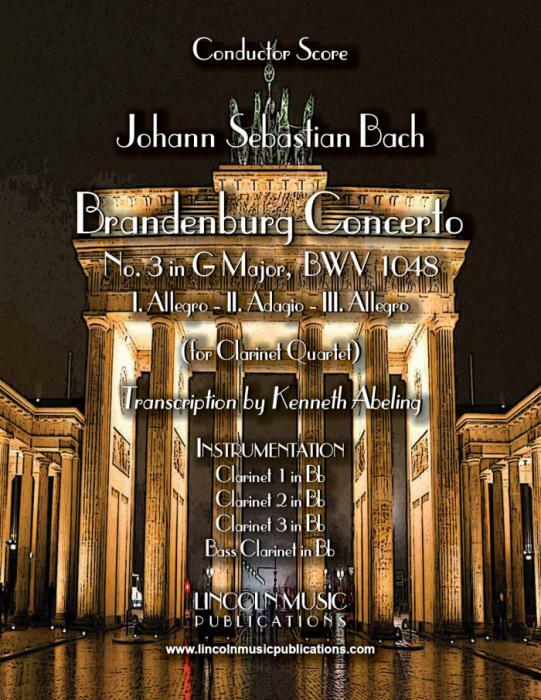 Your ensemble director should be able to simplify these passages if necessary… The playing time is approximately: 2:50. 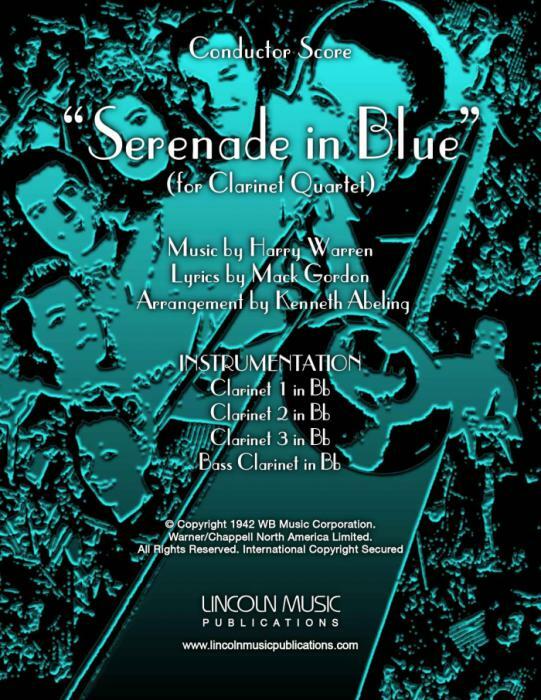 Serenade in Blue Music by Harry Warren with Lyrics by Mack Gordon for Clarinet Quartet and arranged by Kenneth Abeling. 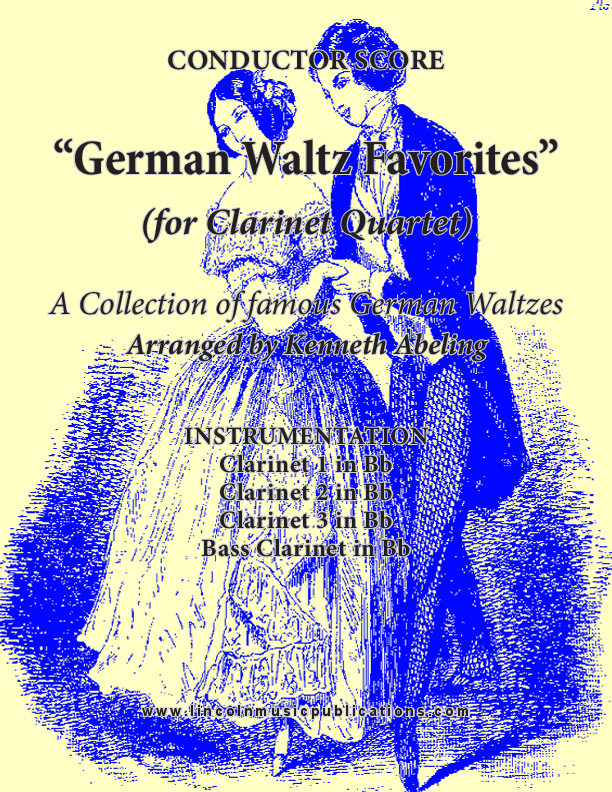 This is a moderate to moderately advanced arrangement of a tune first popularized by the Glenn Miller Orchestra (Big Band) and first featured in the movie “Orchestra Wives”. This is a classic tune and readily recognizable to anyone over the age of 40. A must ballad for your Jazz library!! Playing Time 3:20. 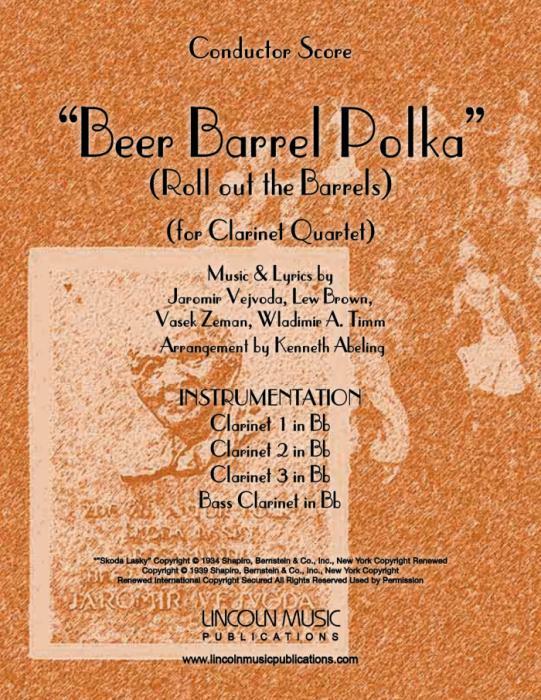 Beer Barrel Polka, Music & Lyrics by Jaromir Vejvoda, Lew Brown, Vasek Zeman, Wladimir A. Timm and arranged here for Clarinet Quartet by Kenneth Abeling. 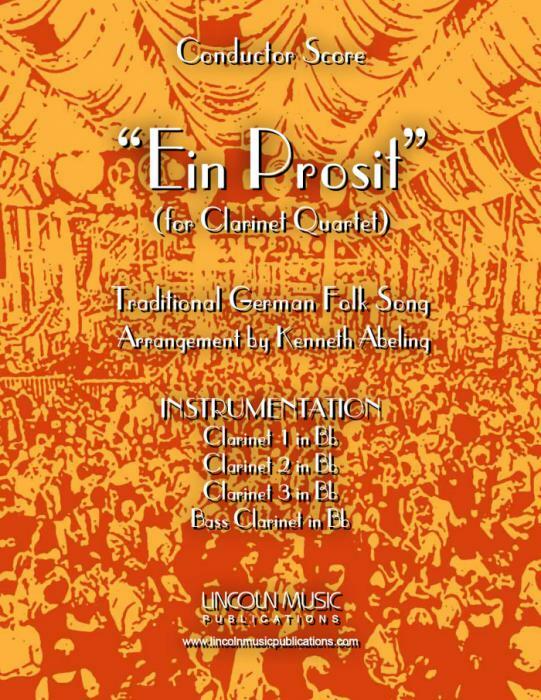 This is another one of the most popular polkas of all time and suitable for many occasions especially Oktoberfest type performances. 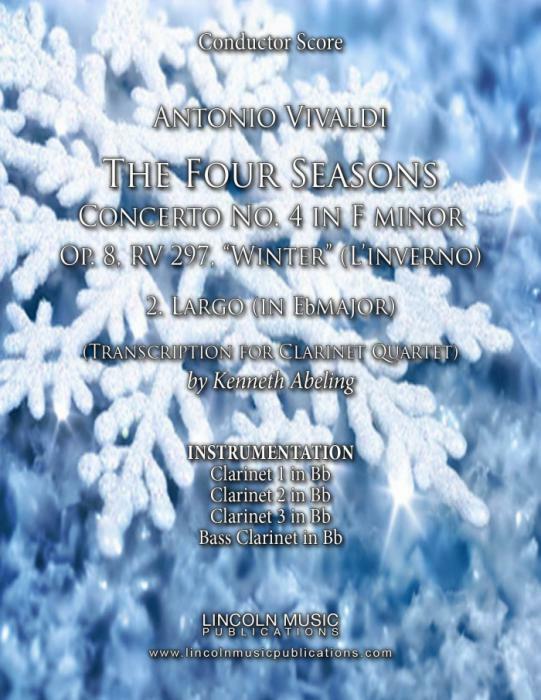 This is an intermediate level arrangement and useful to both Amateur and Professional ensembles. Playing time approximately 2:30. 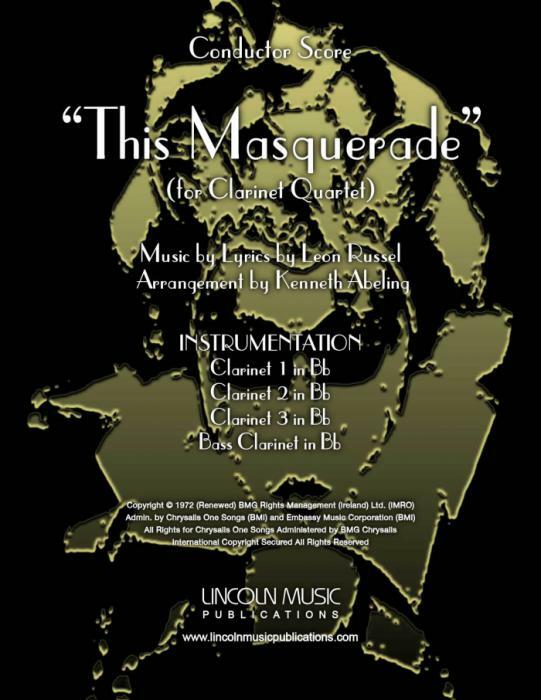 This Masquerade Words & Music by Leon Russell and arranged for Clarinet Quartet by Kenneth Abeling. This very beautiful song is one of Leon Russell's most popular of all time. It has been recorded by various artists over the years most notably George Benson. 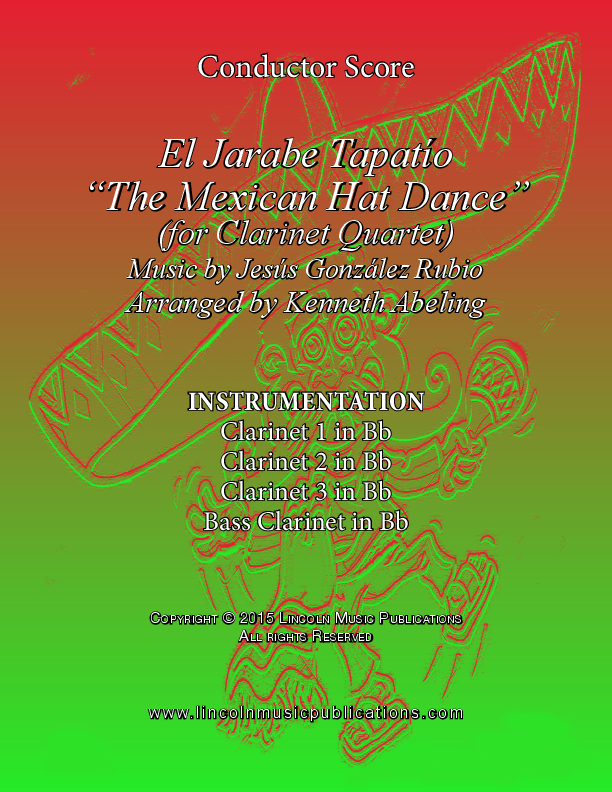 This is a Latin arrangement of the song and most ensembles will find it to be moderately difficult. Playing time 3:45. 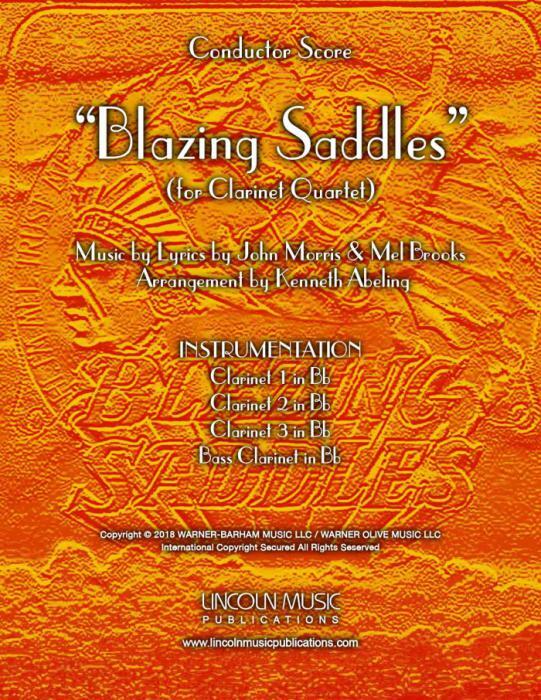 Blazing Saddles Music & Lyrics by John Morris and Mel Brooks and arranged for Clarinet Quartet by Kenneth Abeling. This is the theme song to the 1974 comedy classic and Oscar nominated satirical western film. While the melodies are somewhat simple, the repetitive background sixteenth notes can make it moderately difficult and a bit challenging. Playing time 1:50.